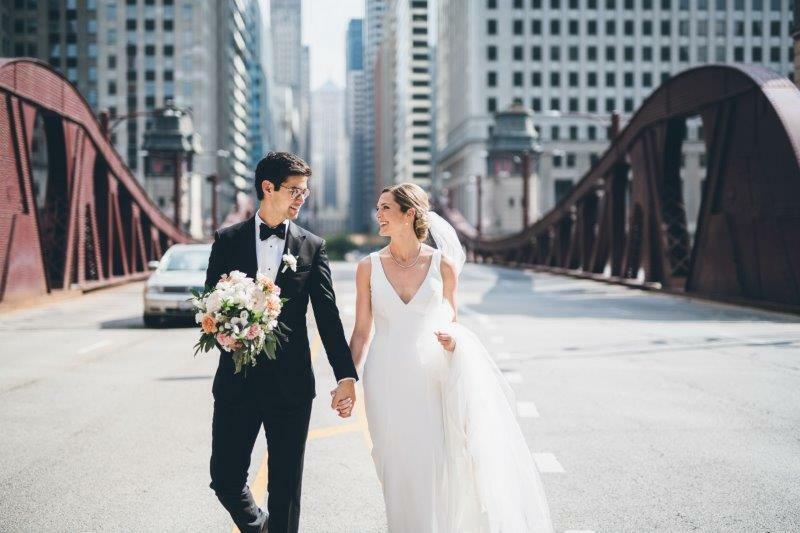 Chicago is a beauty, especially in the summer! 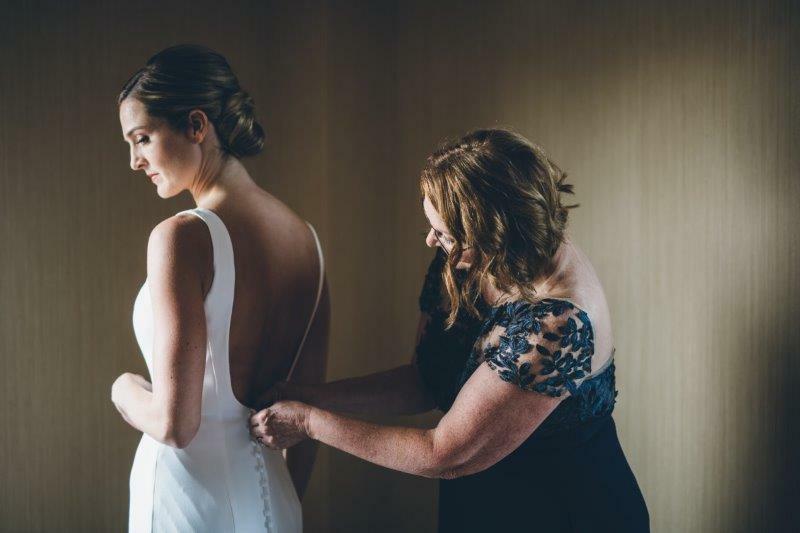 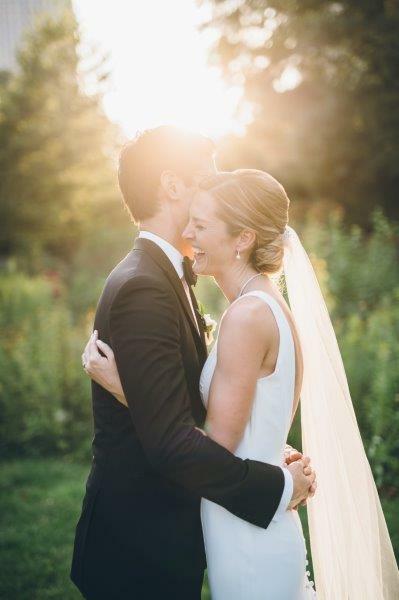 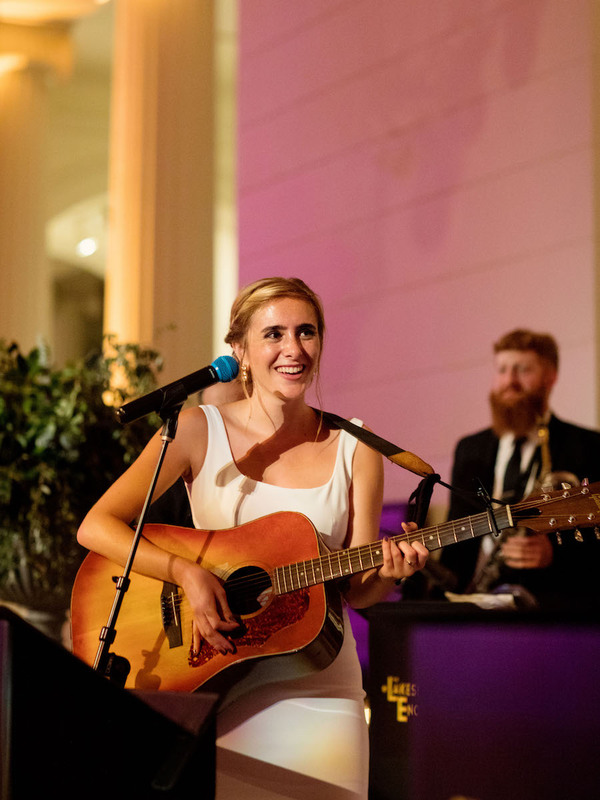 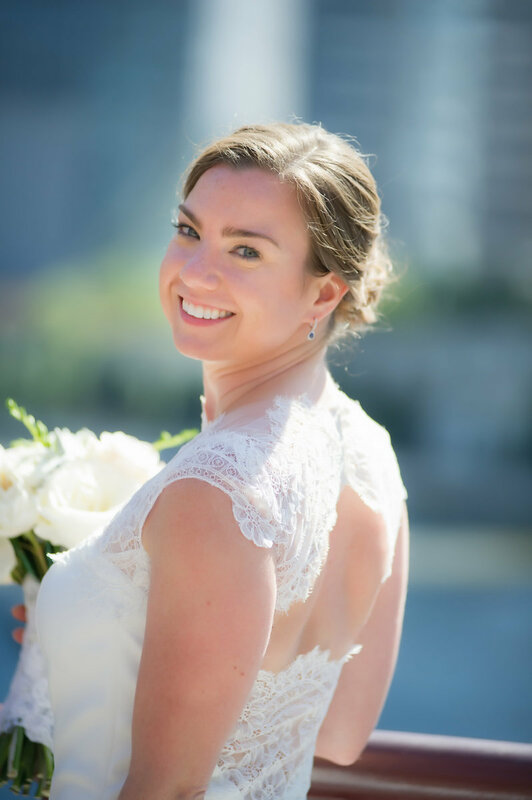 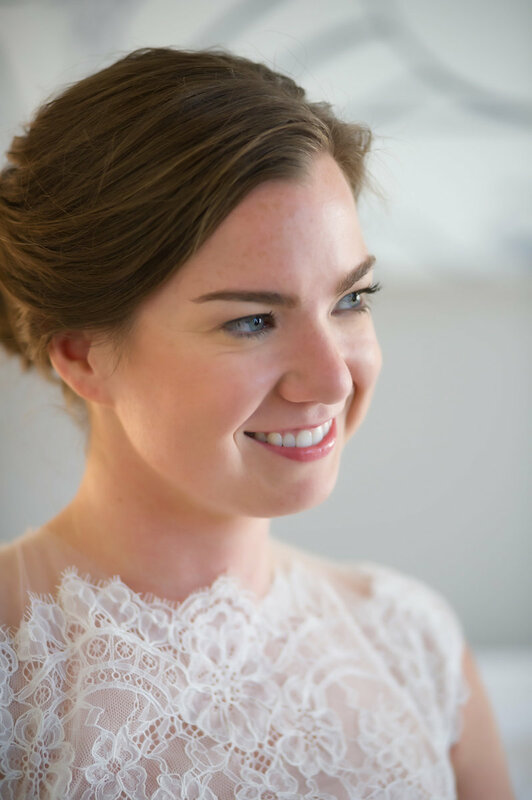 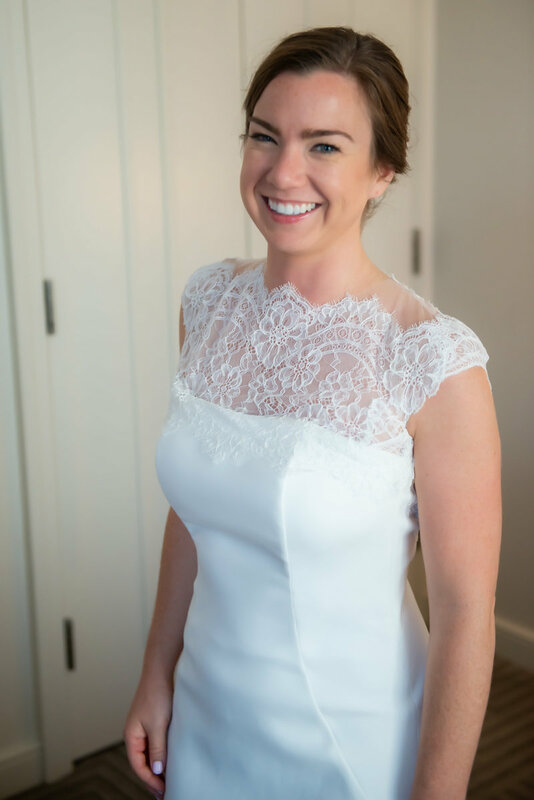 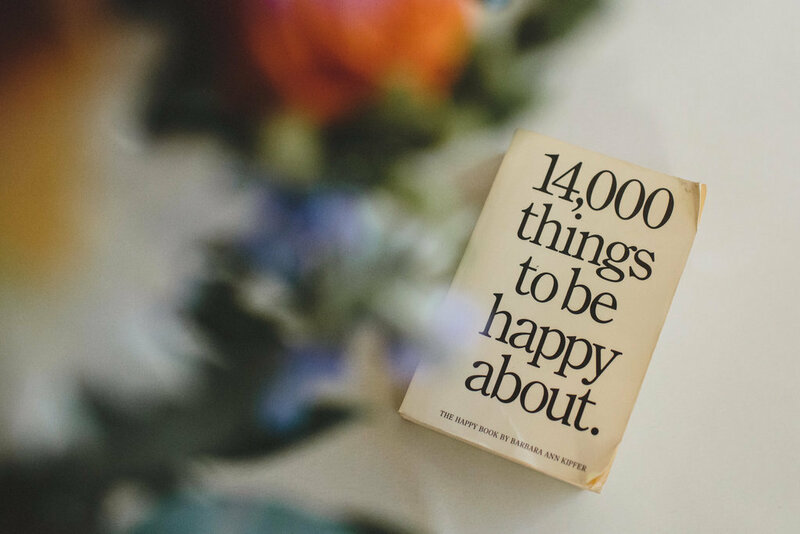 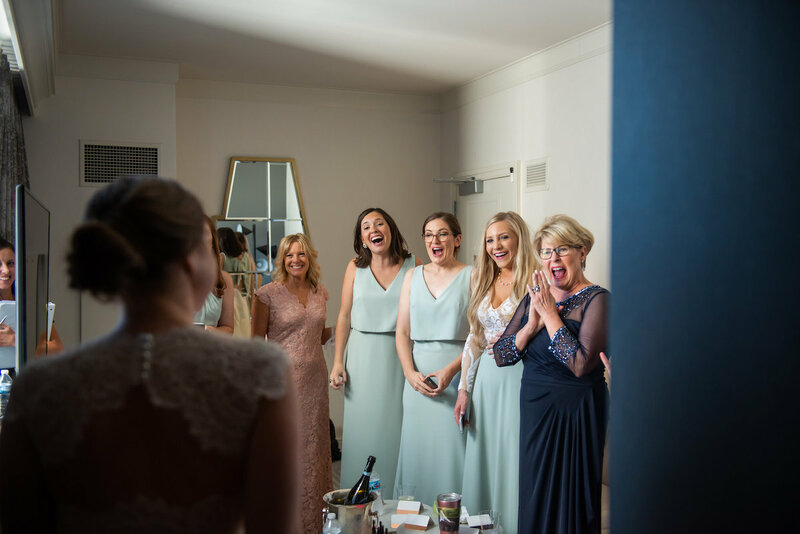 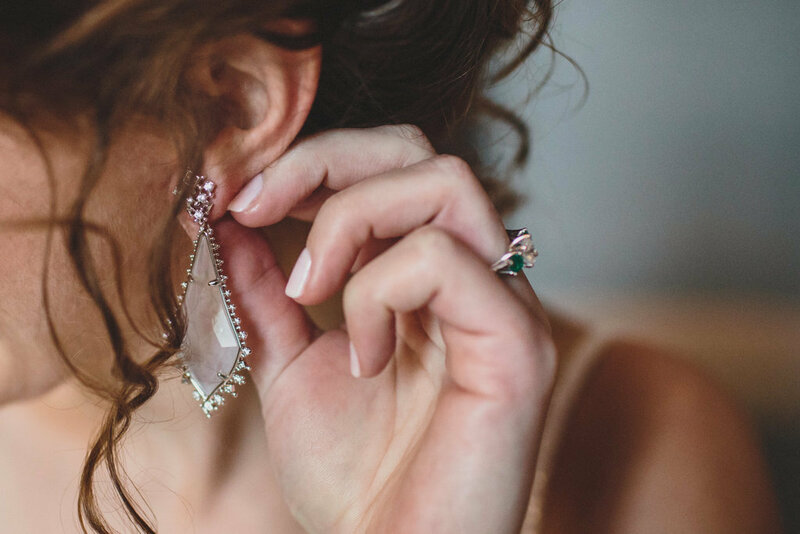 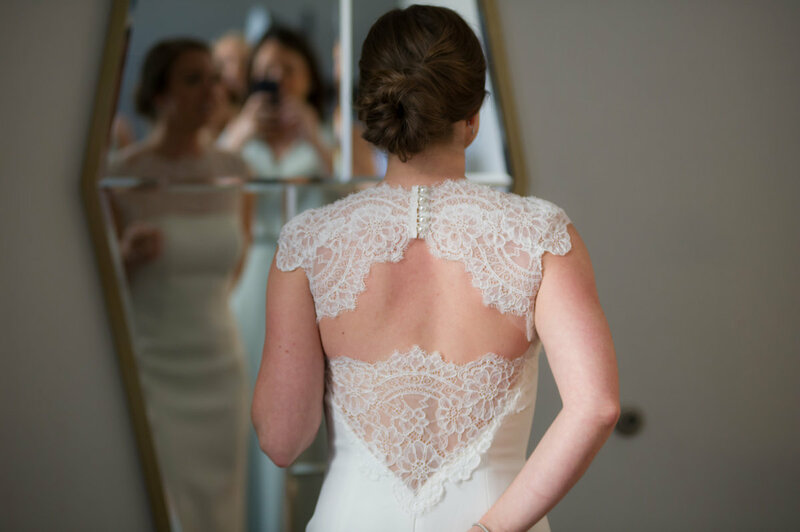 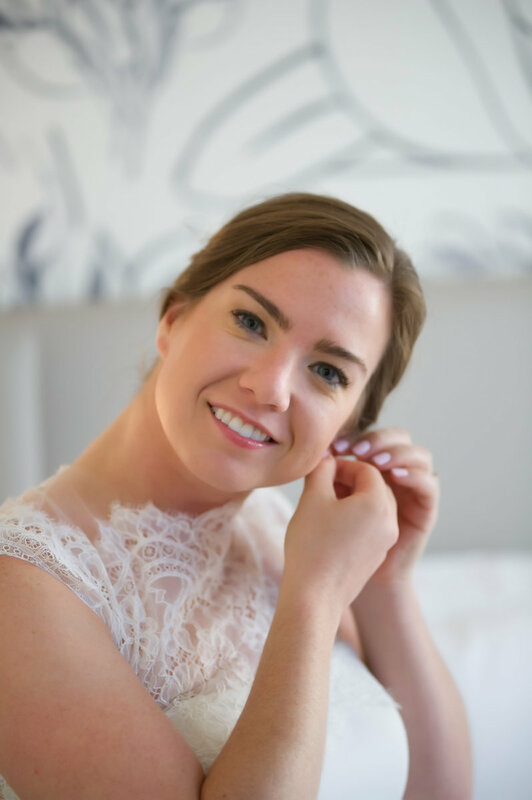 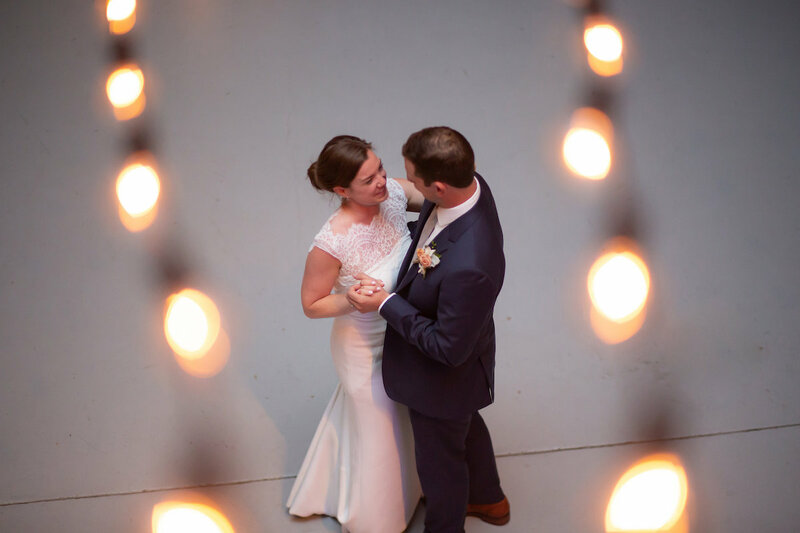 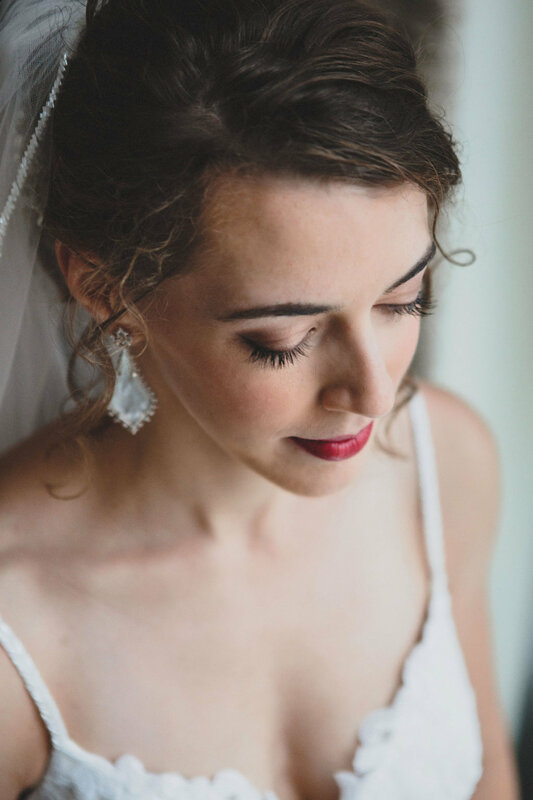 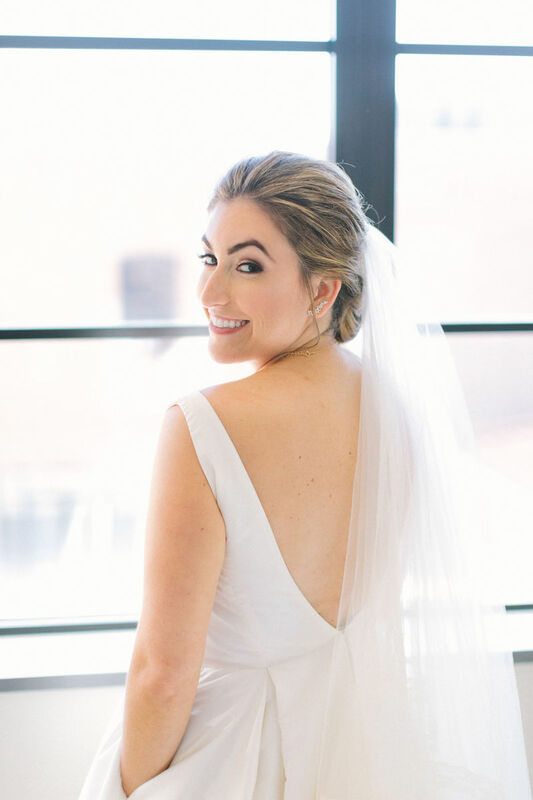 Jessica and Sam showcased many of her amazing attributes during their September wedding when they were lucky enough to have Dory L Tuohey Photography documenting every gorgeous moment and detail. 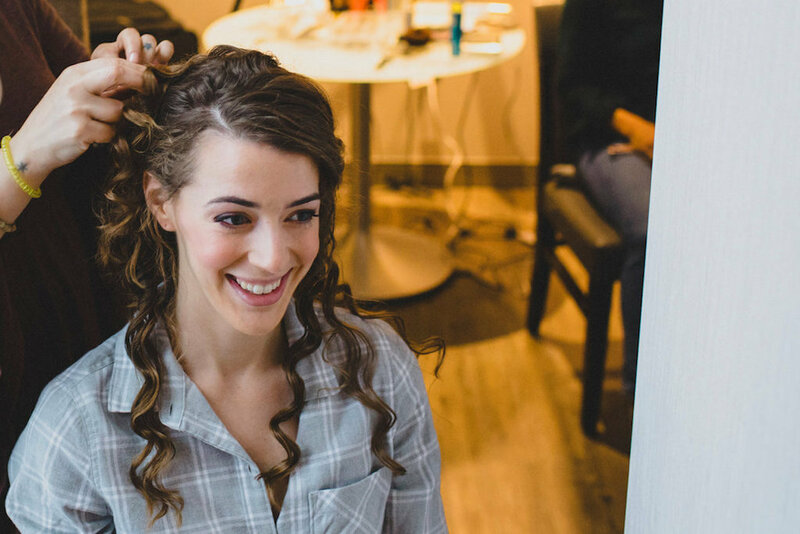 Jessica and her bridesmaids started their day with hair and makeup at Blow By Blow before returning to The Gwen Hotel to get dressed. 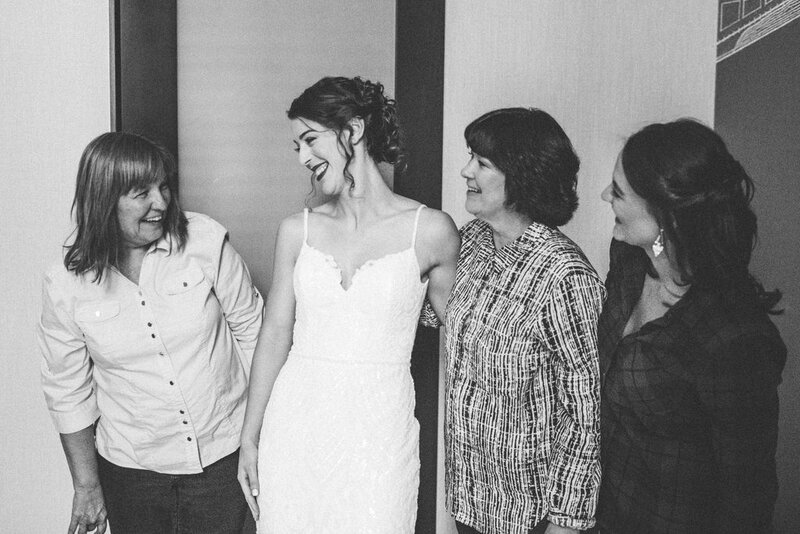 Surrounded by those closest to her, Jessica looked stunning and wowed everyone. 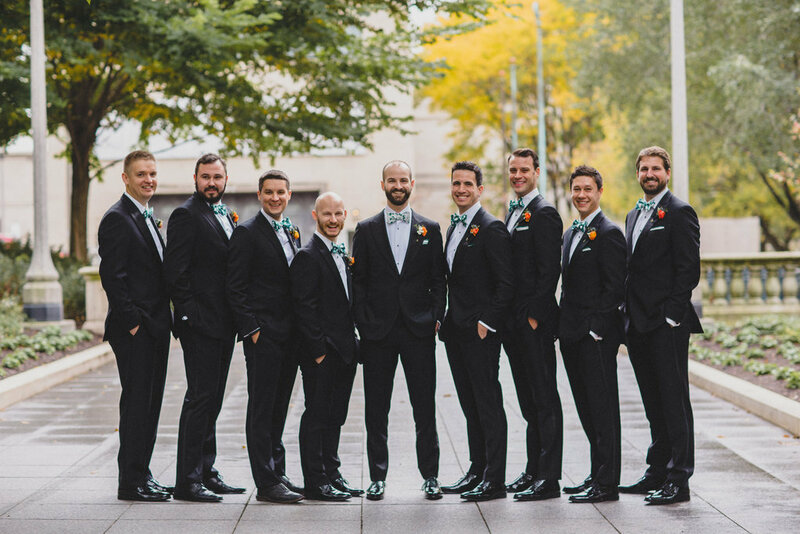 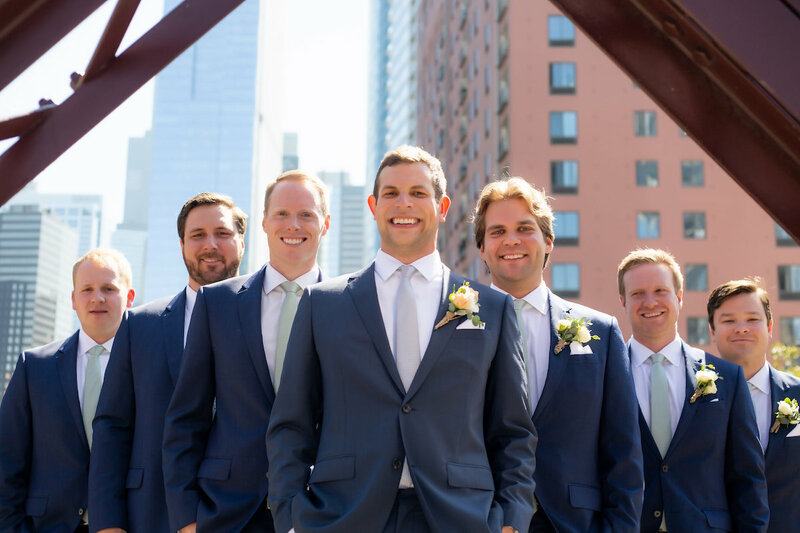 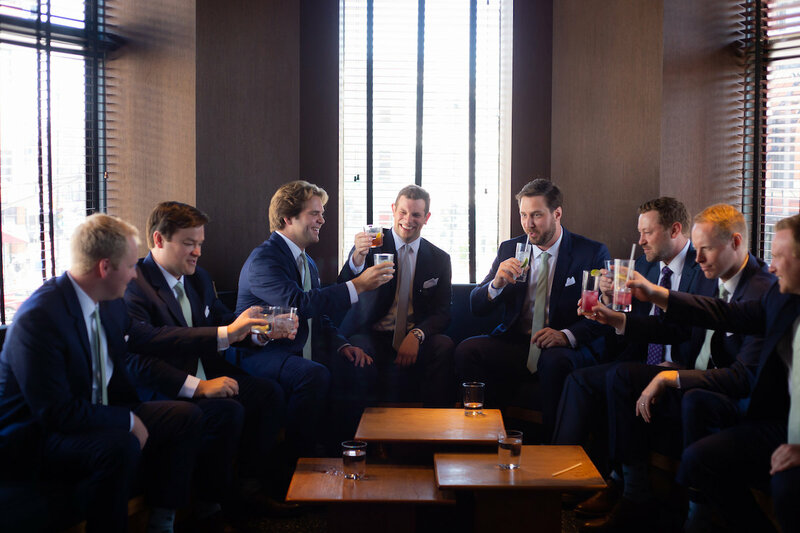 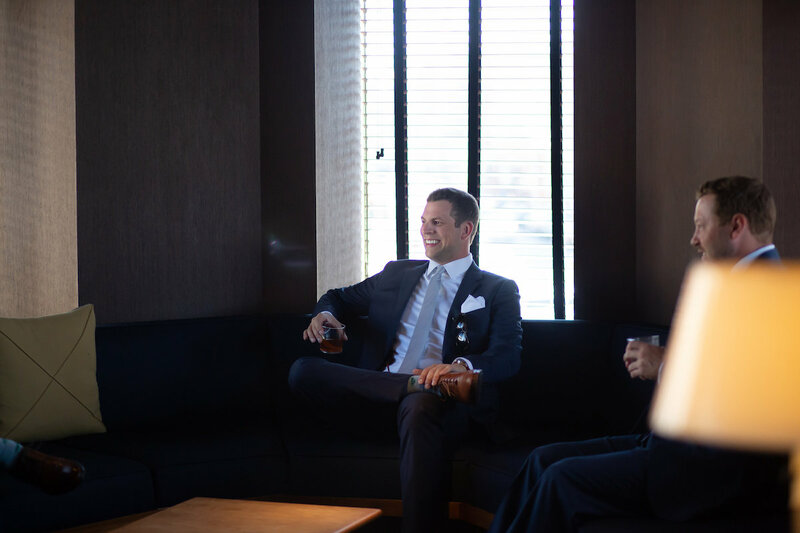 Meanwhile, Sam and his groomsmen enjoyed the morning at The Robey before heading out to meet his bride at The Gwen Hotel for a first look. 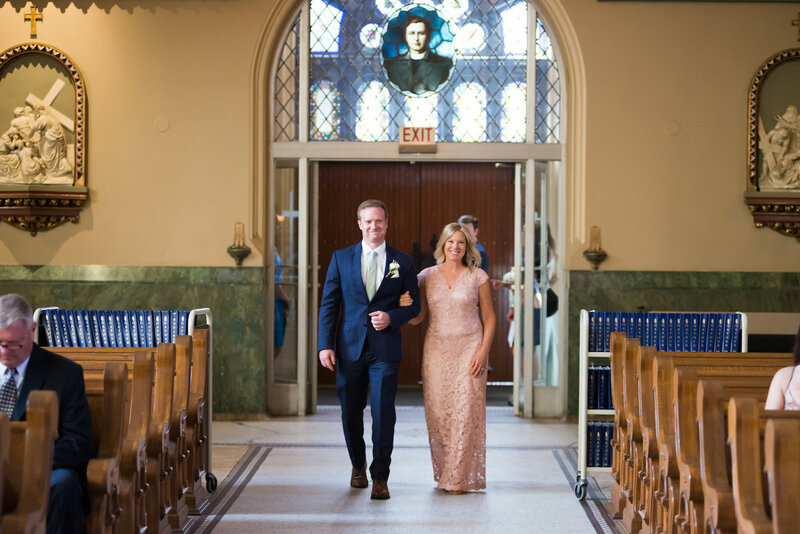 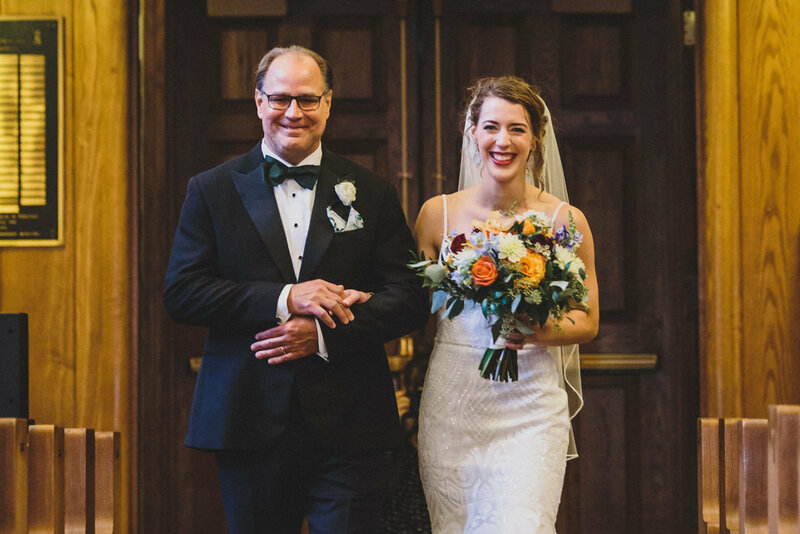 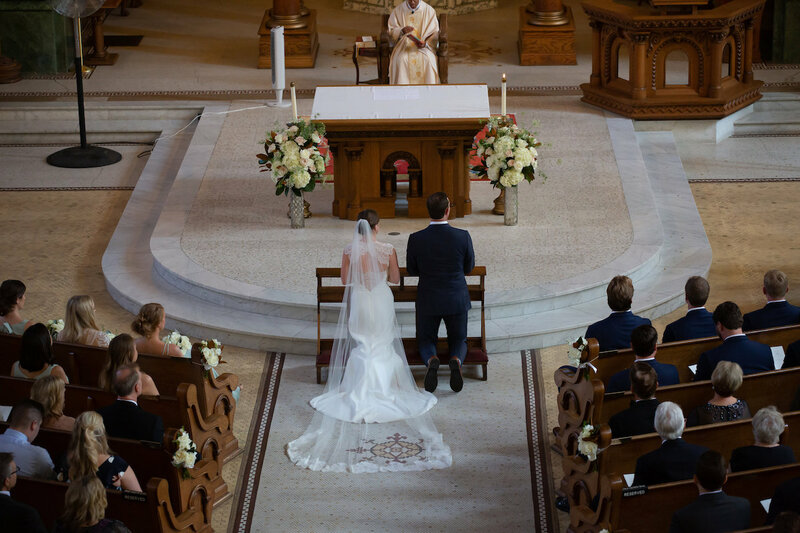 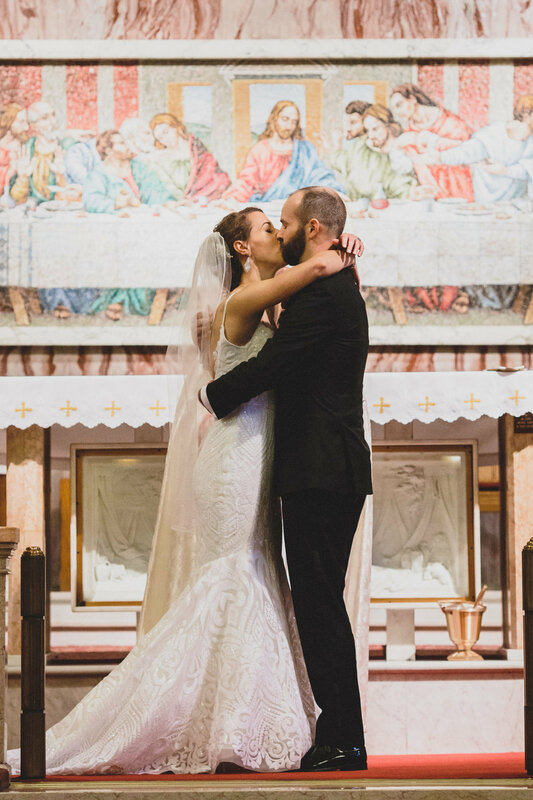 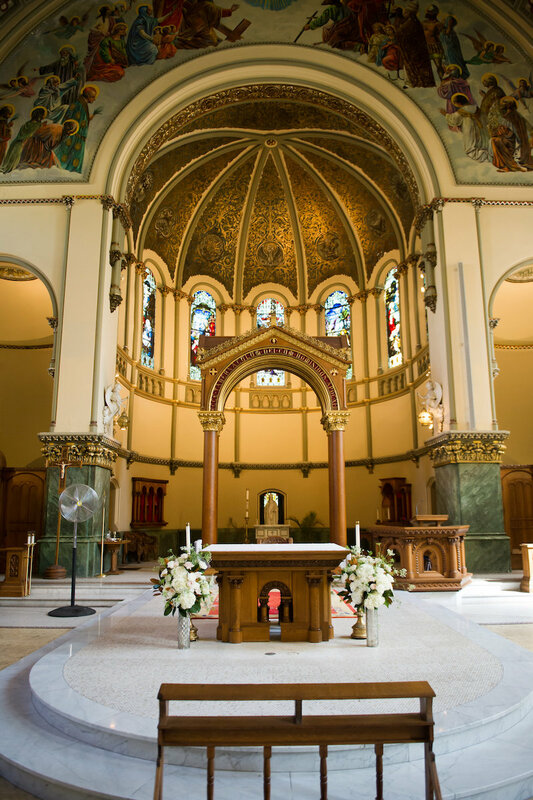 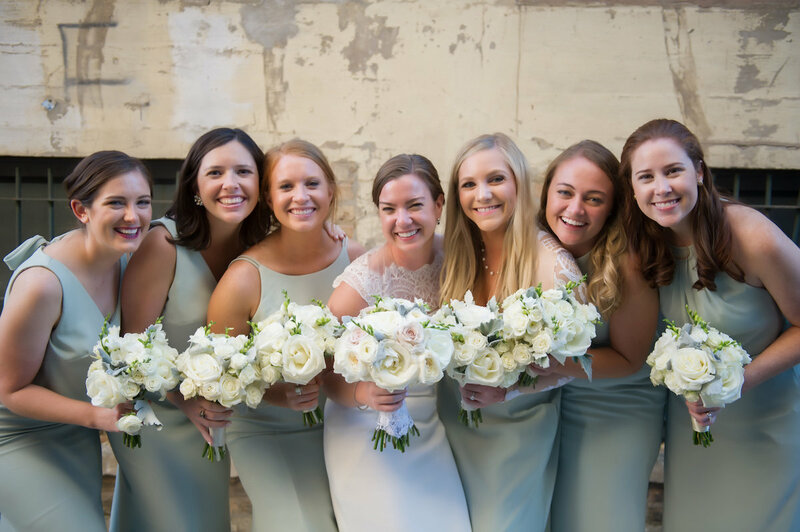 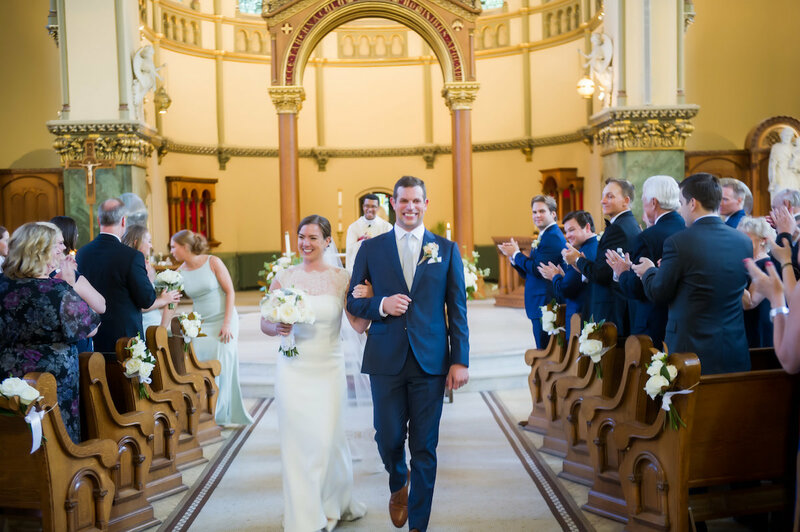 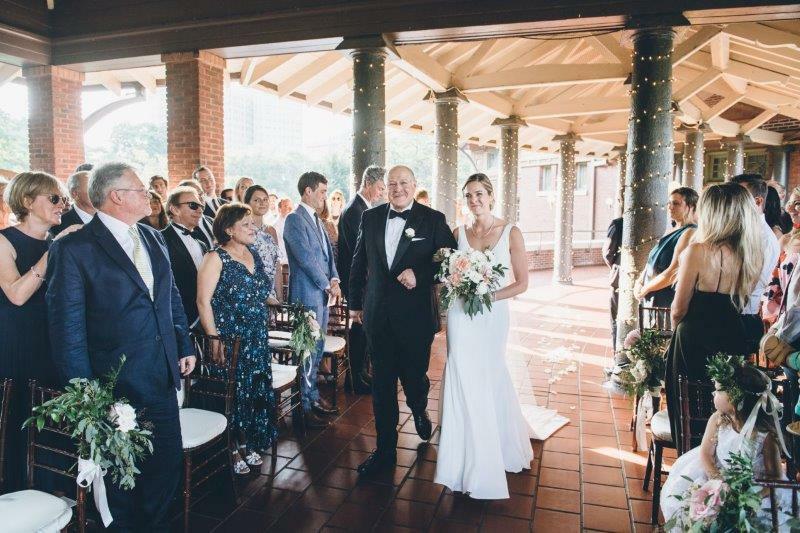 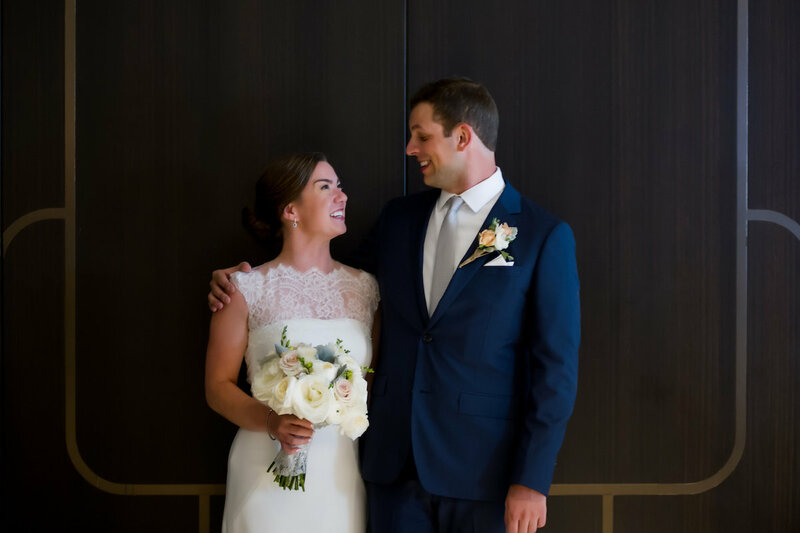 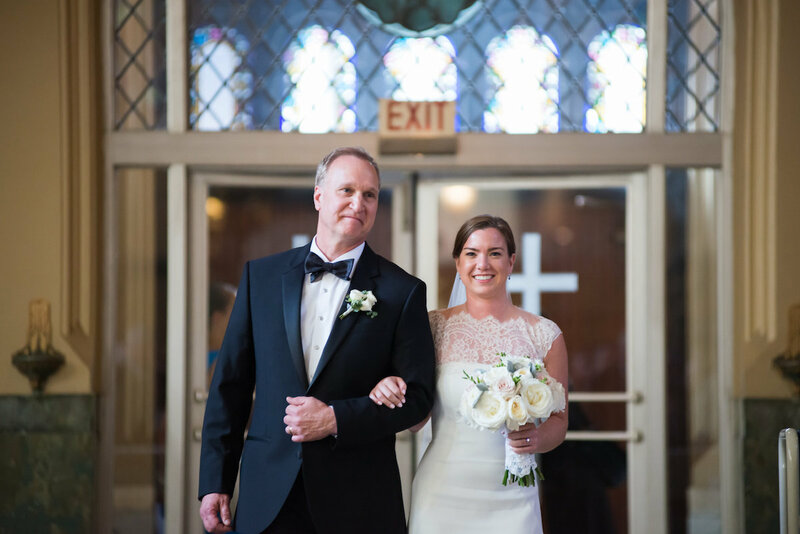 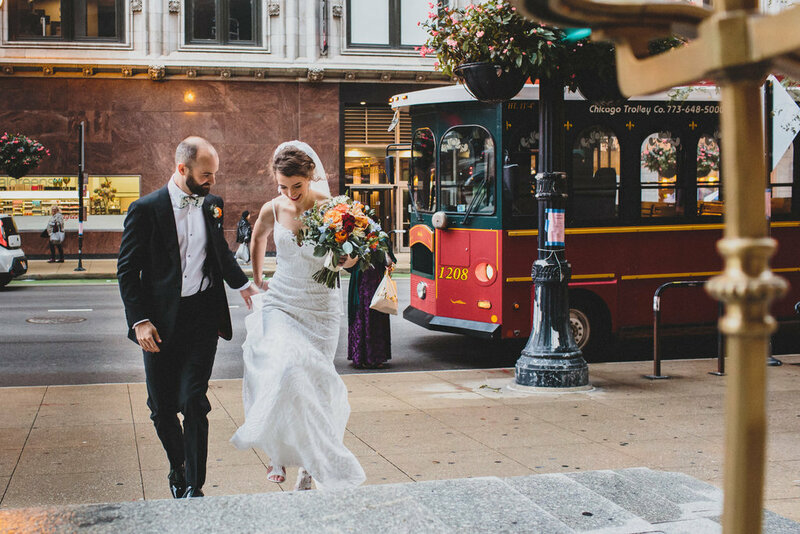 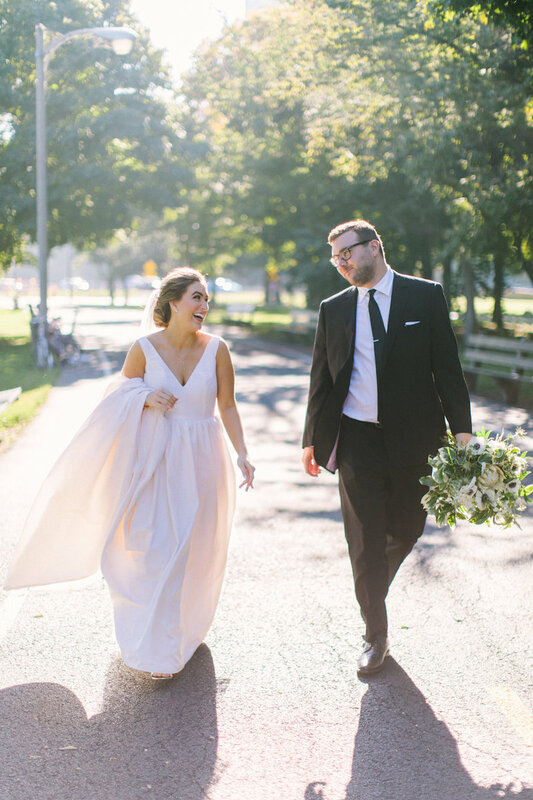 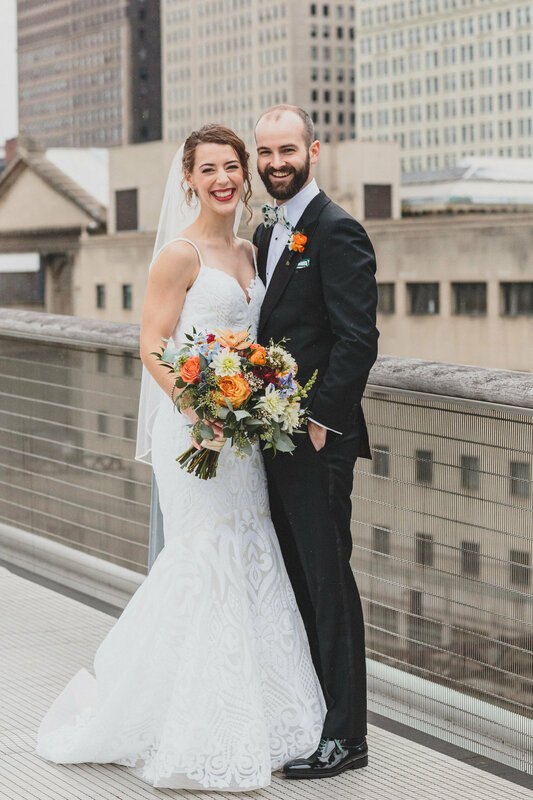 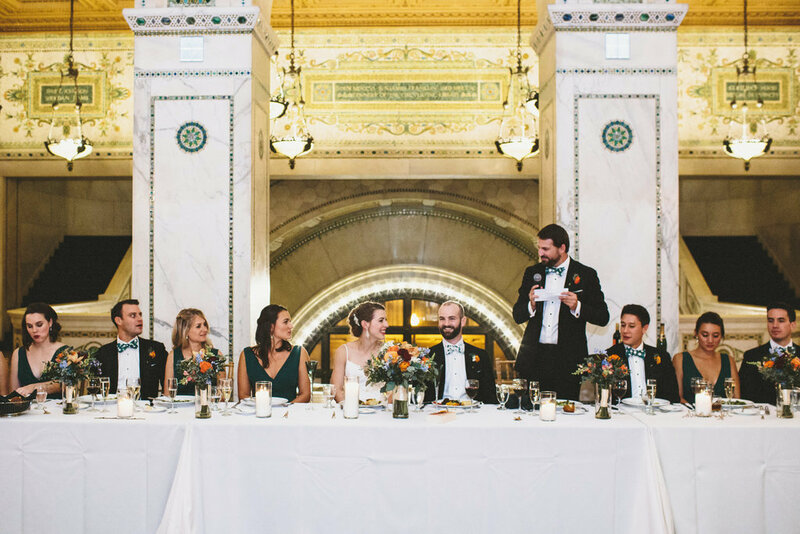 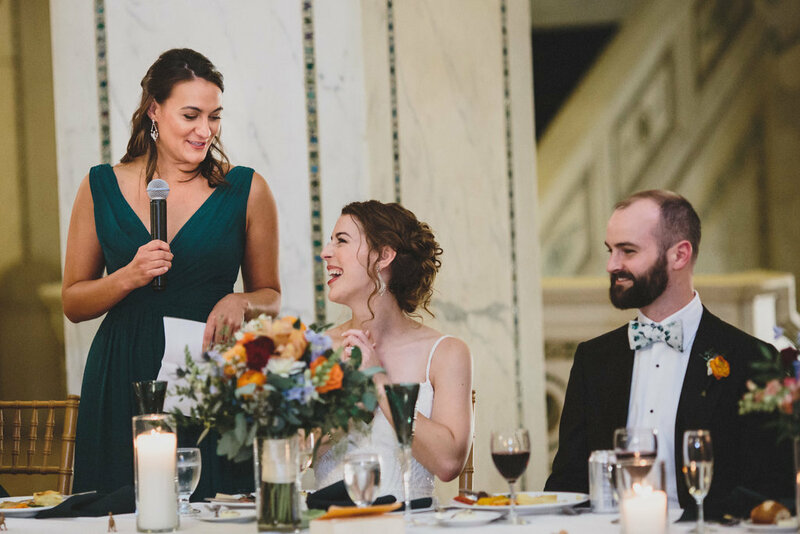 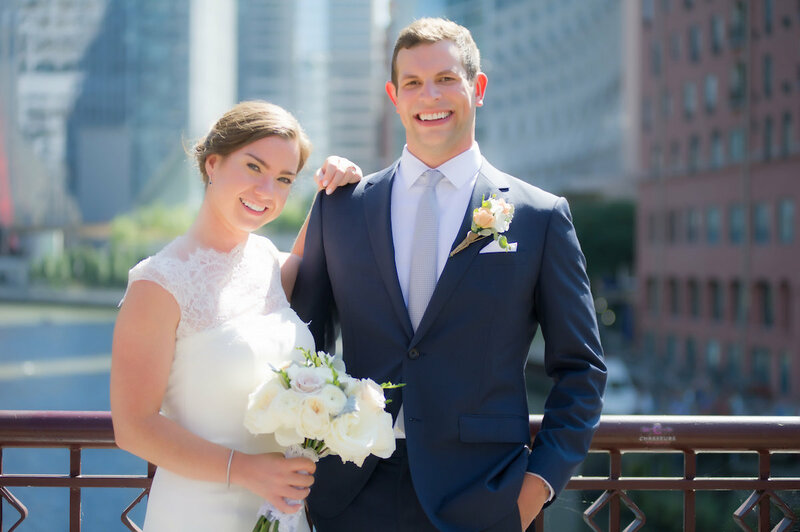 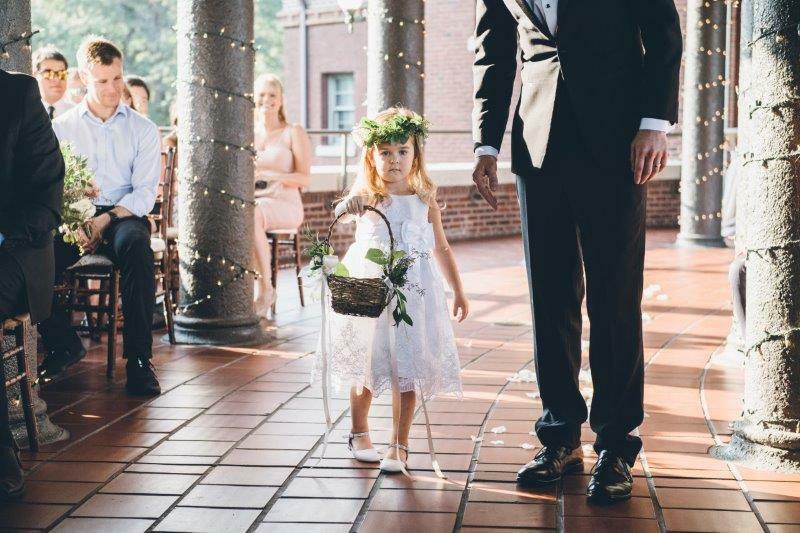 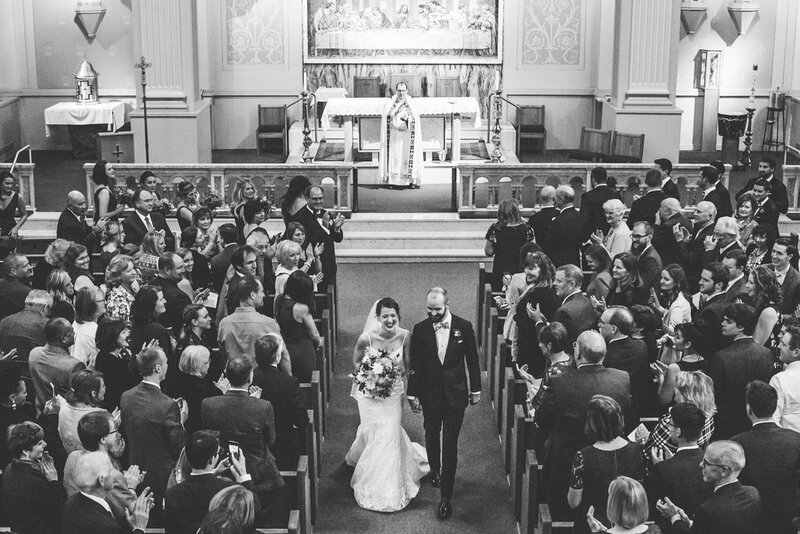 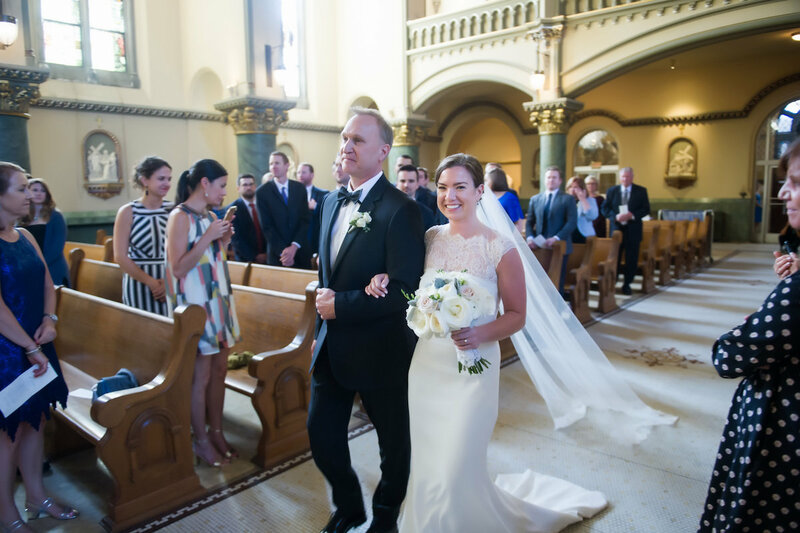 With florals from Nancy Krause Floral Design, and Dory L Tuohey Photography capturing every ounce of excitement, Jessica and Sam shared a special moment then departed on their Second City Trolley for St. Josaphat Catholic Church. 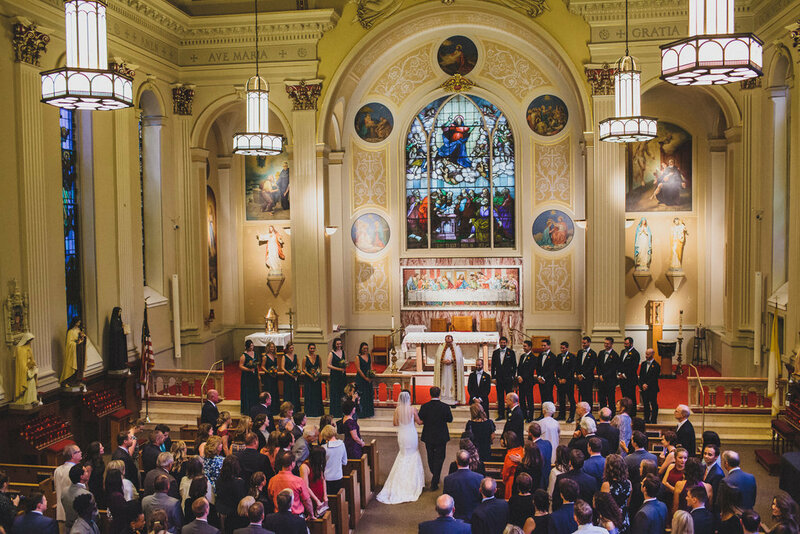 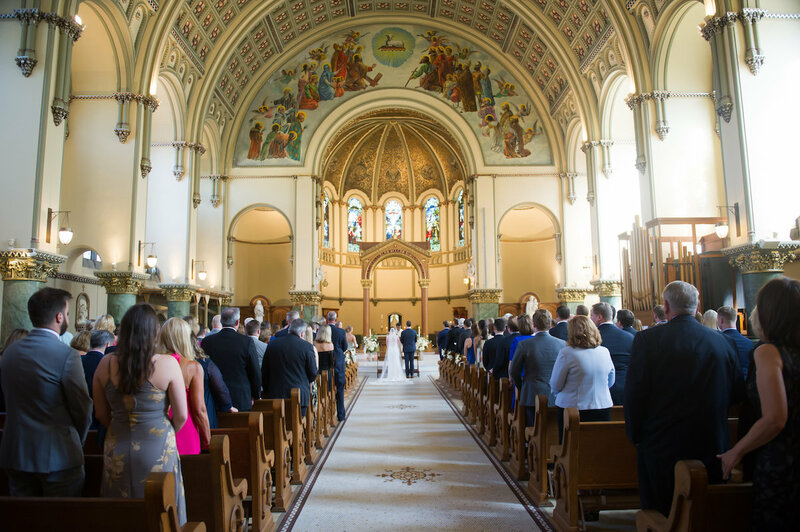 St. Josaphat Catholic Church was beautiful as ever, and friends and family arrived excitedly waiting to witness Jessica and Sam exchange their vows and be pronounced husband and wife. 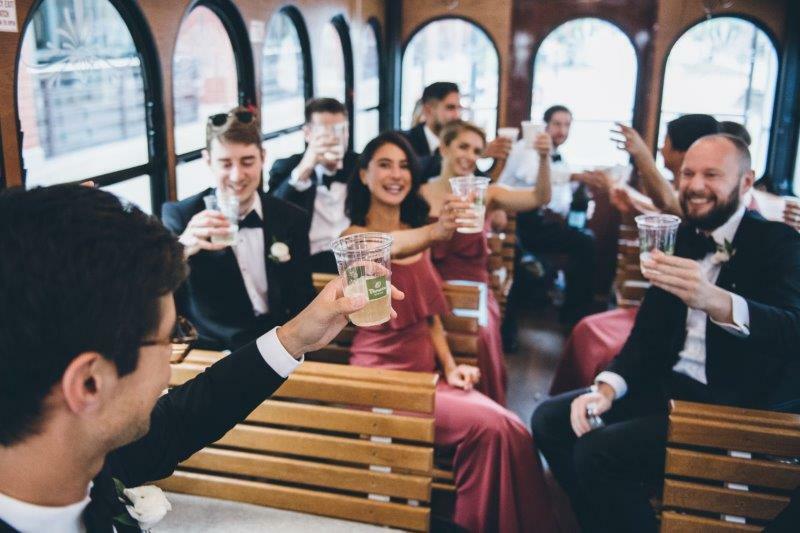 Afterwards, Jessica and Sam departed with their wedding party for photos near Artifact Events, while guests took advantage of the transportation provided by M&M Limousine. 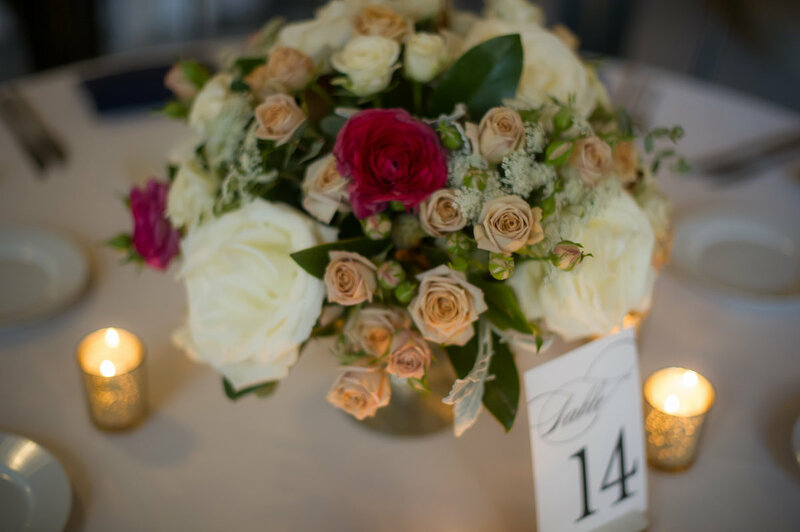 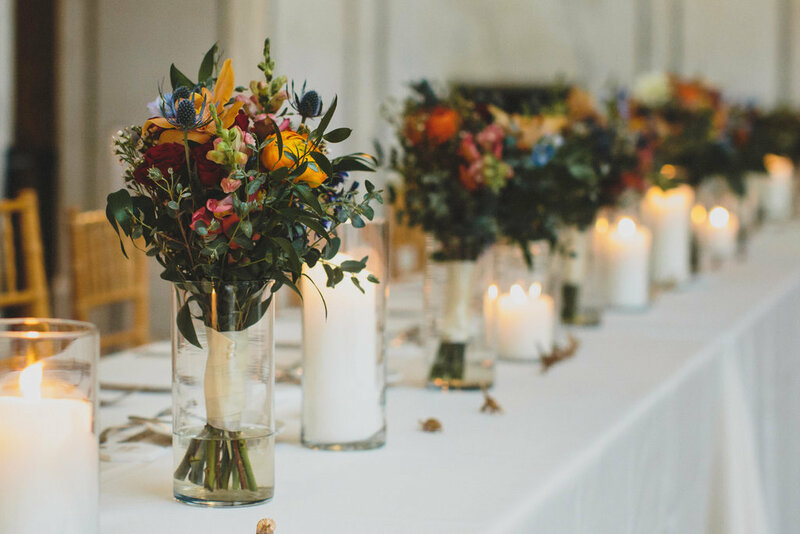 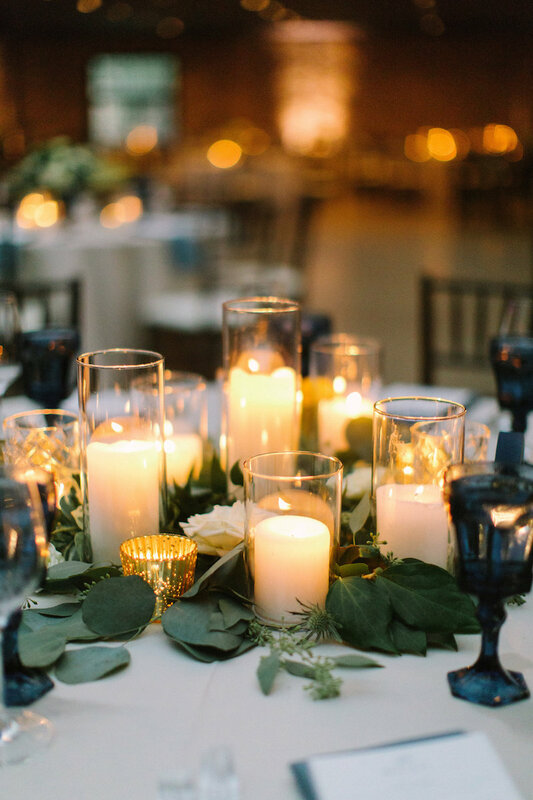 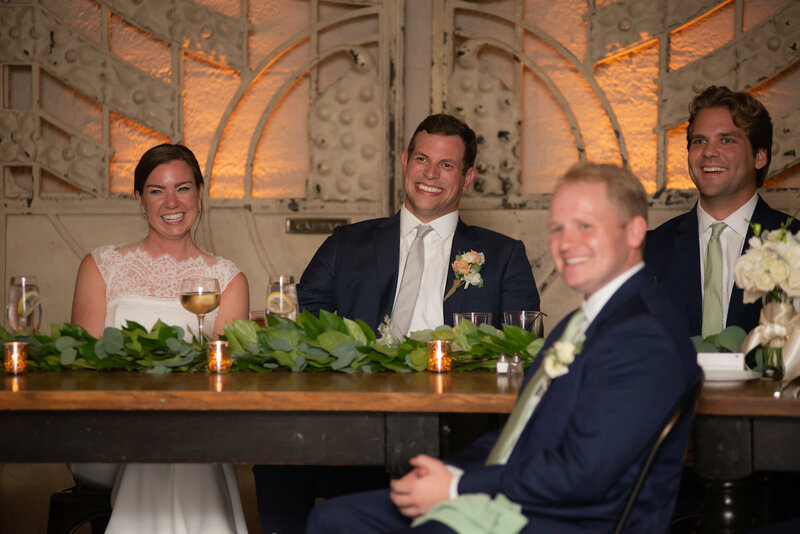 Jessica and Sam greeted their guests at Artifact Events which was decorated with incredible floral and candlelight from Nancy Krause Floral Design and illuminated by twinkle lights from Event Brilliance. 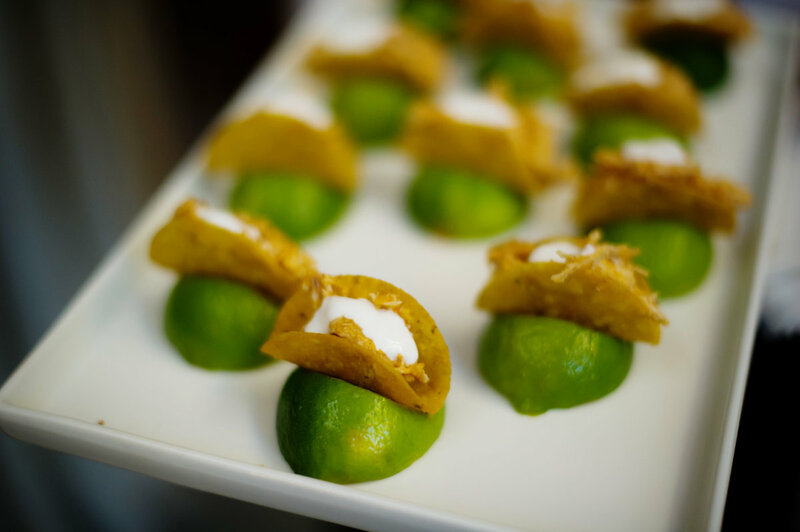 Guests enjoyed unique bites from Catering by Michaels before sitting down to for a delicious dinner and touching speeches. 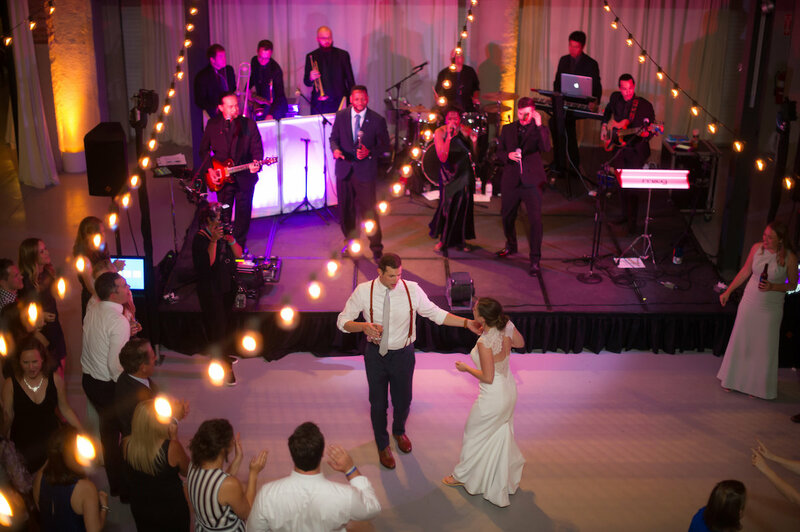 Topping off the night, Talk of the Town Big Band opened the dance floor and kept it energized and packed until the very end of the evening. 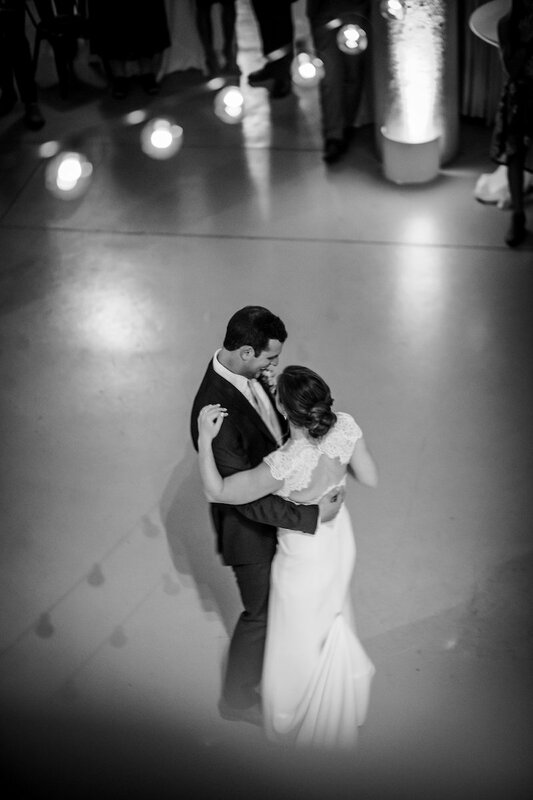 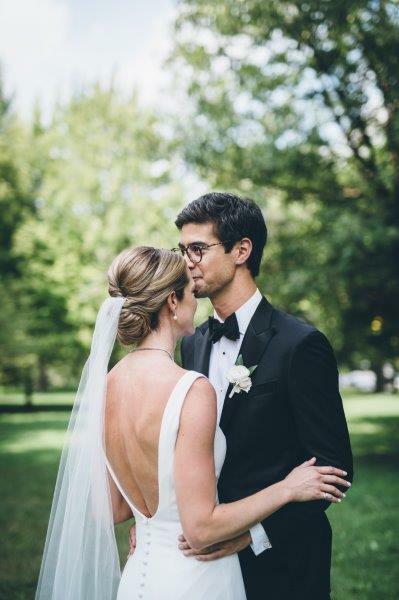 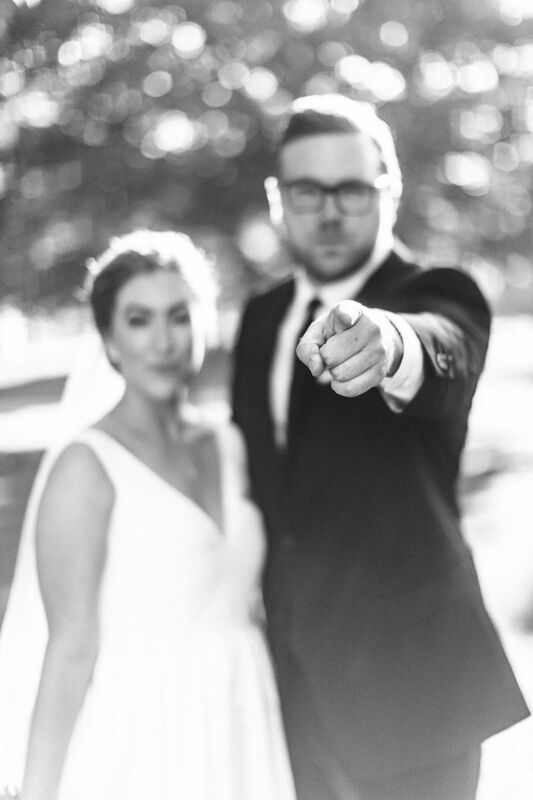 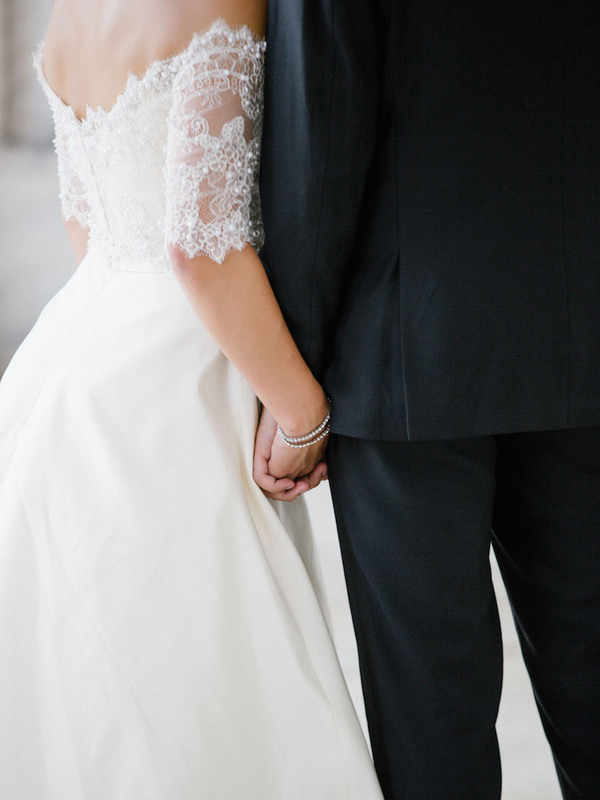 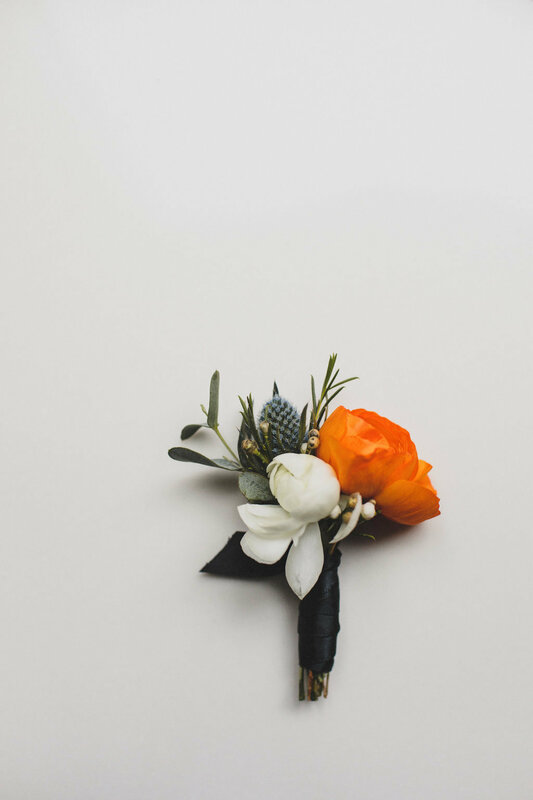 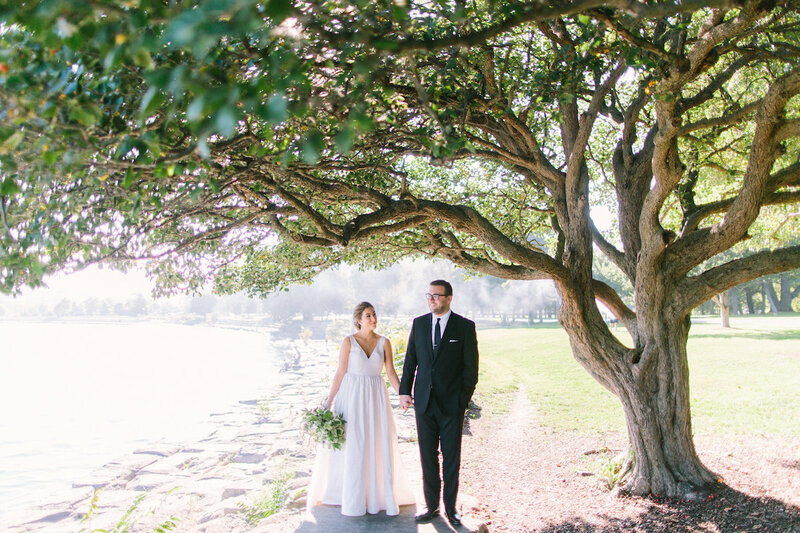 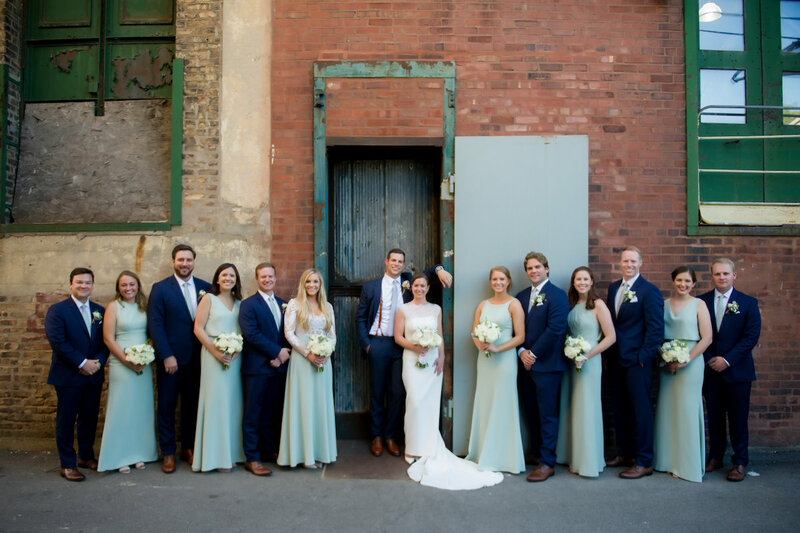 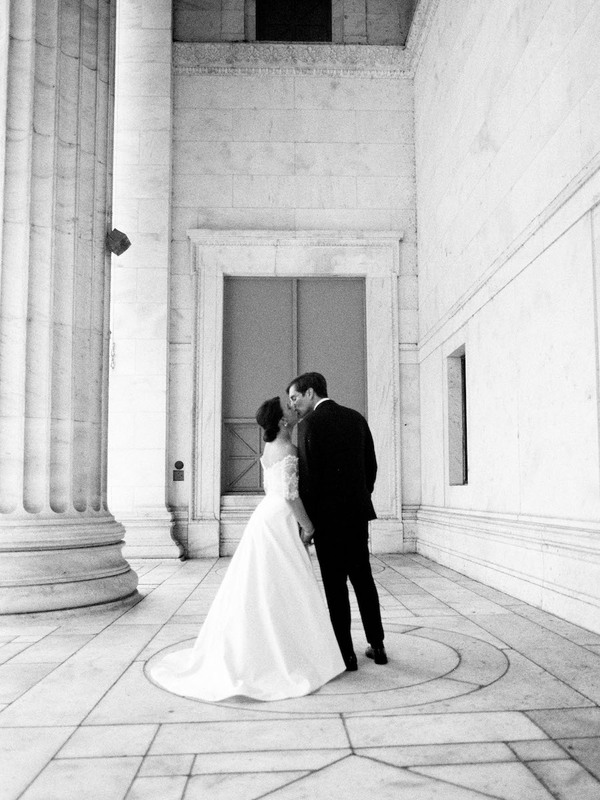 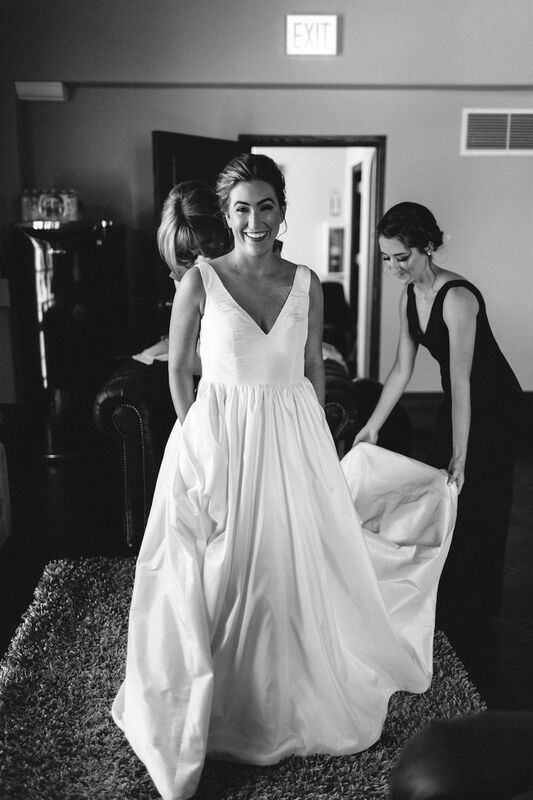 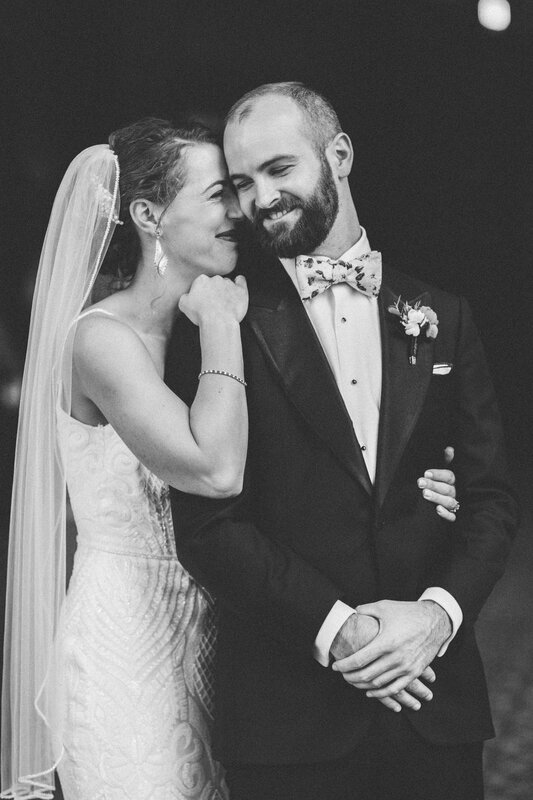 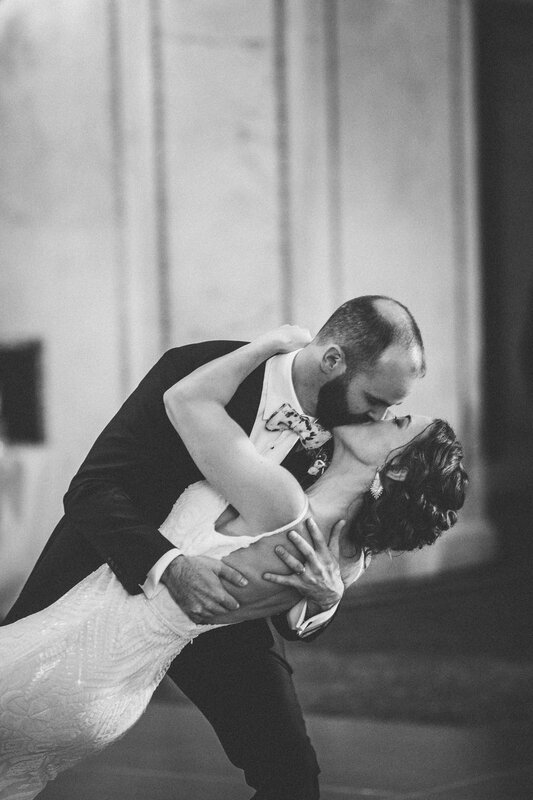 Jessica and Sam, your wedding was a dream! 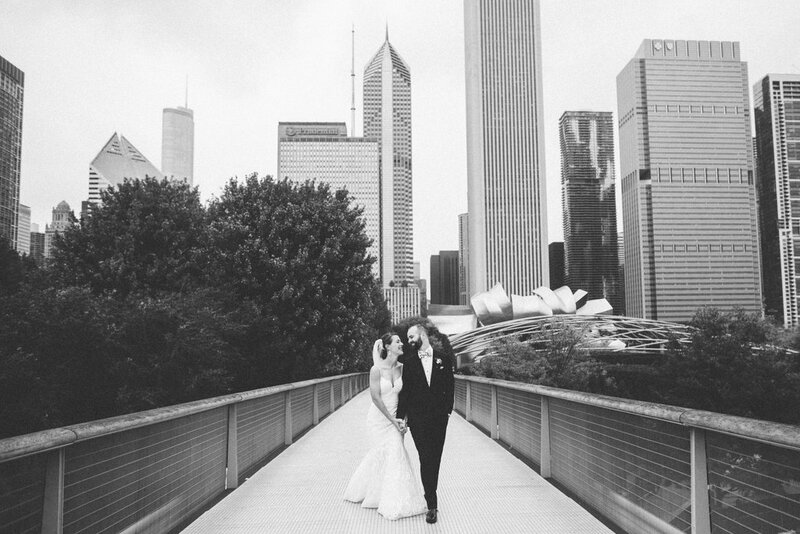 Thank you for allowing us to be a part of it and congratulations again from the Five Grain Events team! 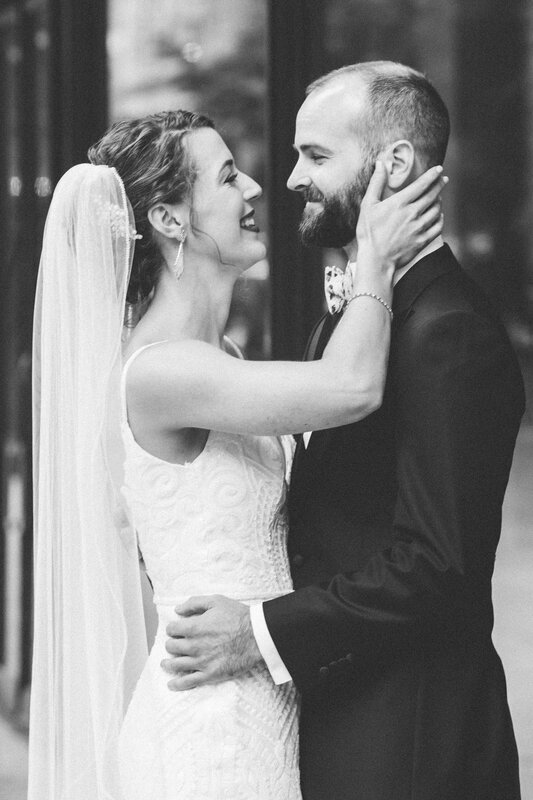 August 26, 2018. 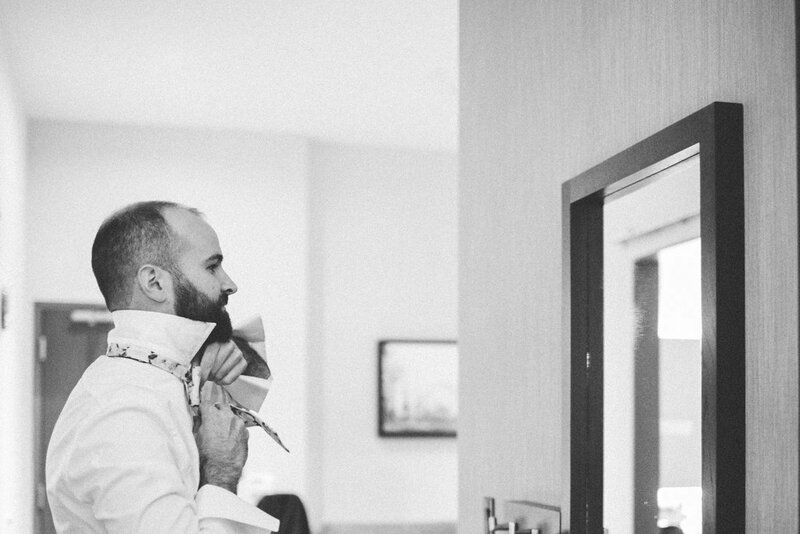 HOT HOT HOT. 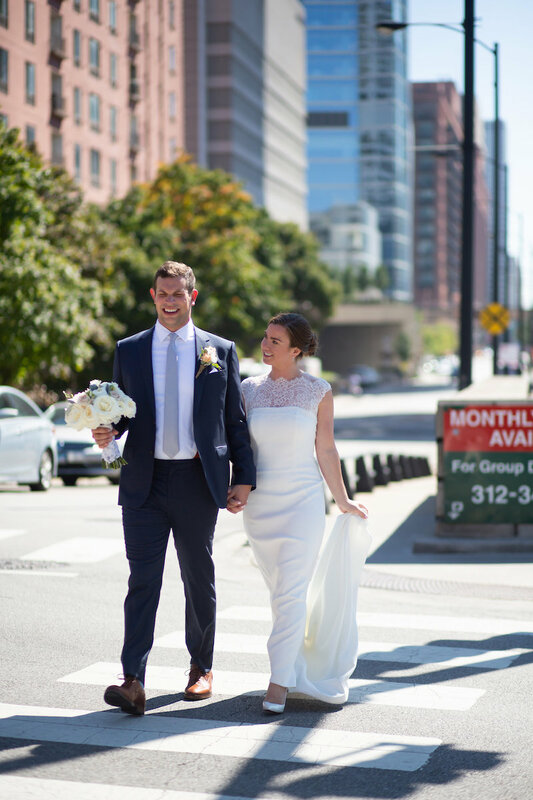 The weather called for upper 90s with high humidity and of course they were right! 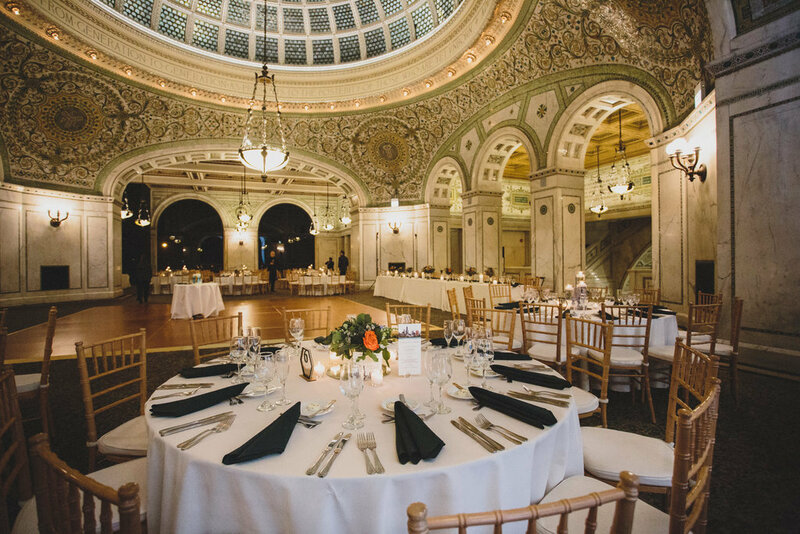 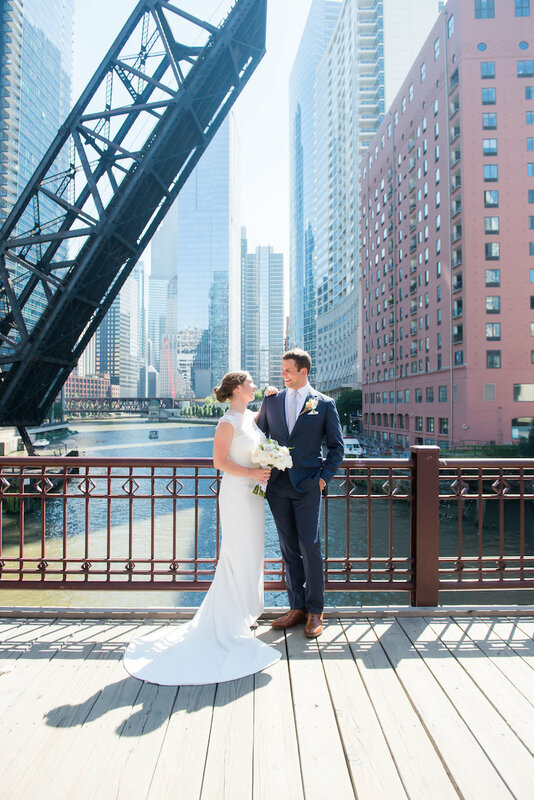 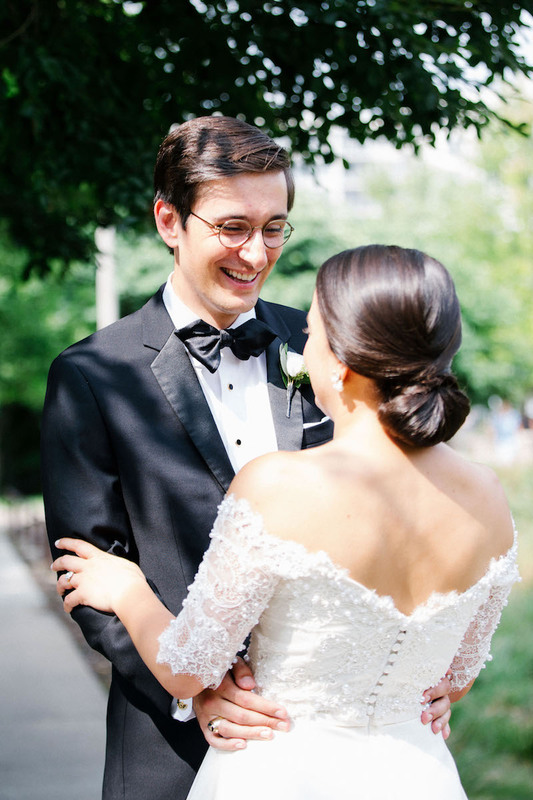 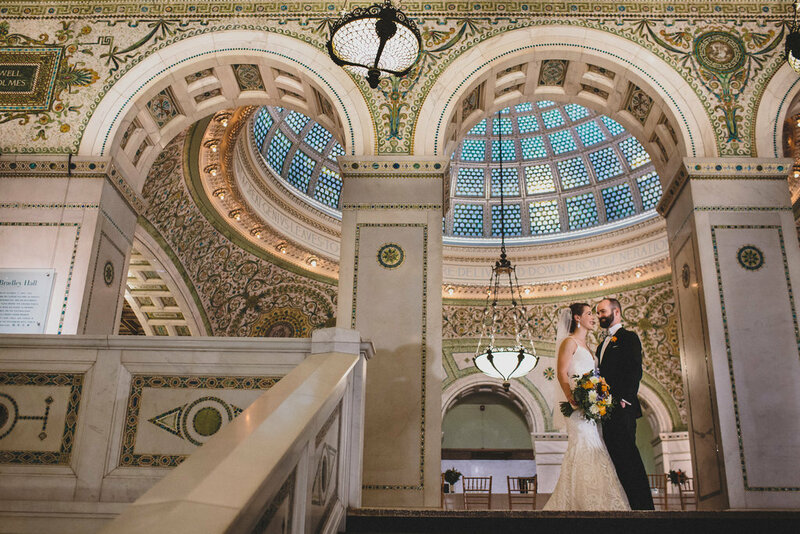 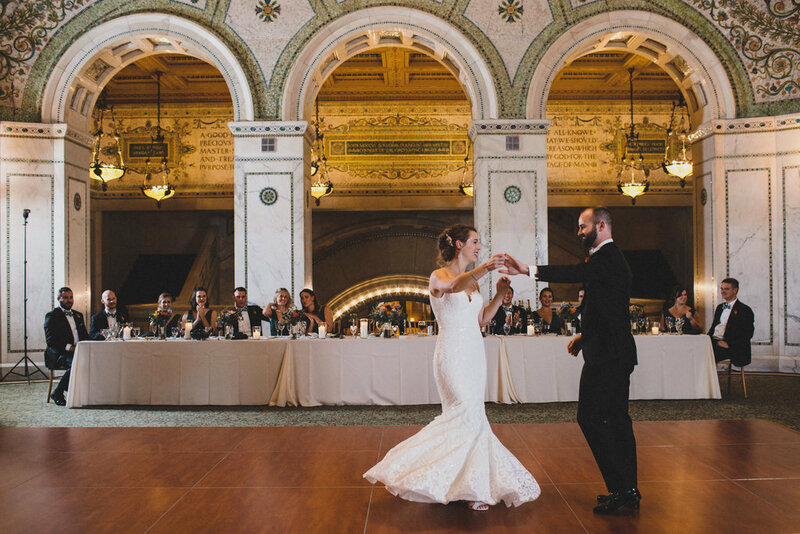 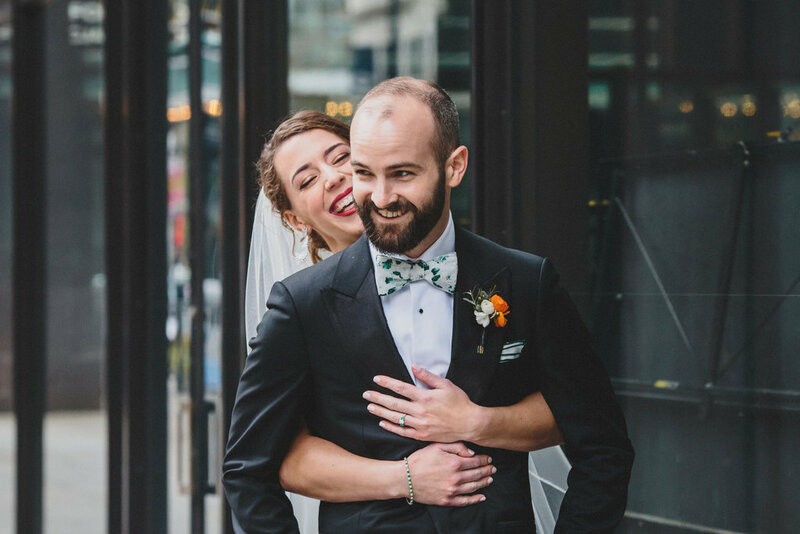 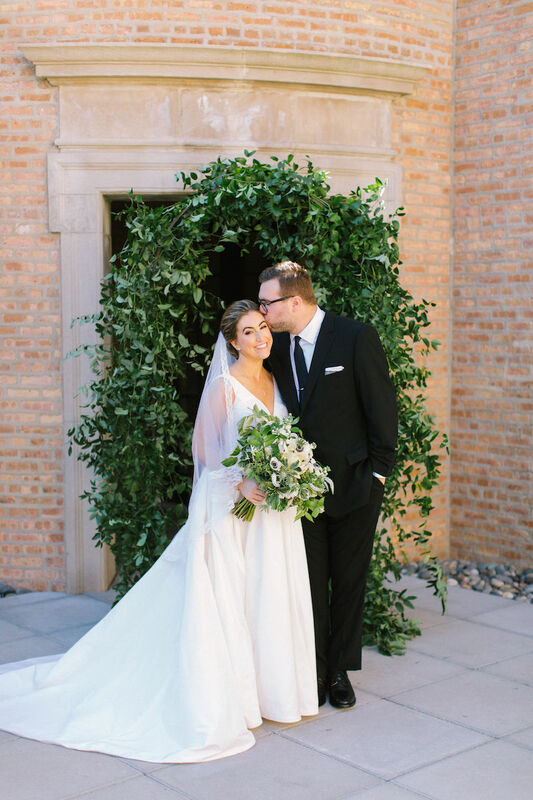 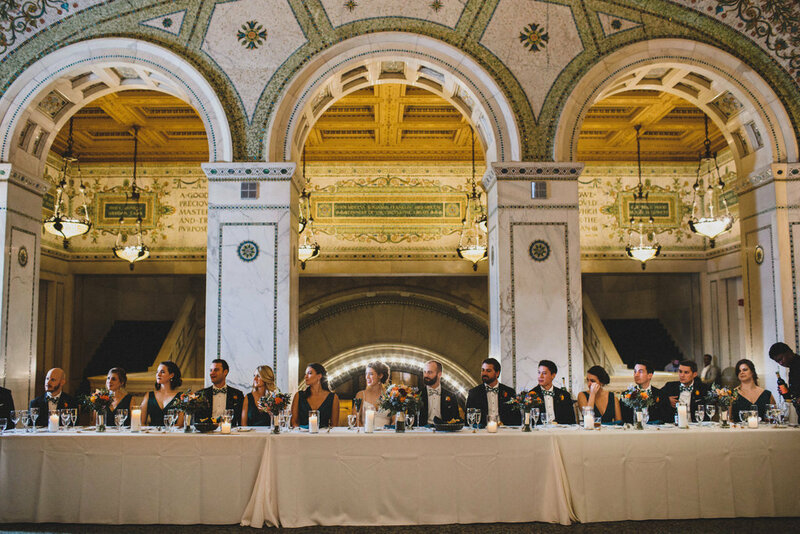 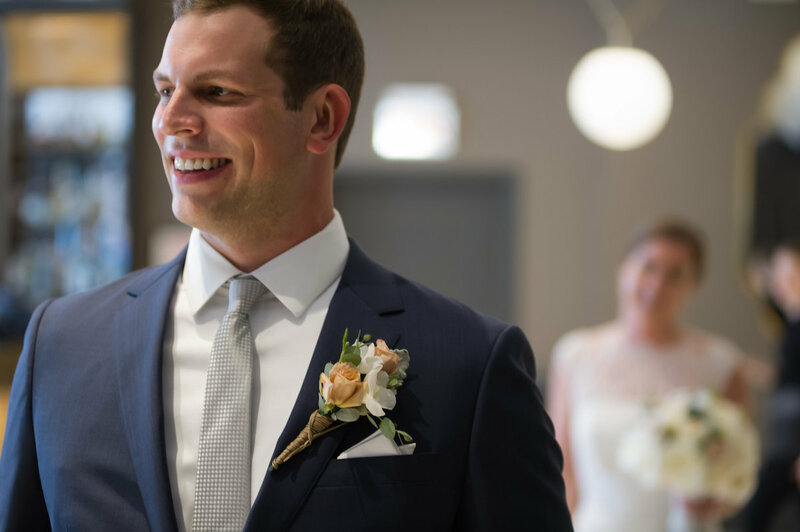 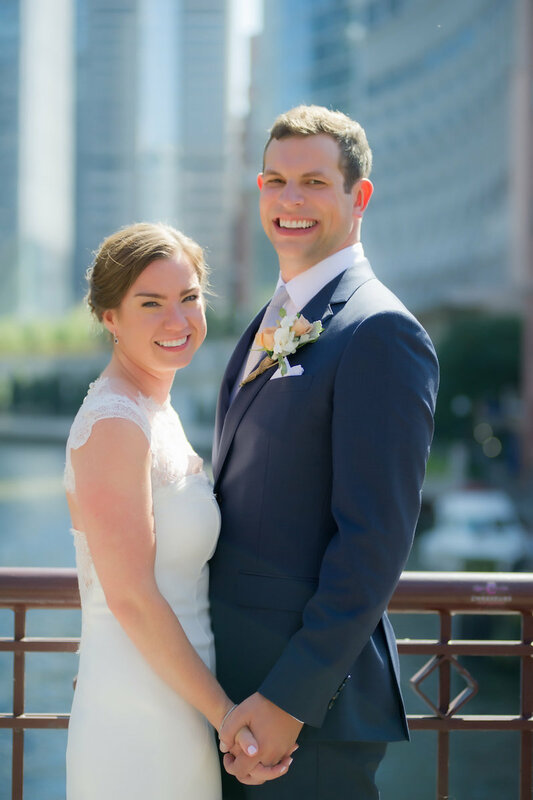 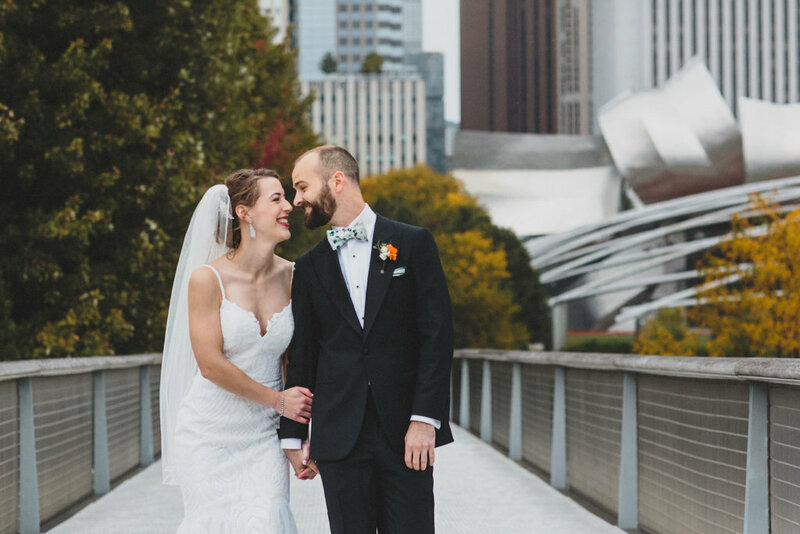 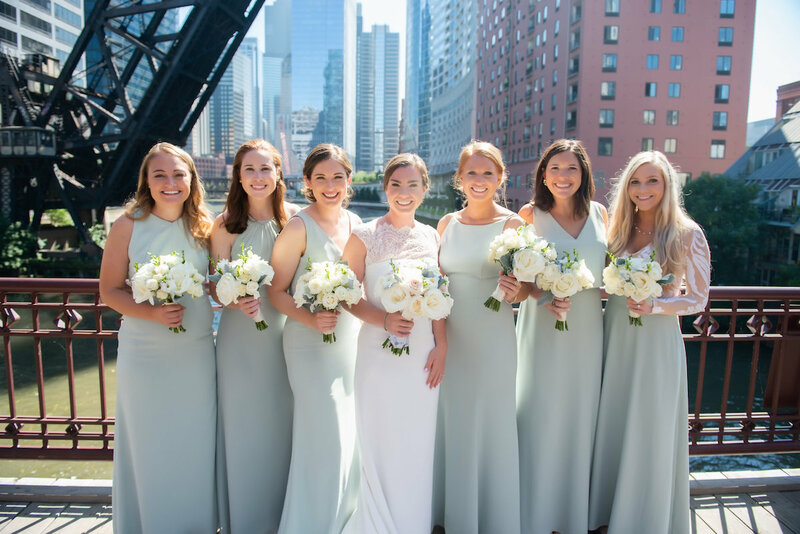 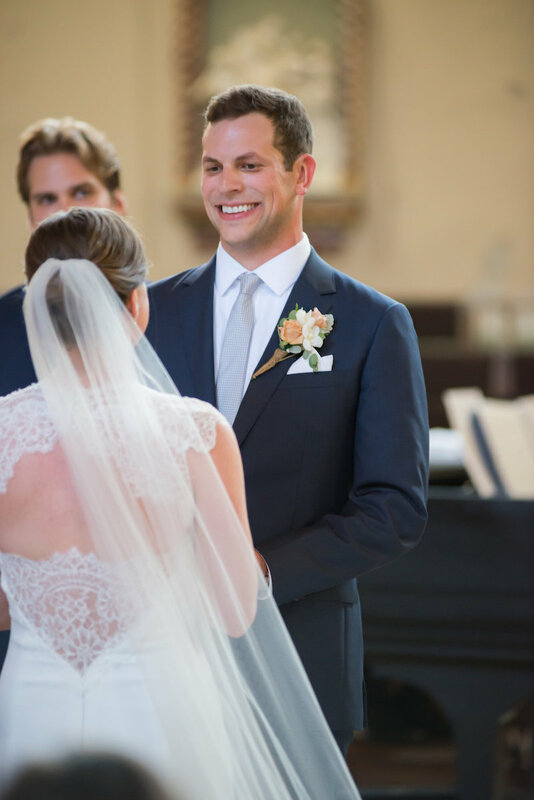 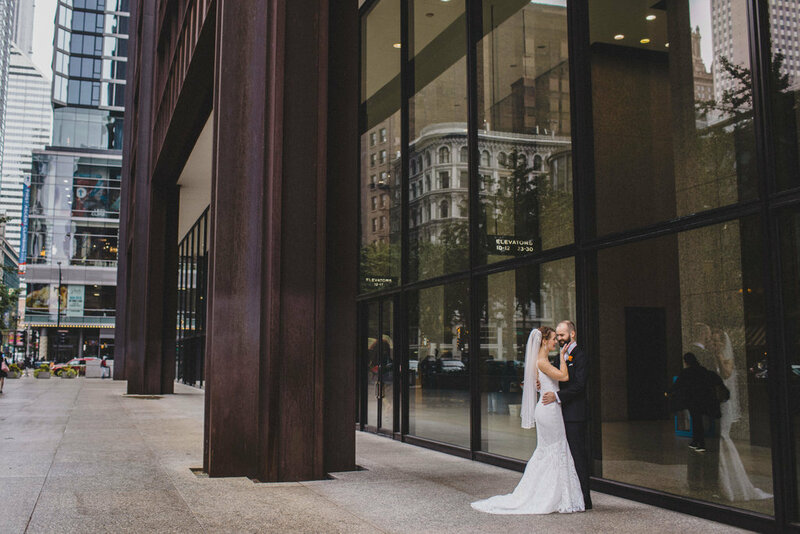 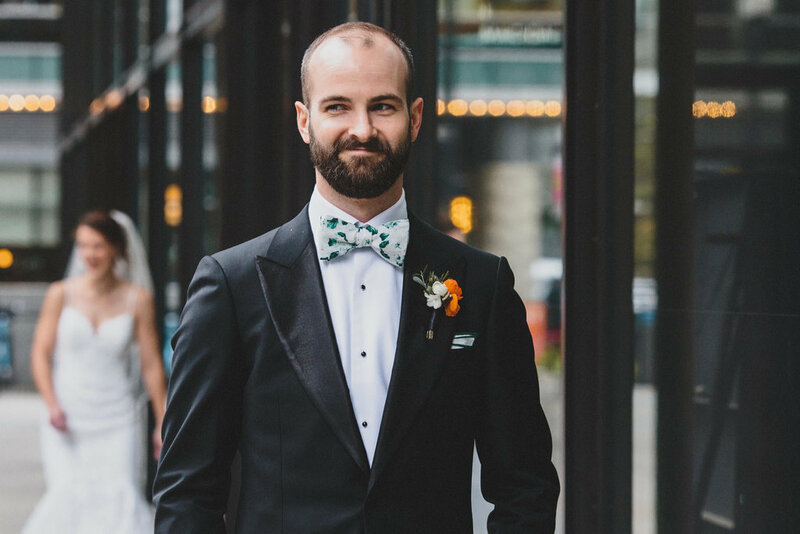 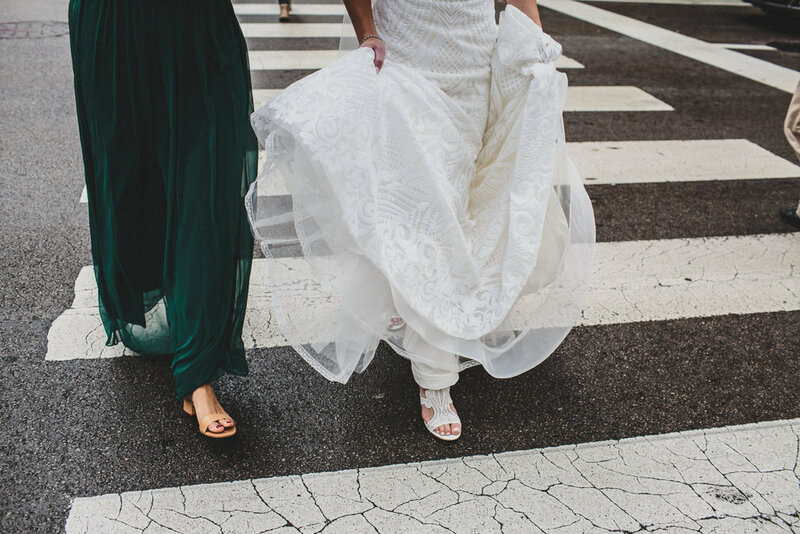 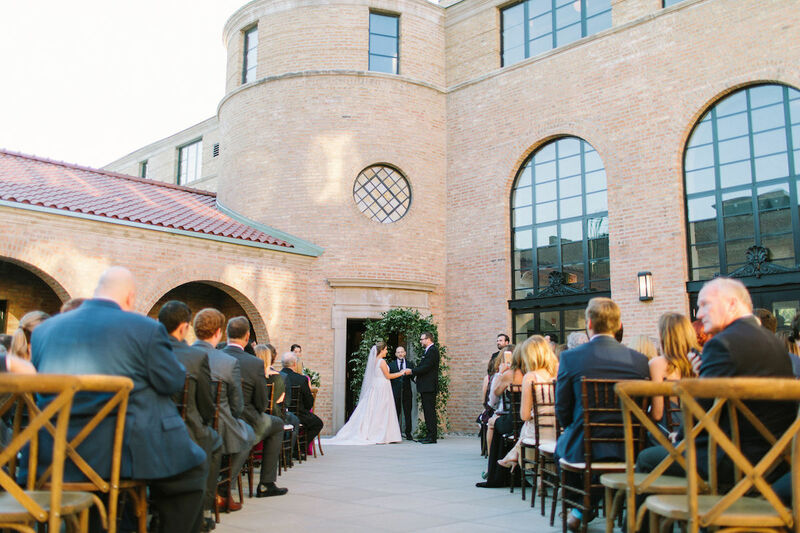 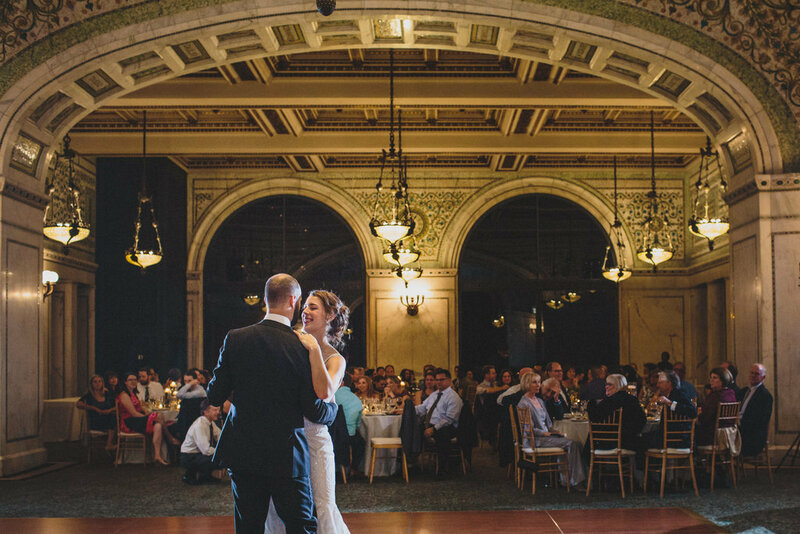 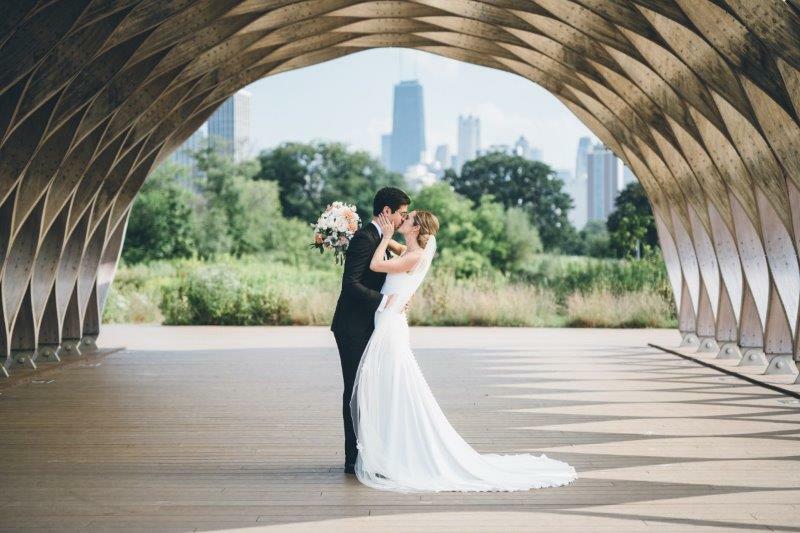 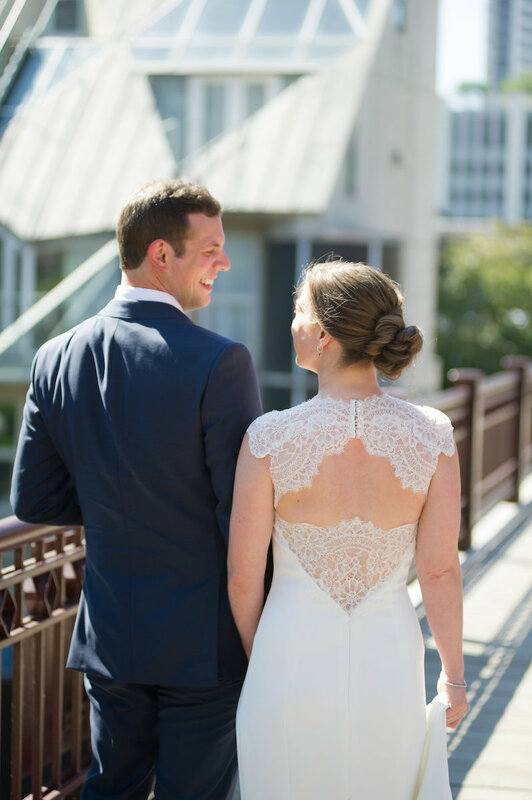 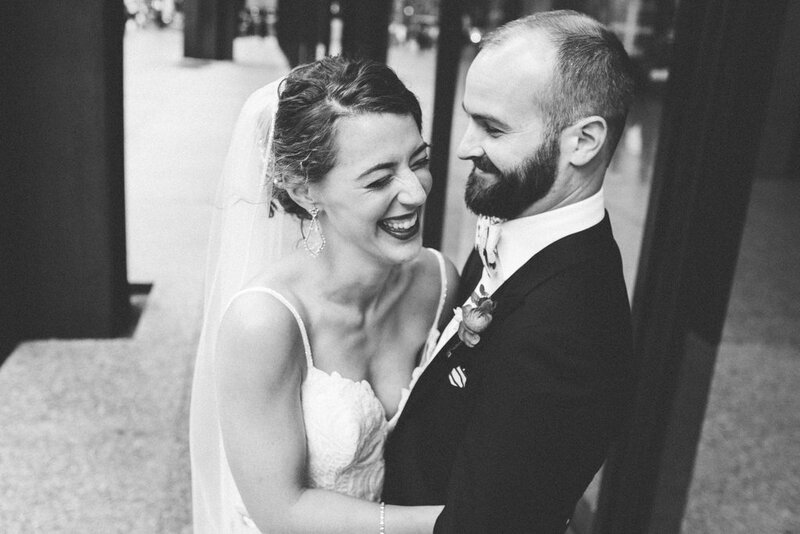 Although the temperature kept everyone a little warmer than we’d have liked, the day was truly the epitome of a fairy tale Chicago wedding. 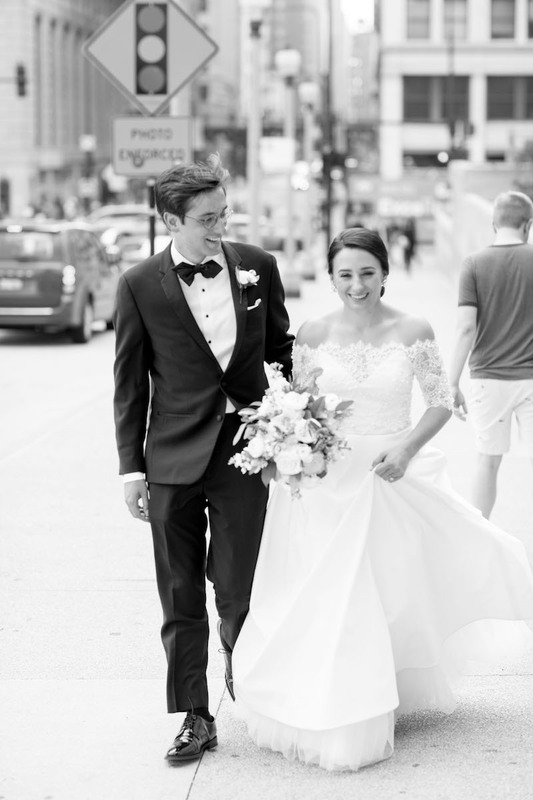 Ed & Aileen Photography was there to capture the day’s festivities from the start. 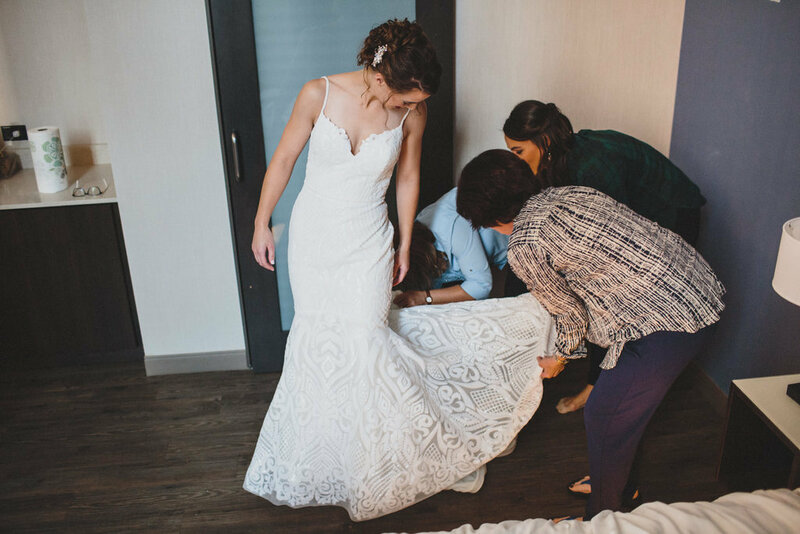 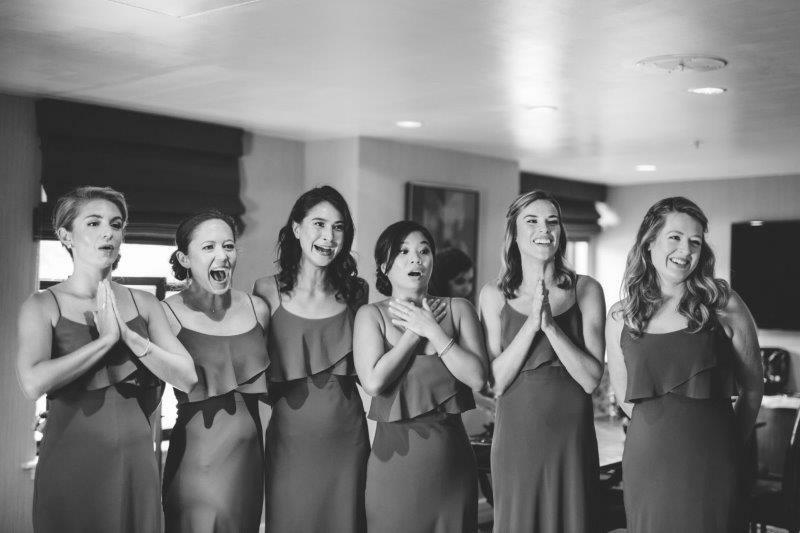 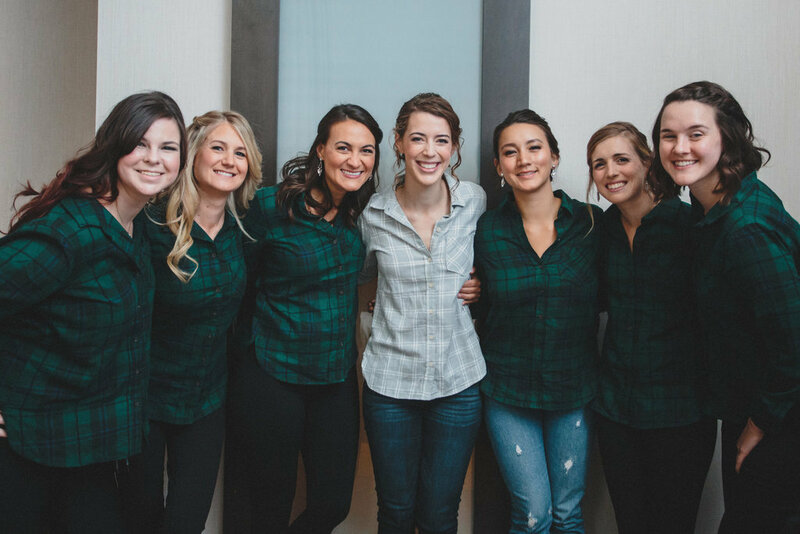 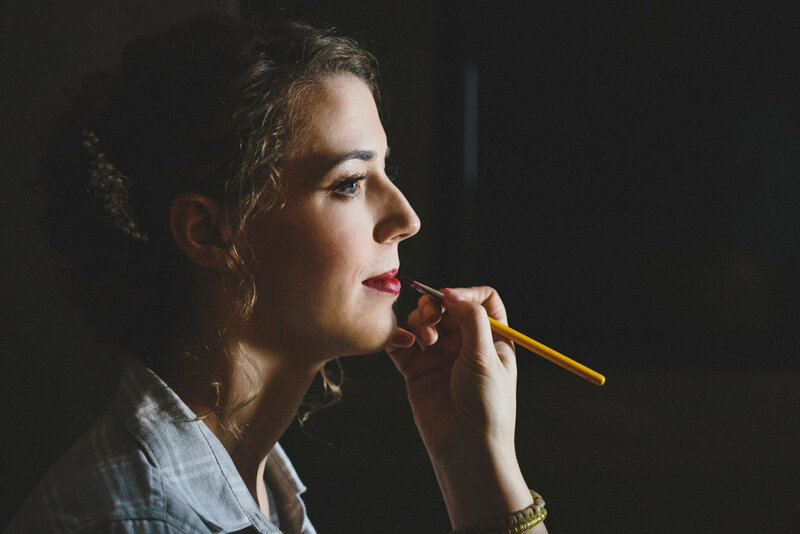 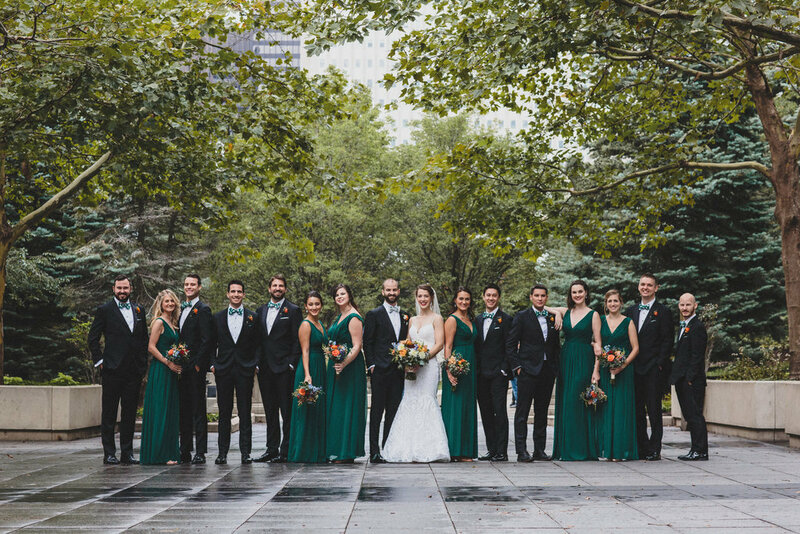 The wedding parties gathered at the Hotel Lincoln for wedding prep where Ania and Erica Janssen provided hair and makeup services for the ladies. 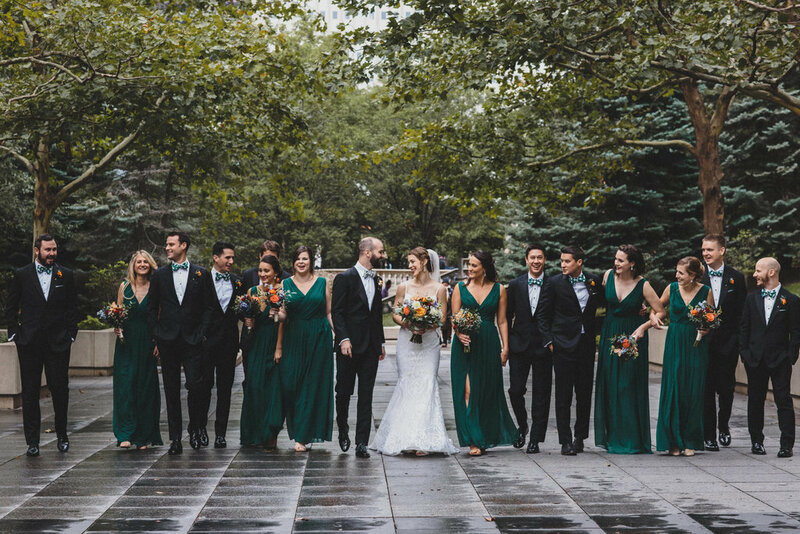 Everyone looked absolutely stunning. 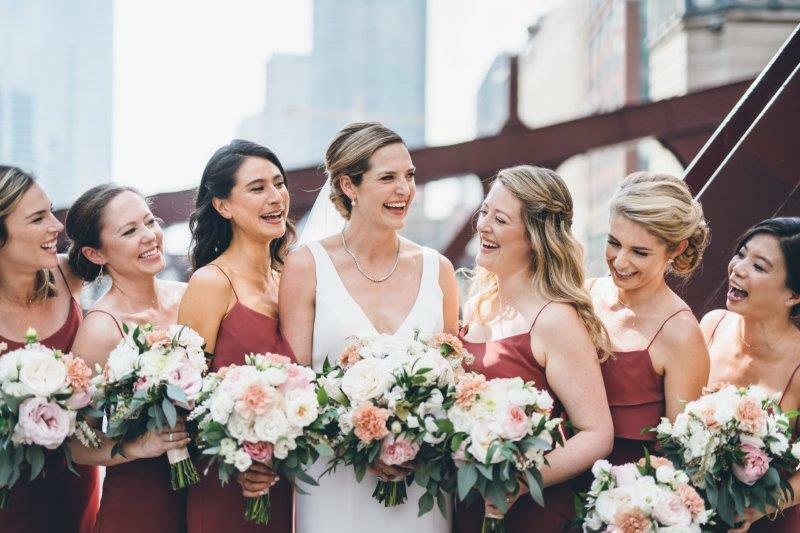 The breezy burgundy bridesmaid dresses were just perfect for the occasion. 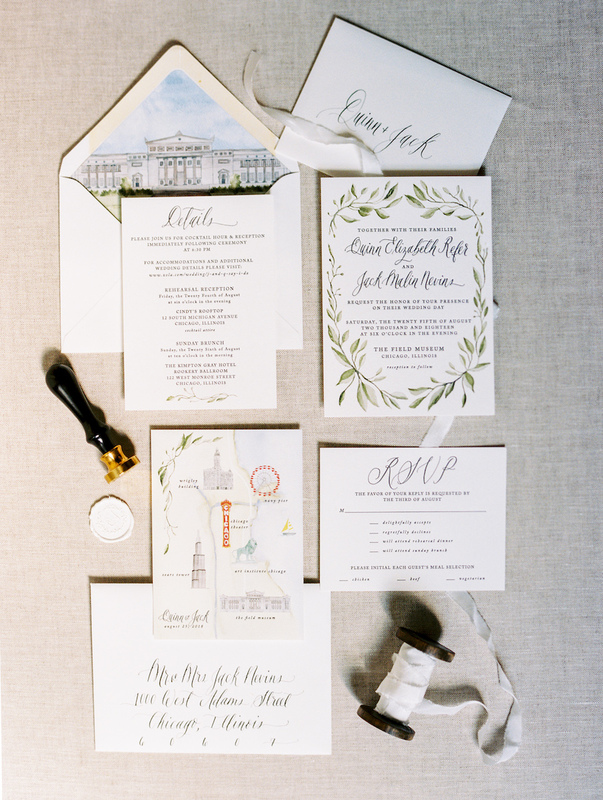 Vale of Enna hand-delivered the (stunning!) 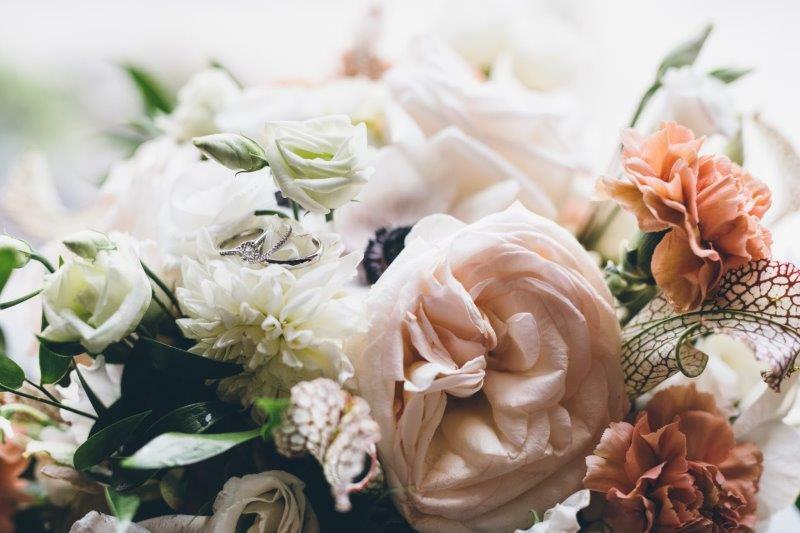 personal flowers. 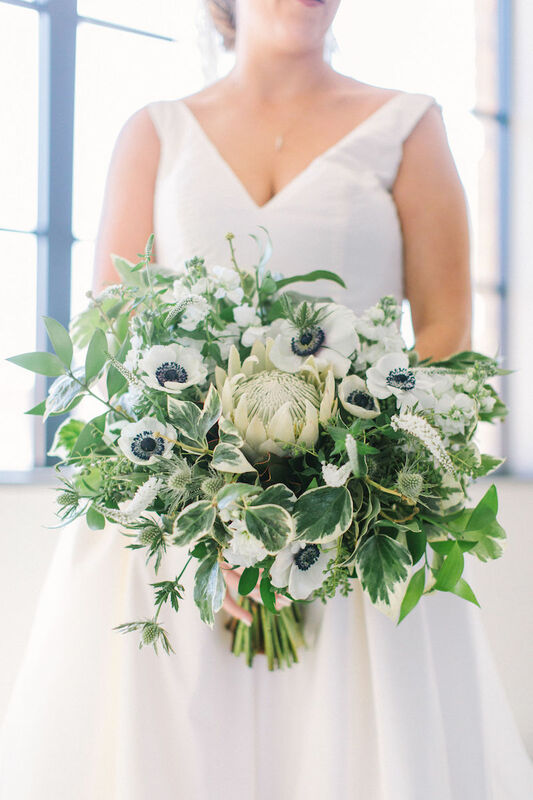 The lush bouquets were filled with ​white dahlias, garden and spray roses, pink protea, coral ranunculus and eucalyptus. 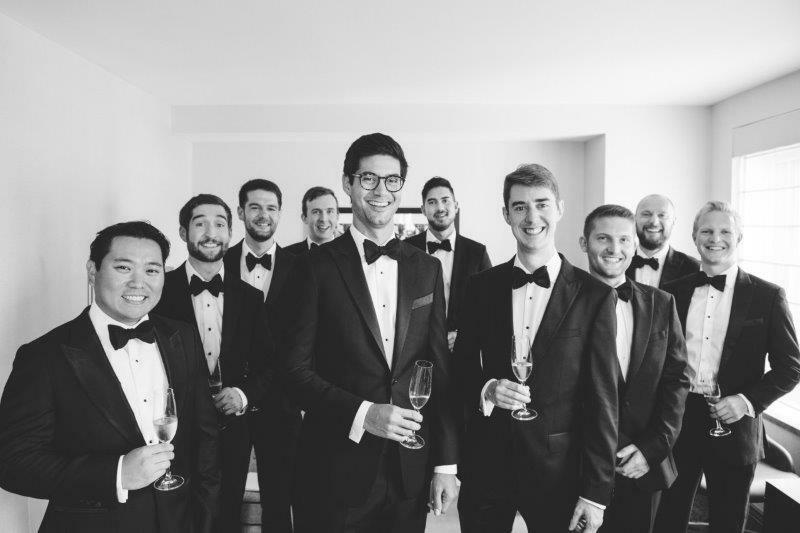 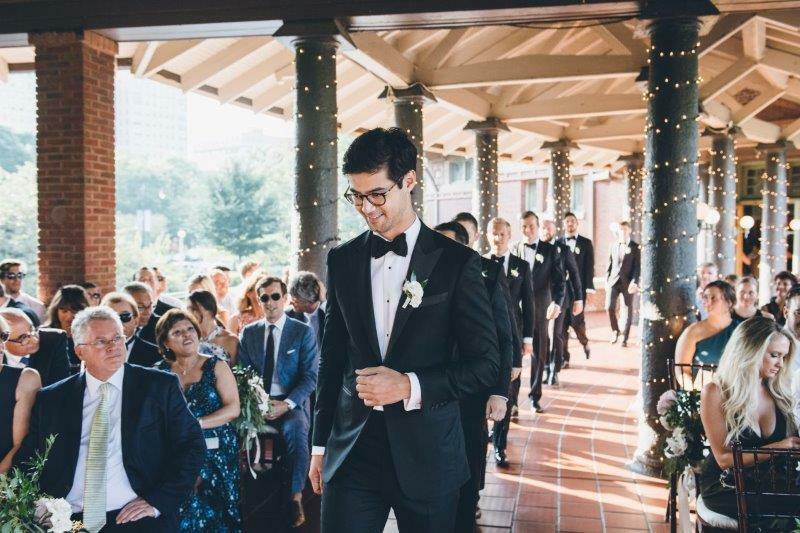 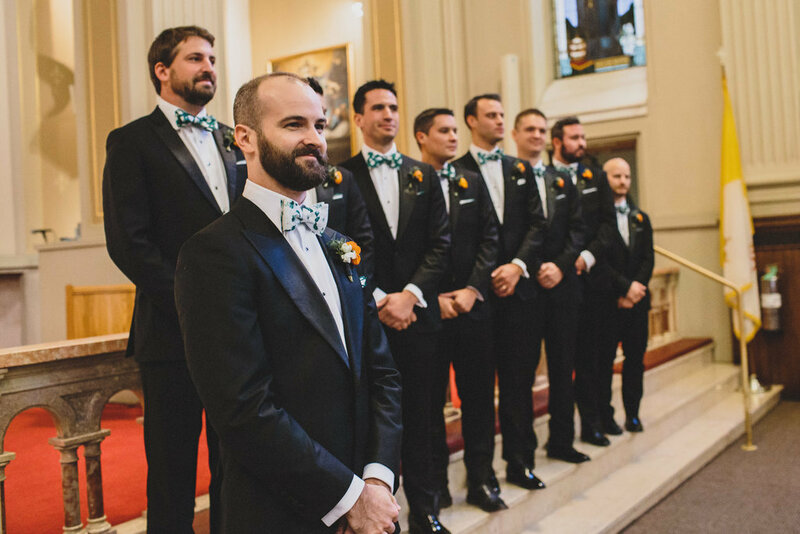 The men kept it light and easy looking dapper as ever in their tuxes. 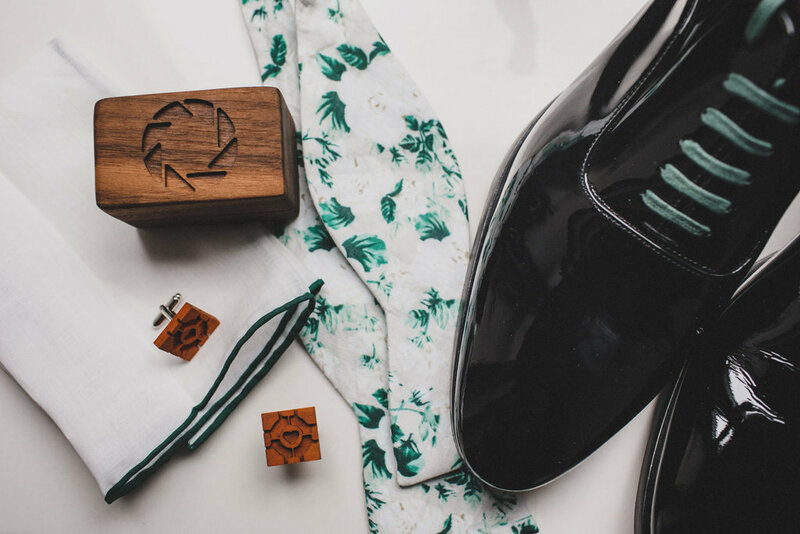 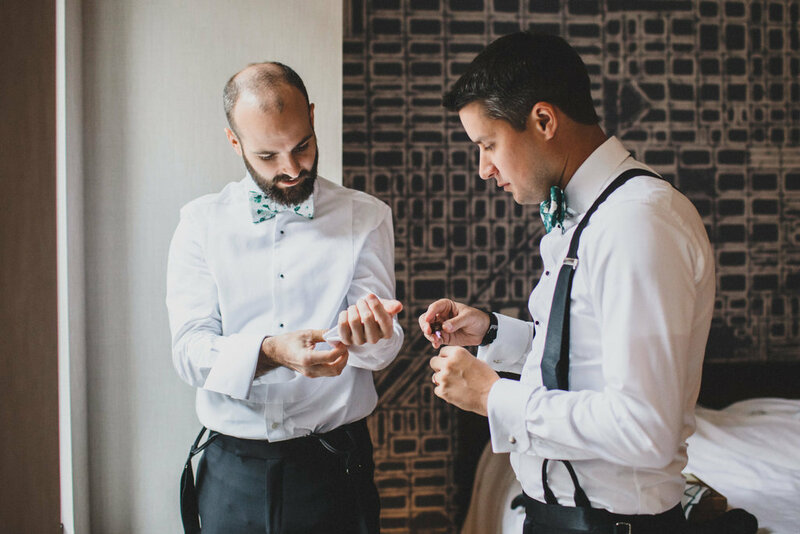 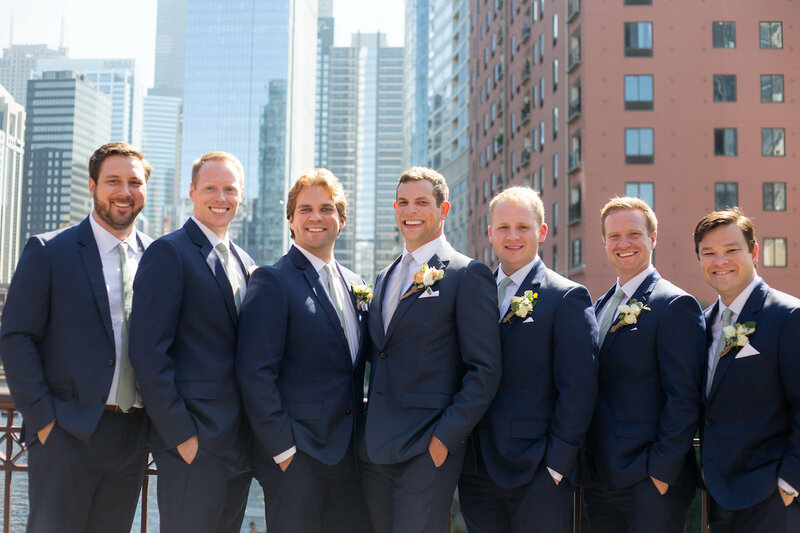 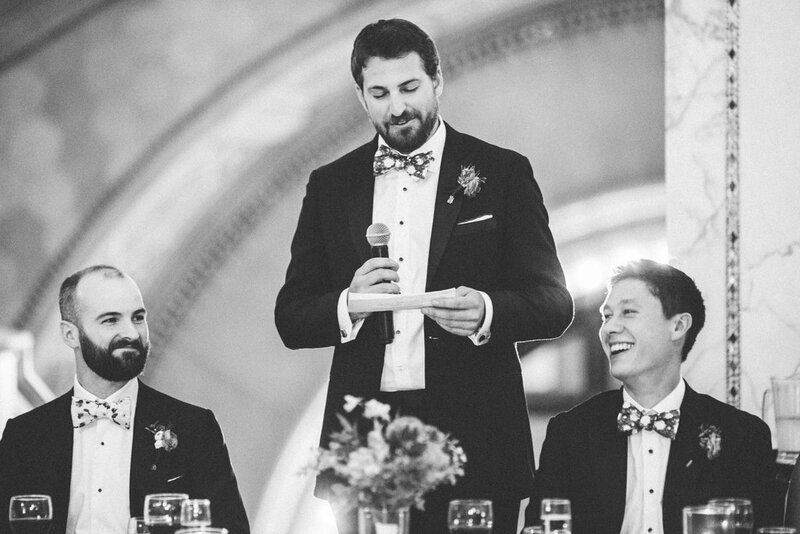 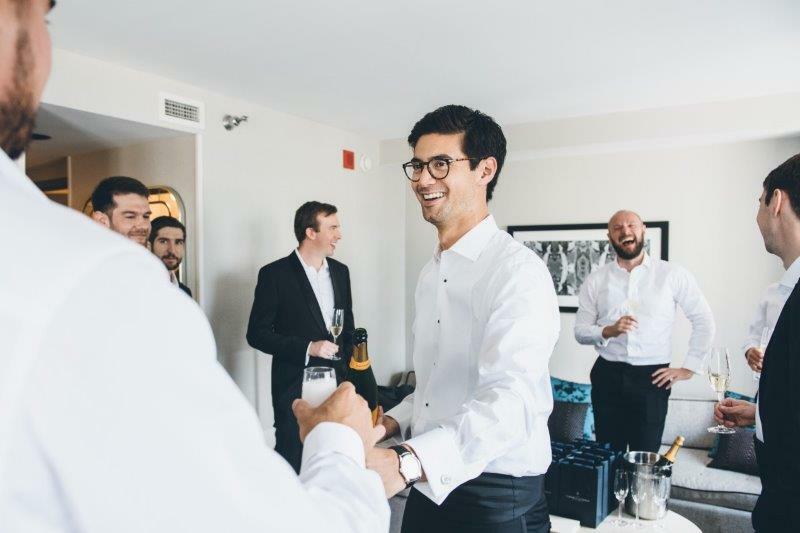 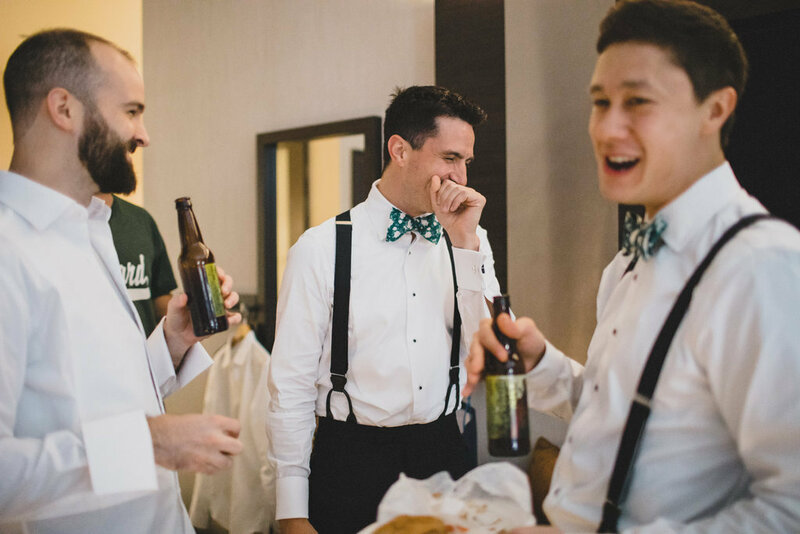 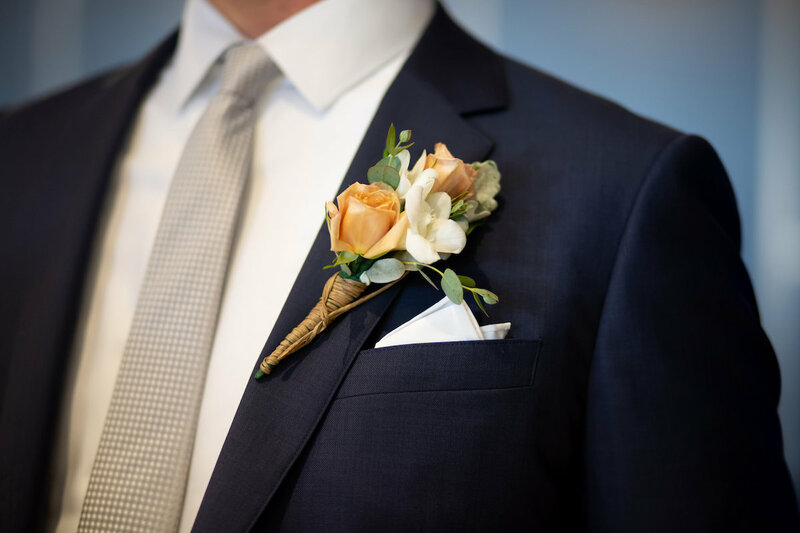 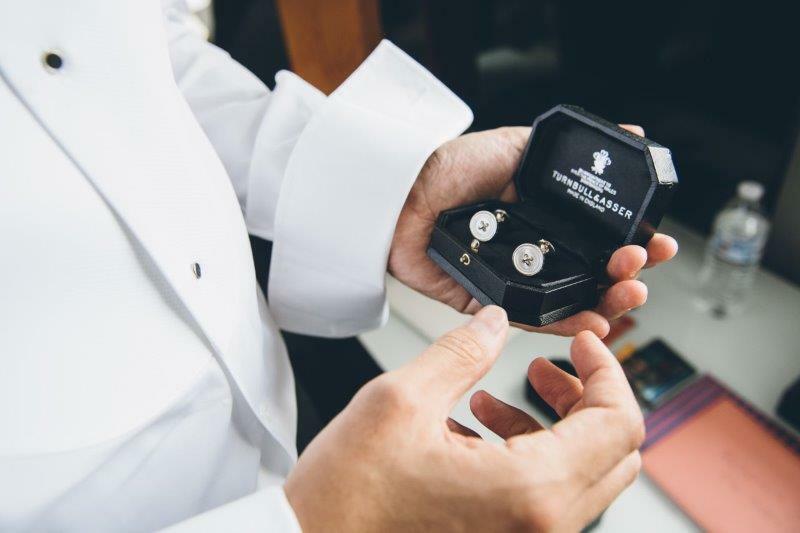 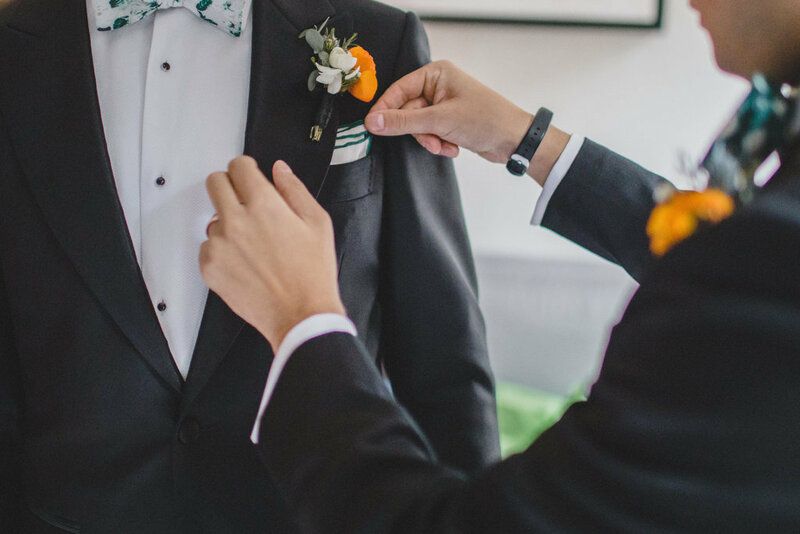 Jeremy gifted each of his groomsmen with a handsome set of cufflinks; the perfect touch to tie it all together! 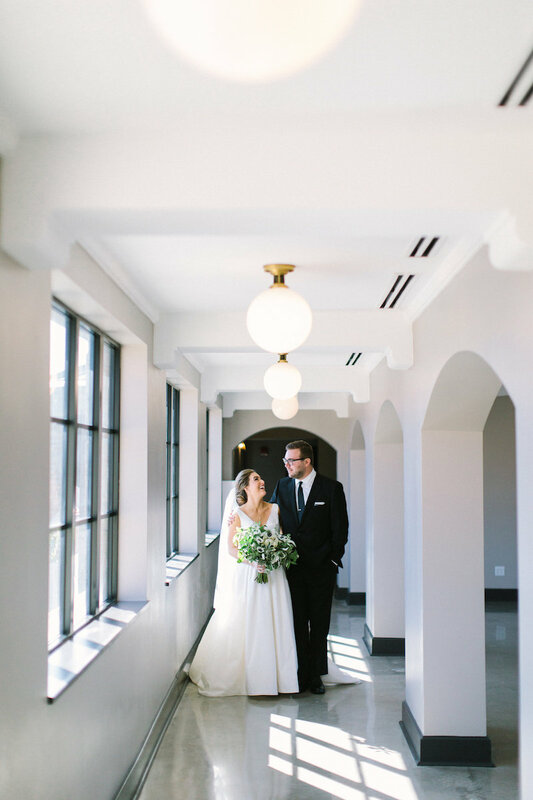 The morning moved quickly and soon it was time for Jeremy and Rebecca’s first look. 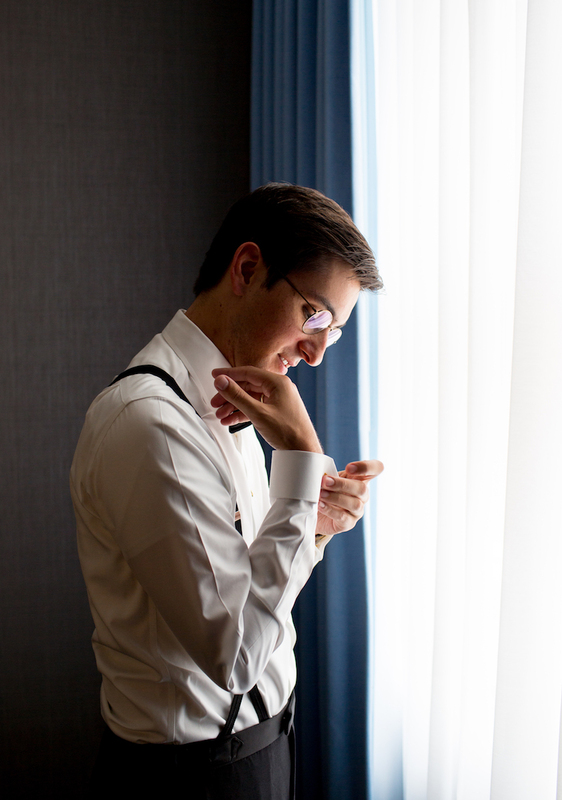 Jeremy staged in the park across the street from Hotel Lincoln to await his beautiful bride. 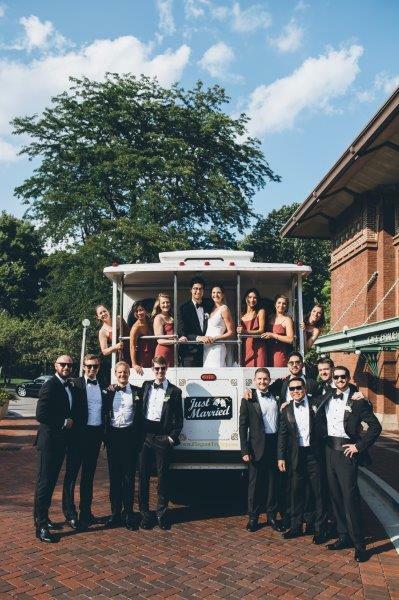 As first look photos were snapped, Absolute Dream Trolley was ready to take everyone around the city for photos while simultaneously acting as a cooling station for the couple and their squad. 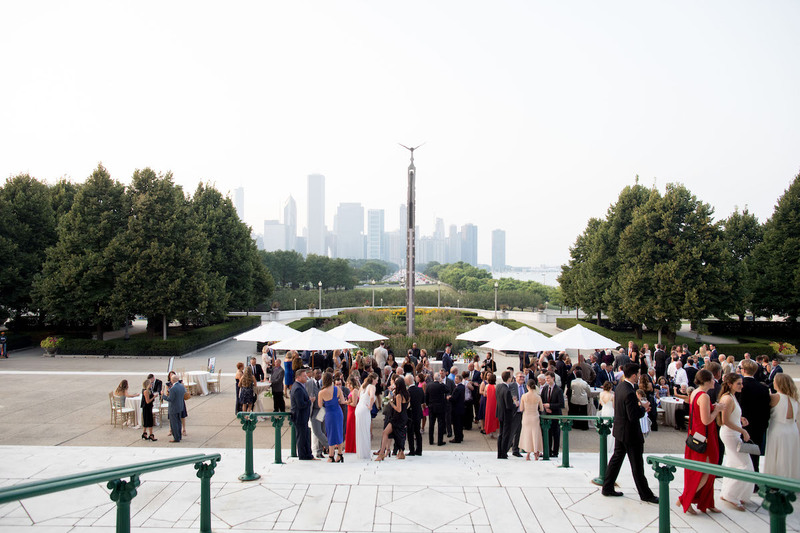 Chicago’s landscaping and backdrops did not disappoint. 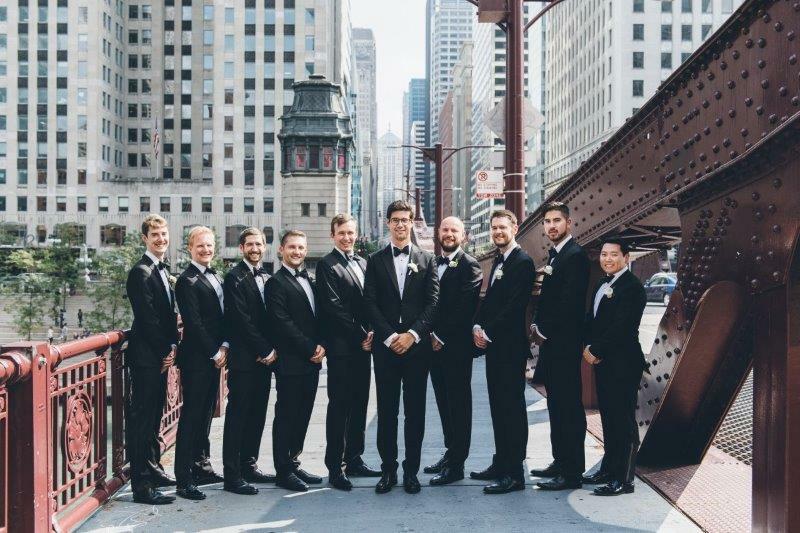 The wedding crew made the 100+ temps look better than anyone ever could have hoped for. 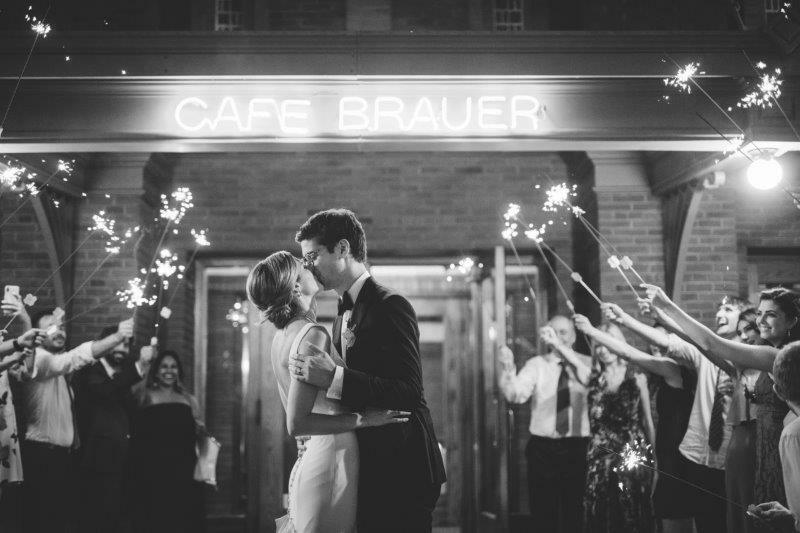 Final stop, Café Brauer. 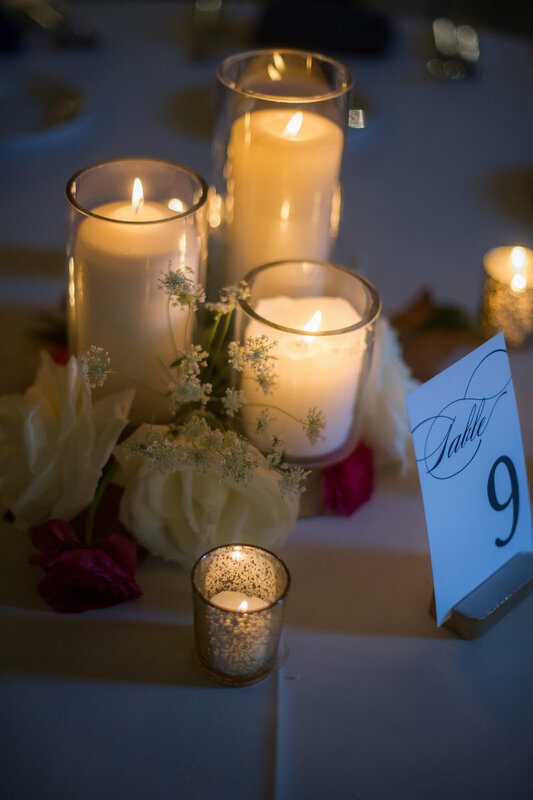 The countdown to the ceremony was on as final touches were put into place. 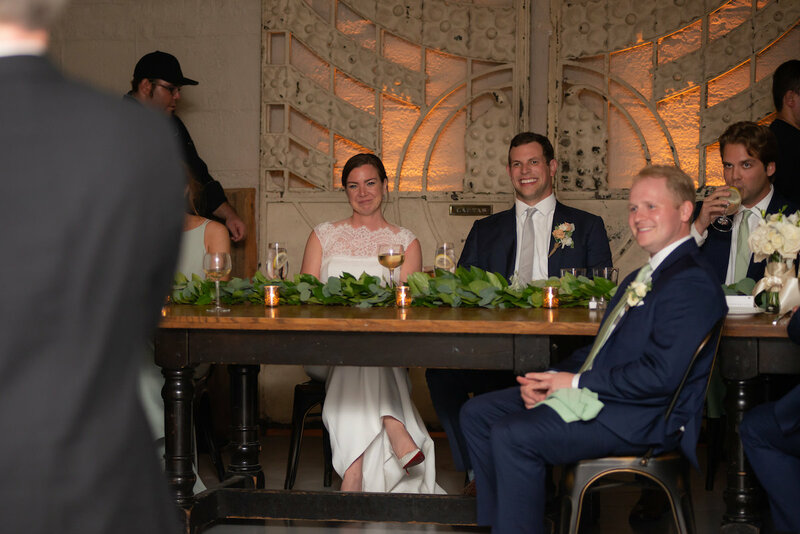 Sheri Reda from Flow Ceremonies led a heartfelt ceremony that could not have been more romantic and perfect. 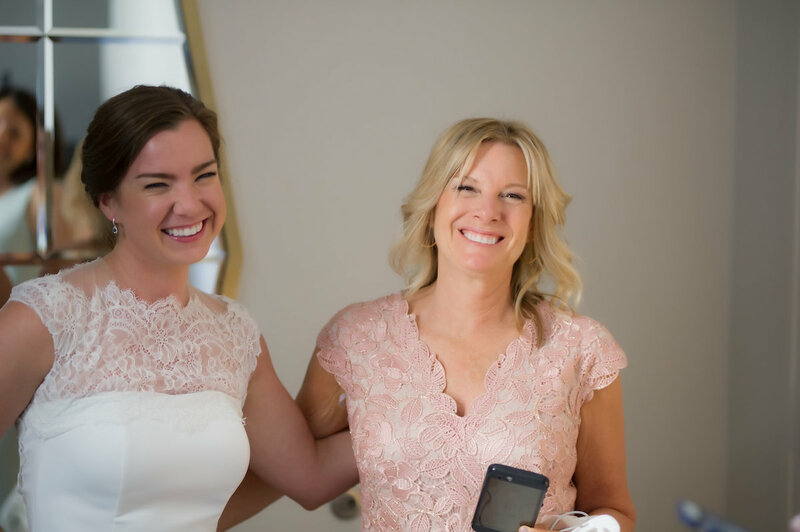 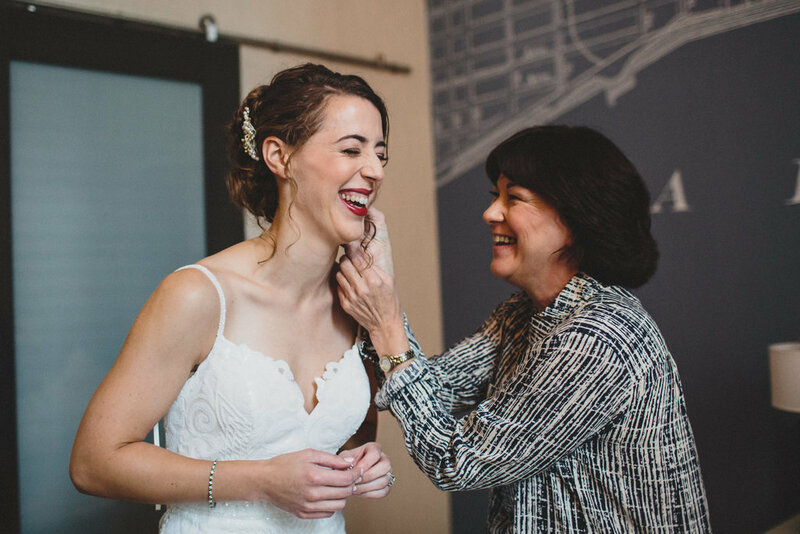 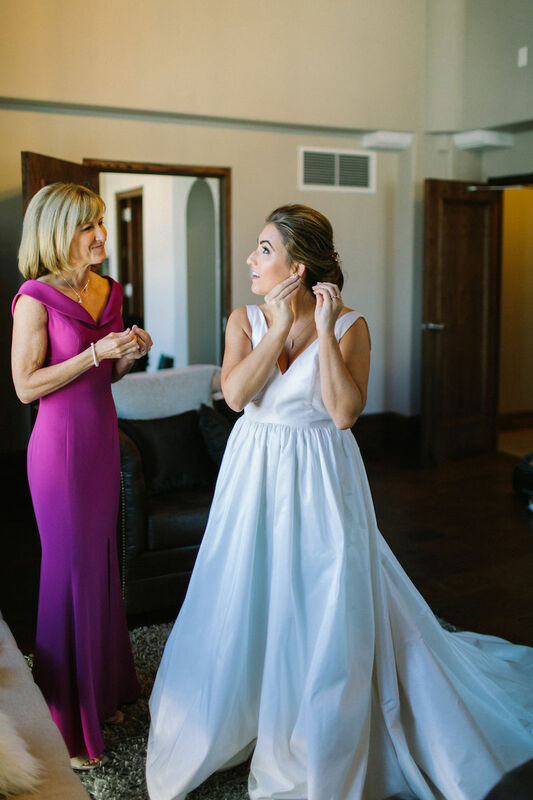 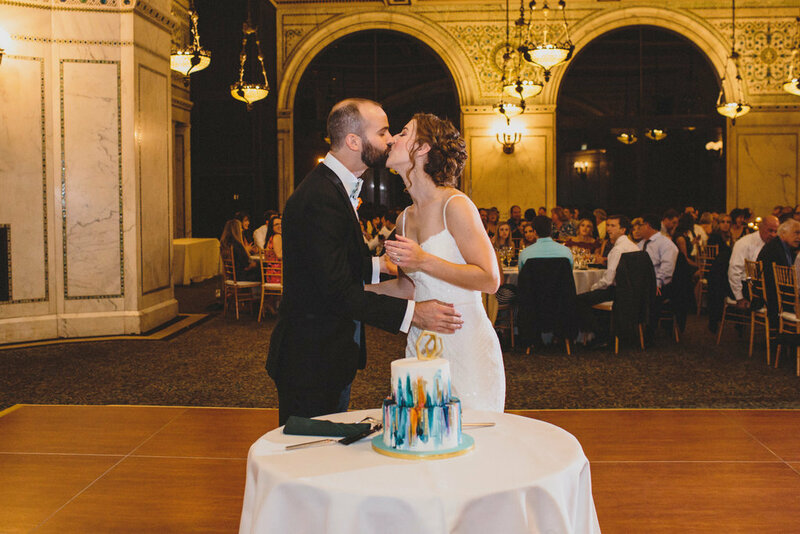 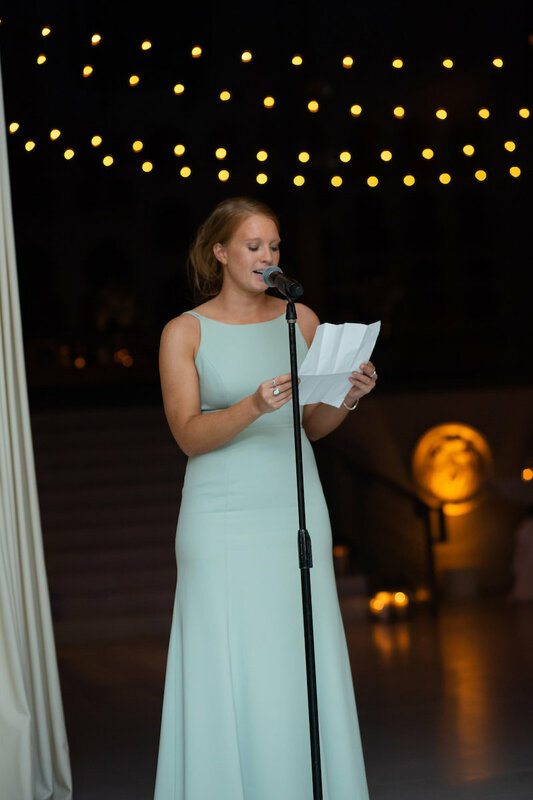 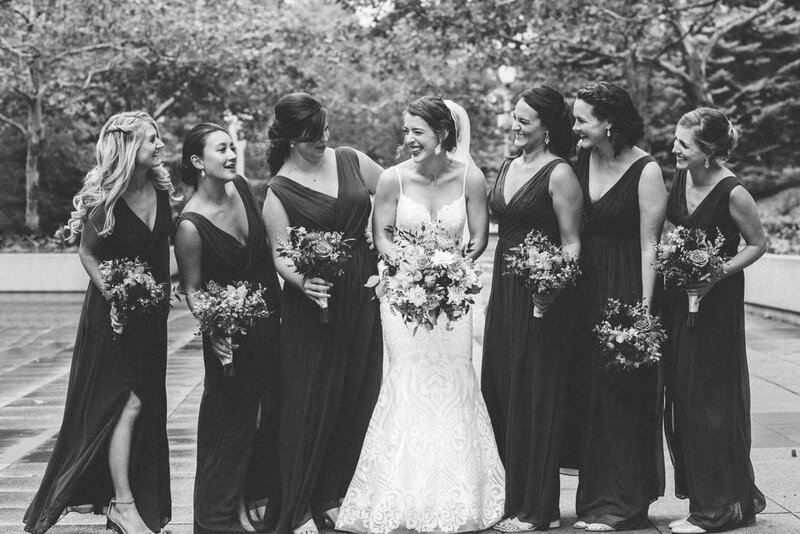 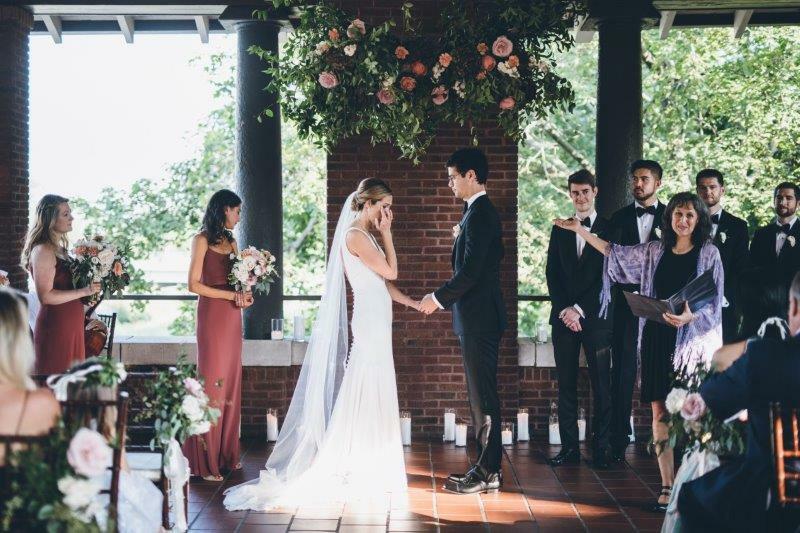 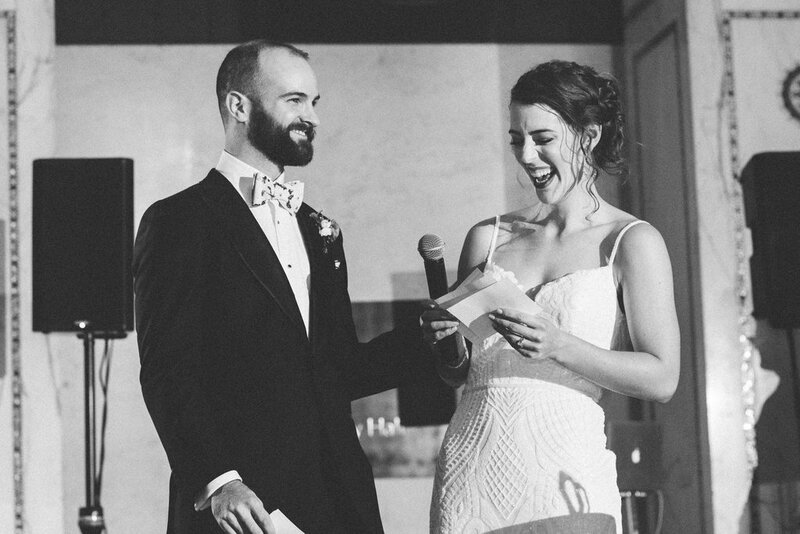 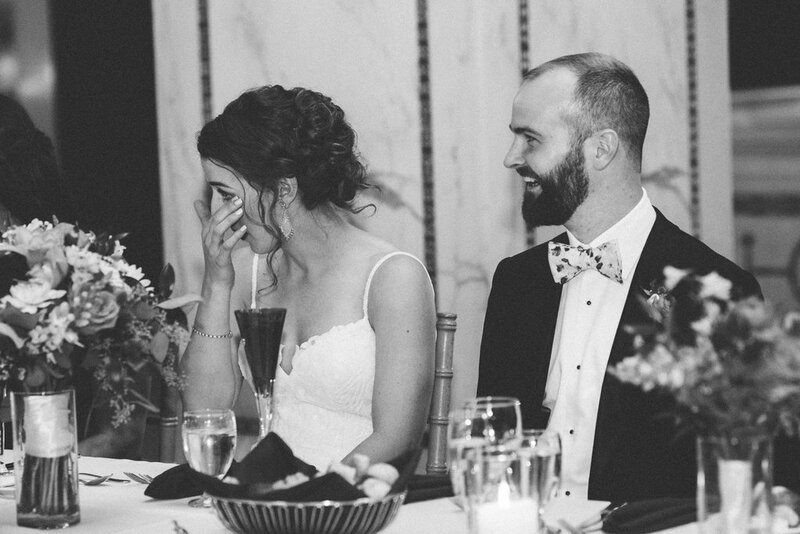 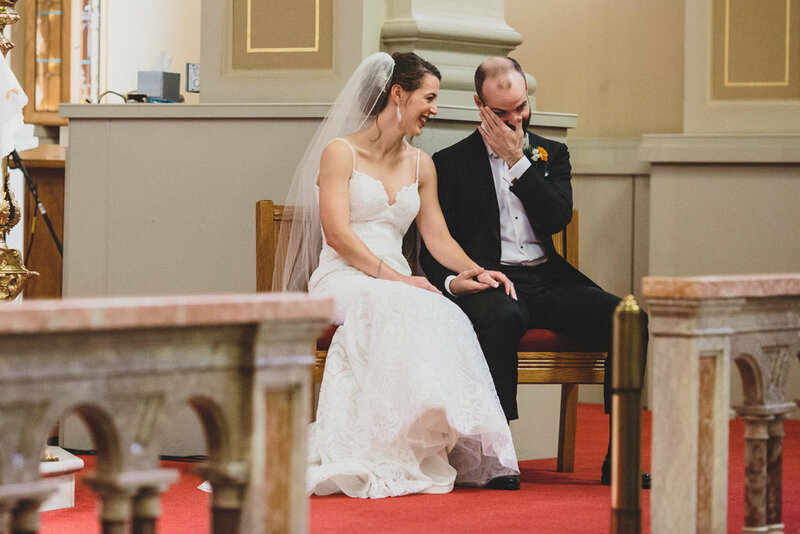 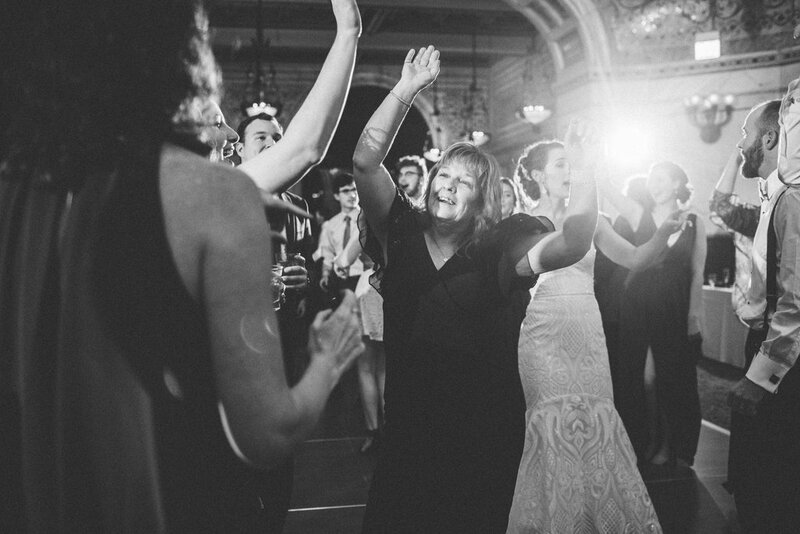 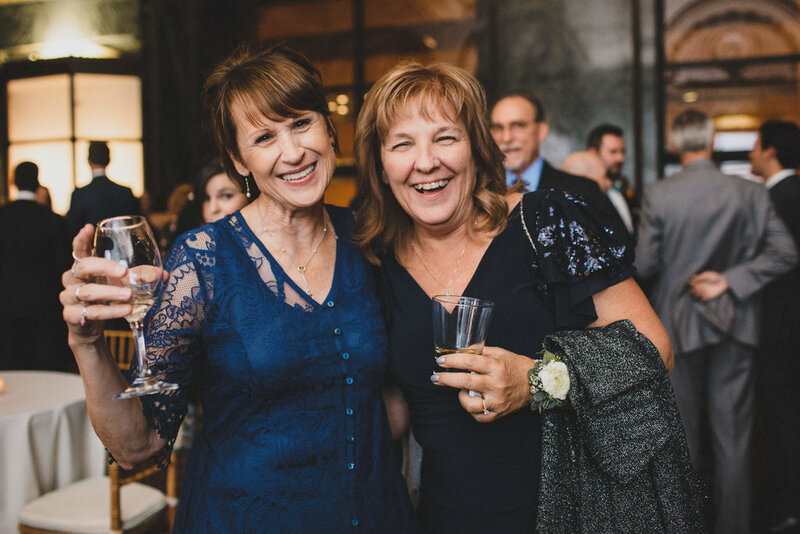 Her words left hearts swelling as she brought guests from tears to laughter. 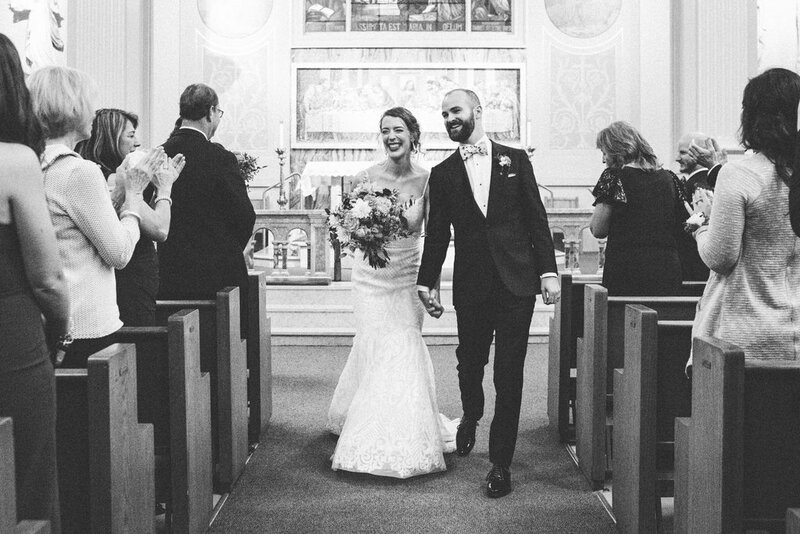 At the end of the ceremony, we welcomed the new Mr. and Mrs.! 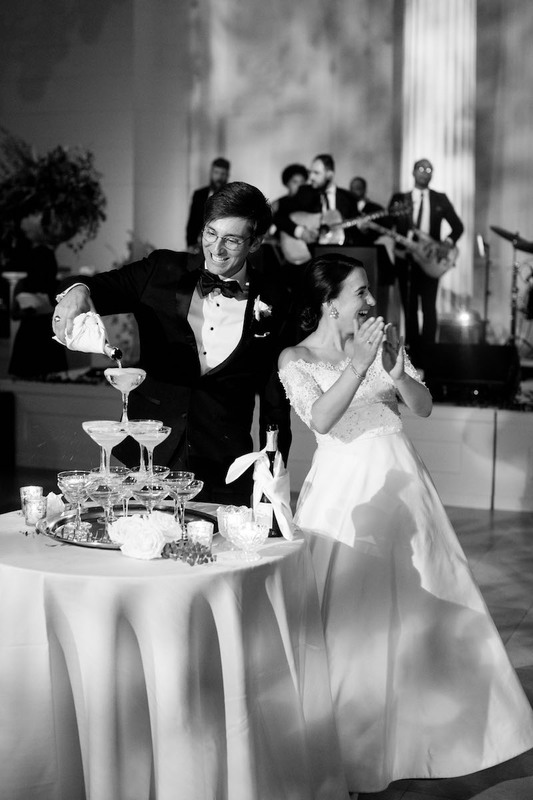 Finally, it was time to let loose and celebrate the gorgeous couple! 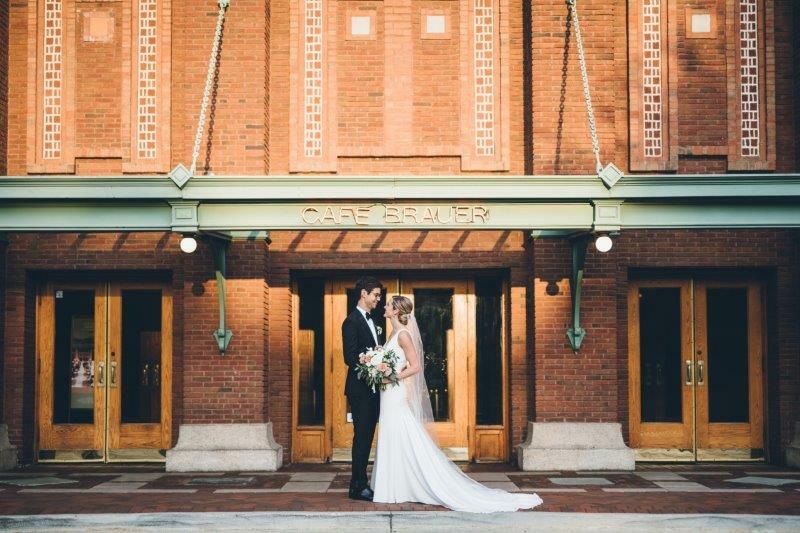 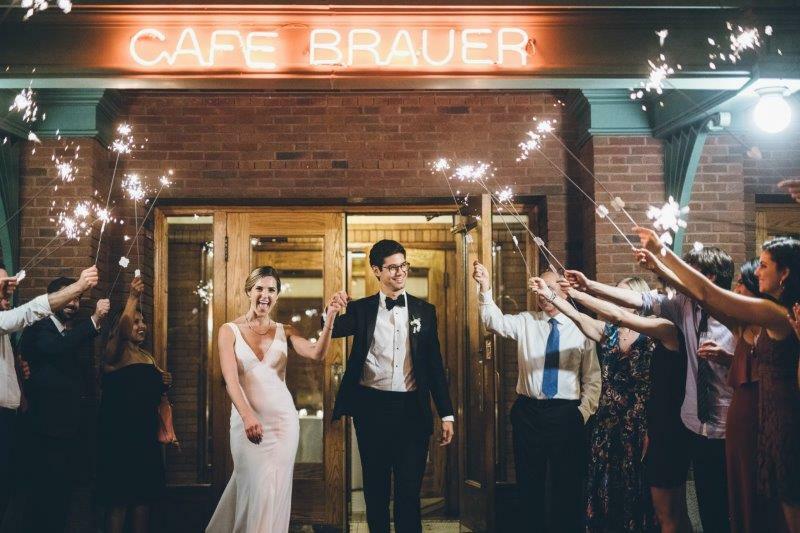 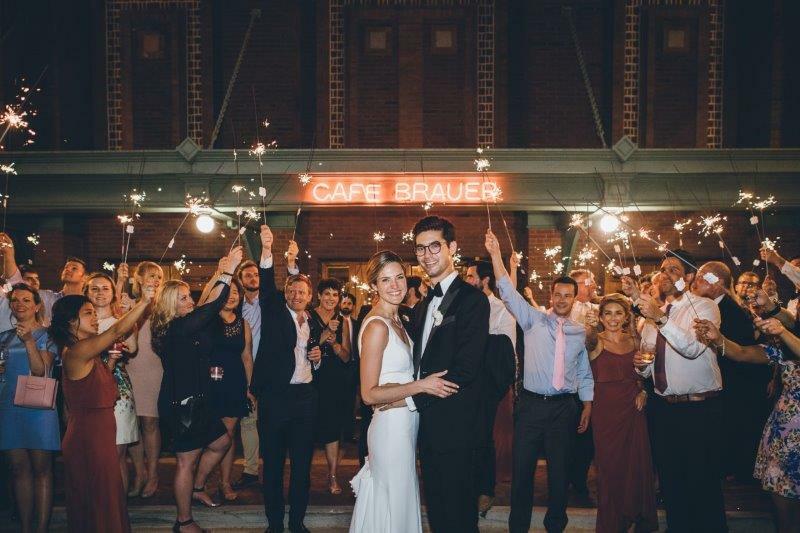 Café Brauer looked magnificent on this warm summer night. 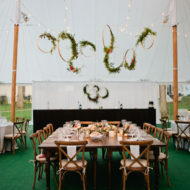 Dinner from Tigerlily was exceptional. 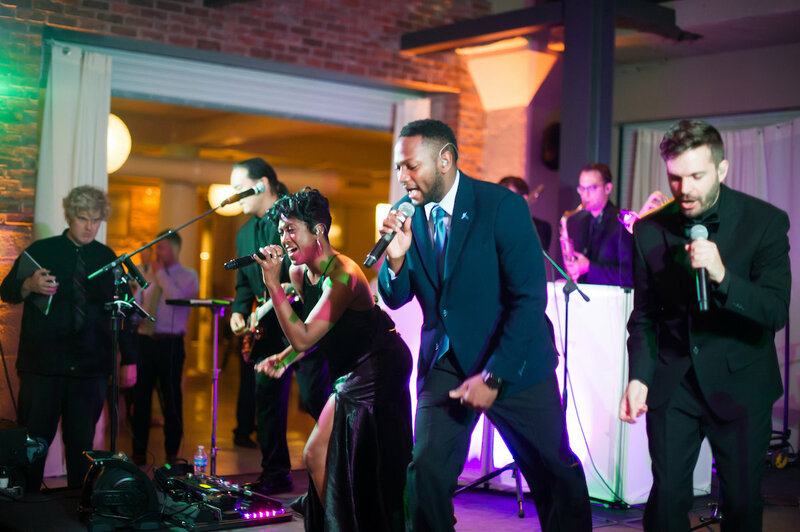 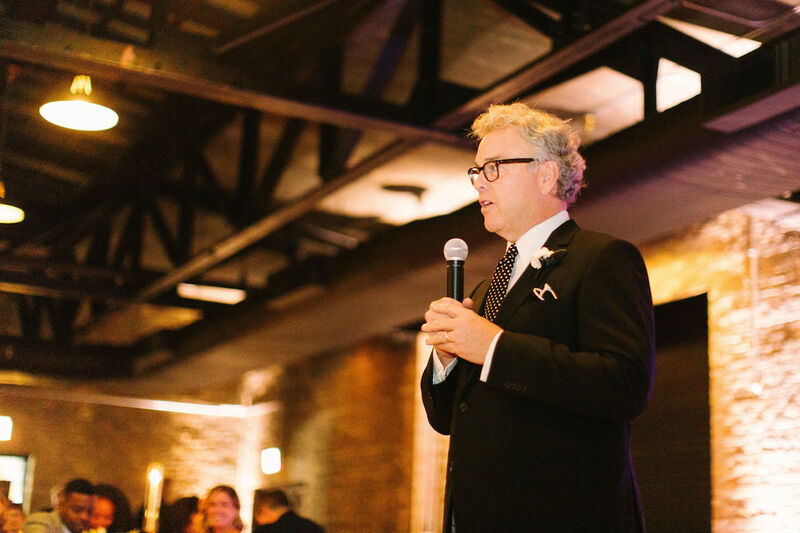 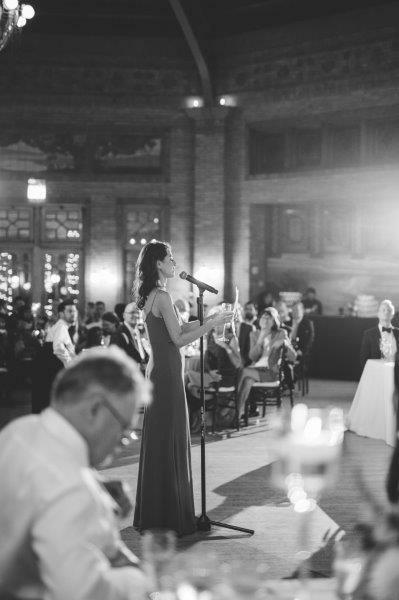 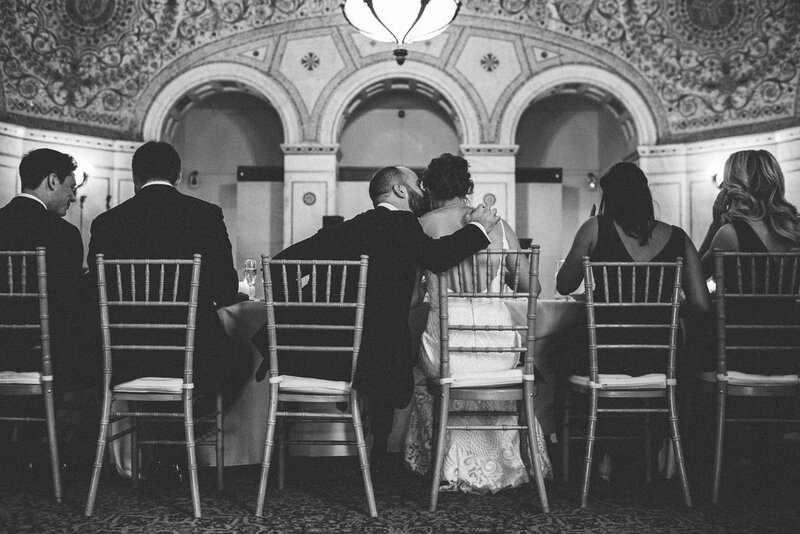 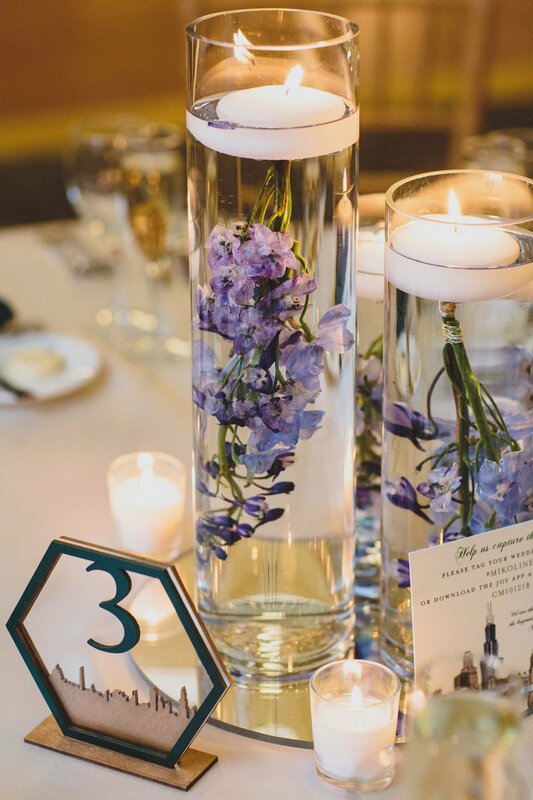 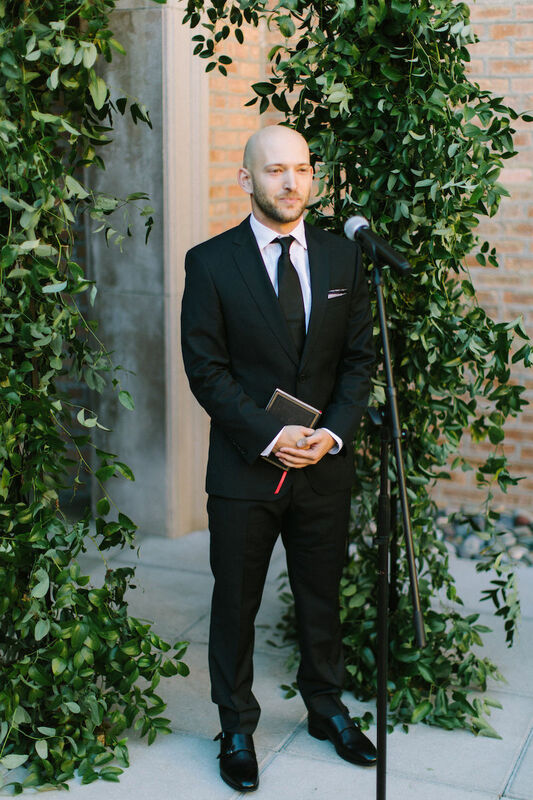 All was in place as Sway Chicago kicked off dinner with the wedding party announcements. 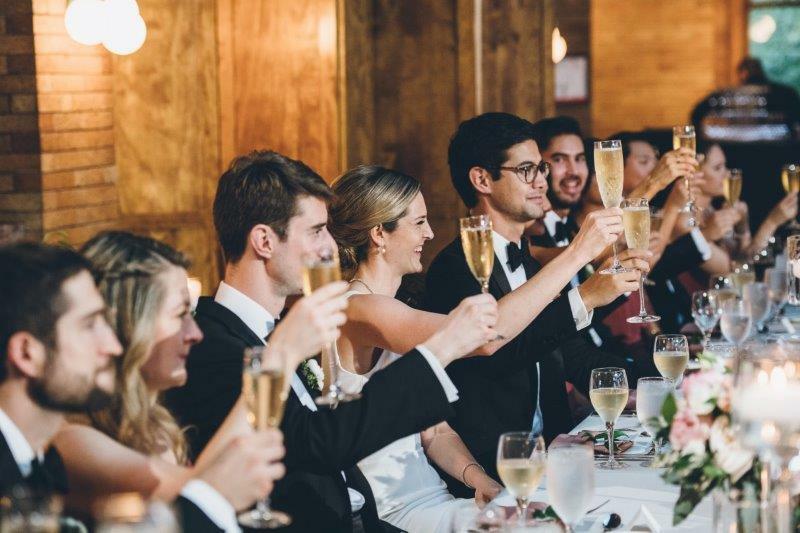 The toasts were as entertaining as the food was delicious. 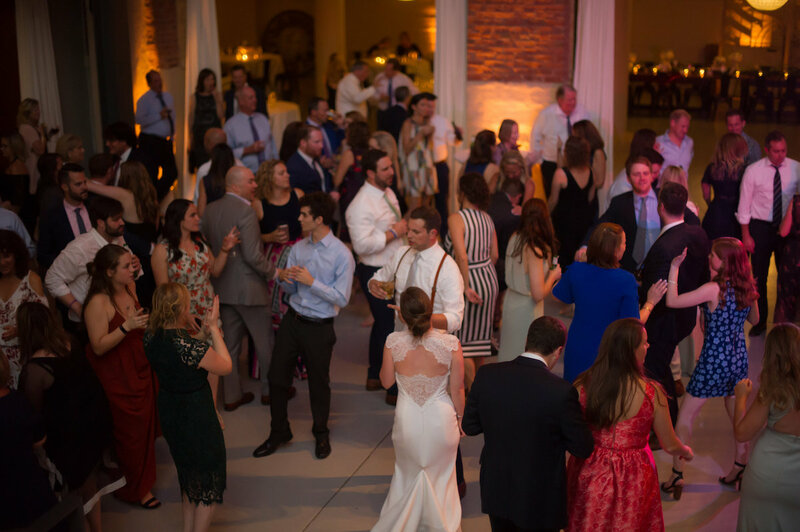 As soon as the meal was complete, the crowd was out of their seats dancing the night away. 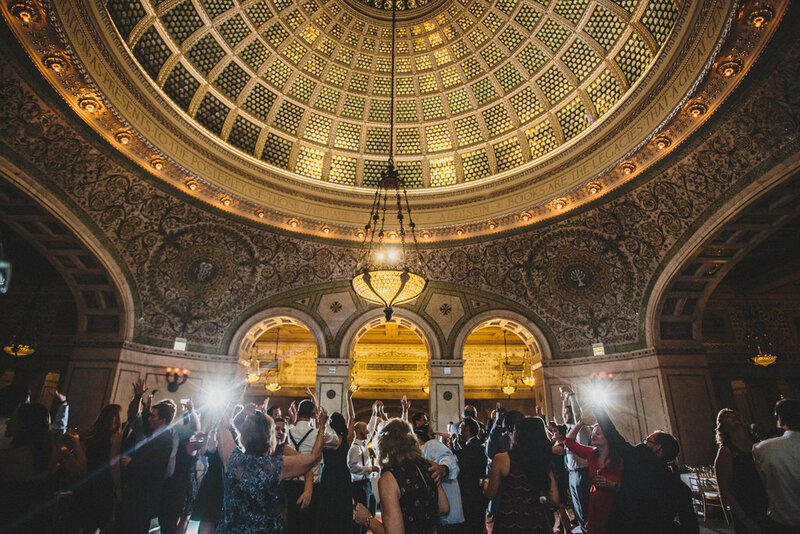 Sway Chicago kept the party abuzz until the very last song. 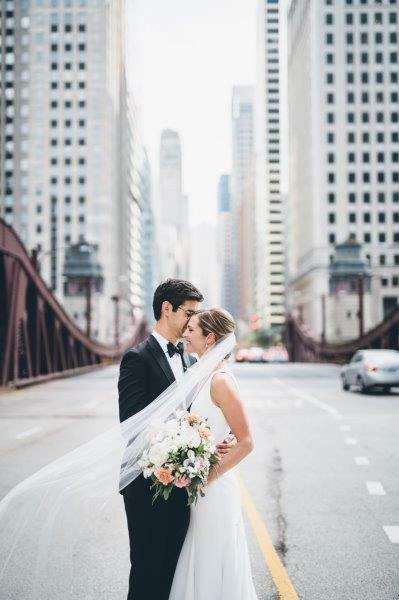 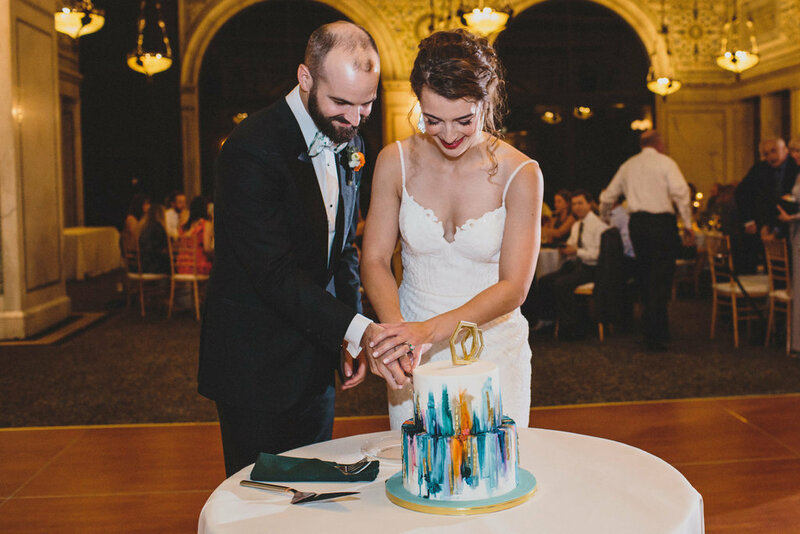 The final touch to a picture perfect day and couple was an unforgettable evening sparkler send-off followed by a Windy City Limo bus ride back to local hotels. 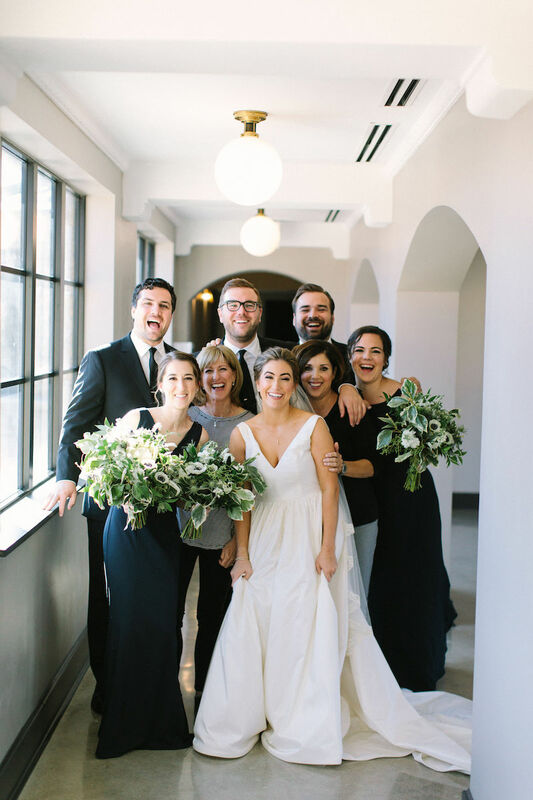 Rebecca, Jeremy and their families were an absolute joy to work with. 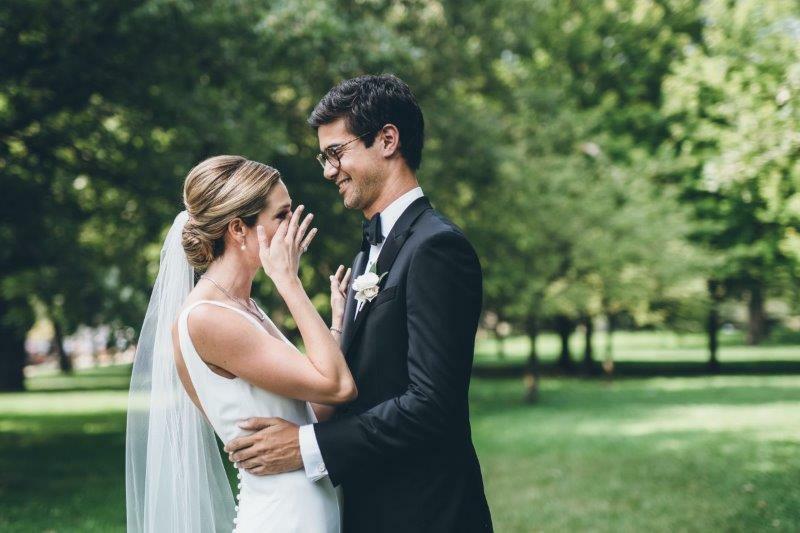 We wish them all the very best in life, love and happiness! 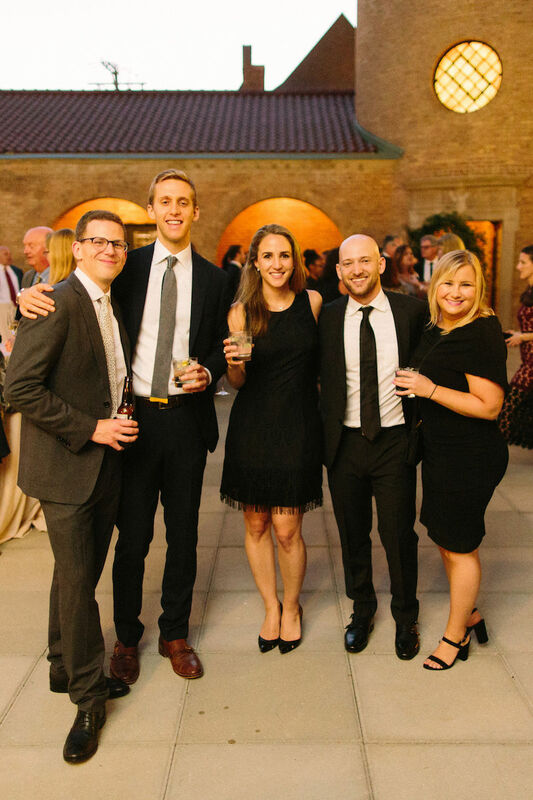 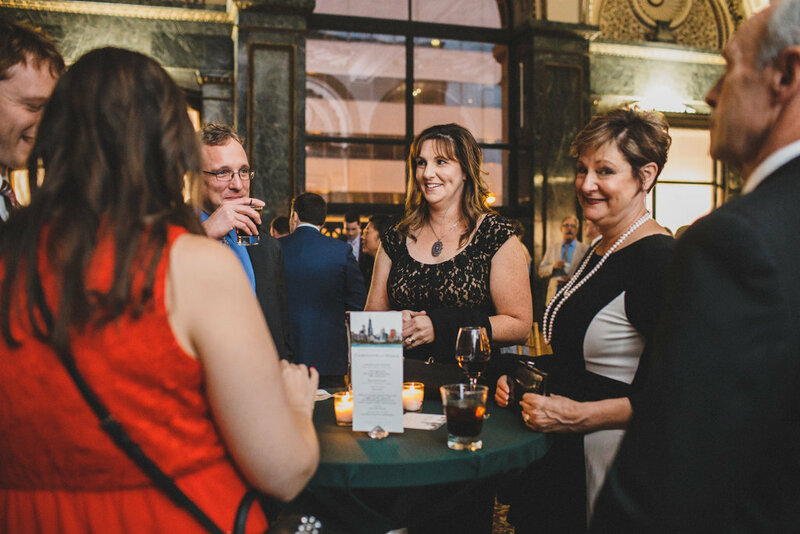 One of my favorite things about working at Five Grain Events is the sense of community we work hard to foster with our team, other vendors in our industry, and especially–our clients. 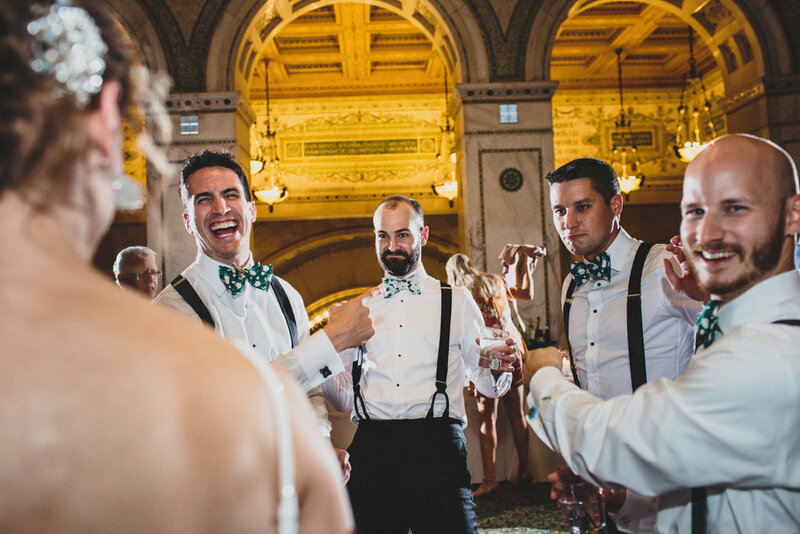 Allison and Stephen’s wedding was no exception. 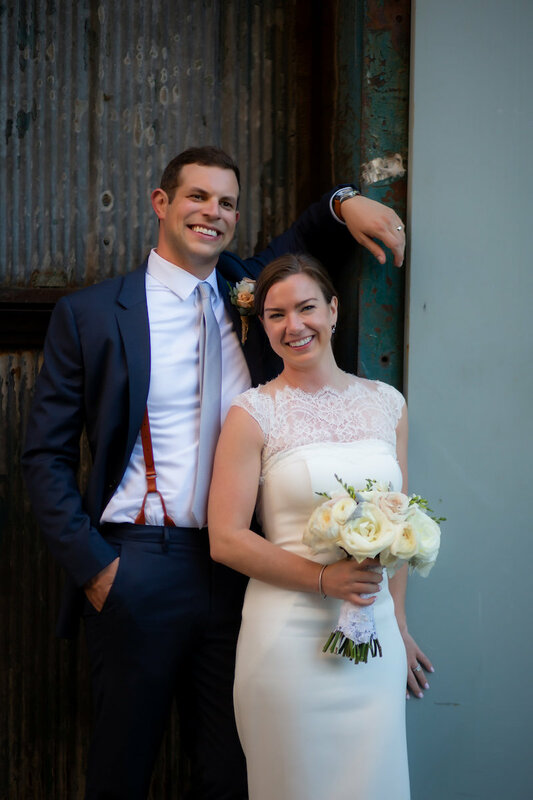 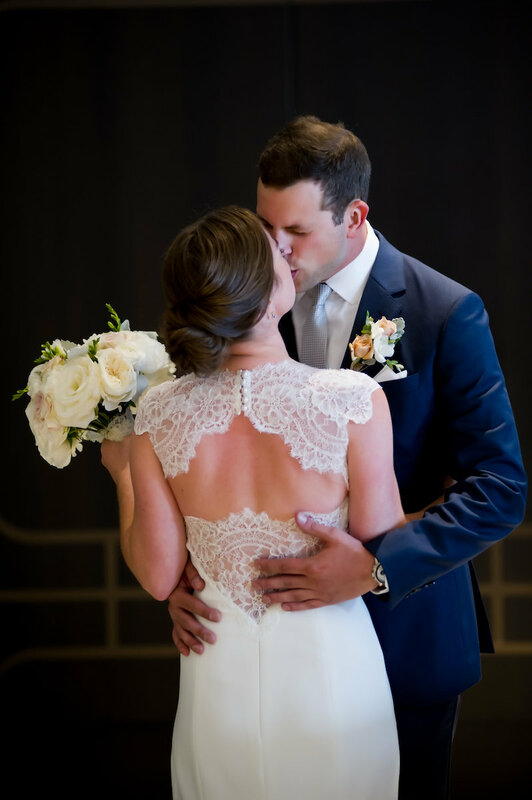 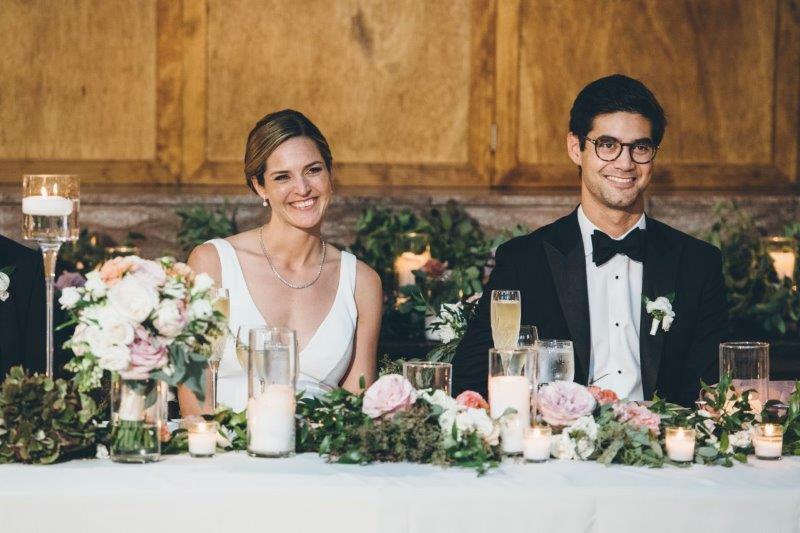 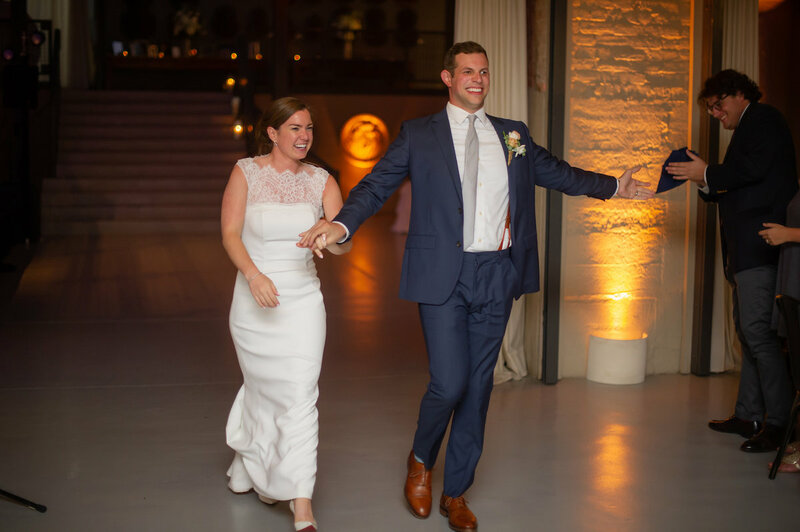 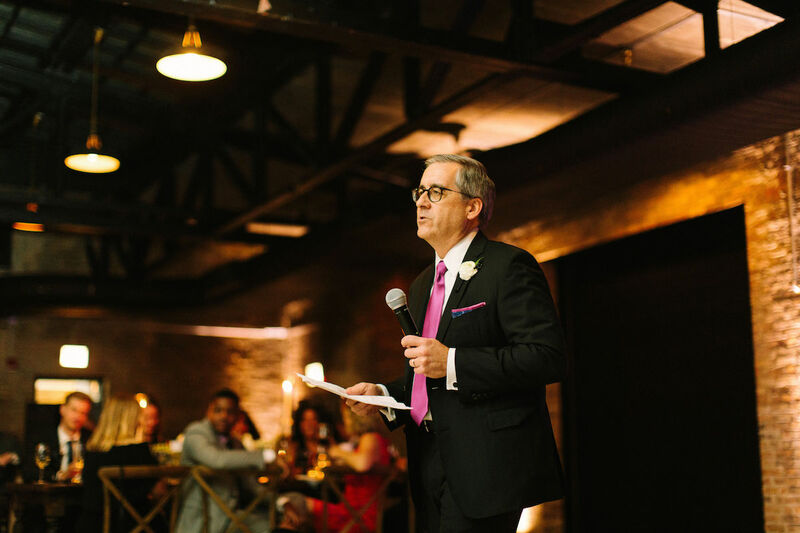 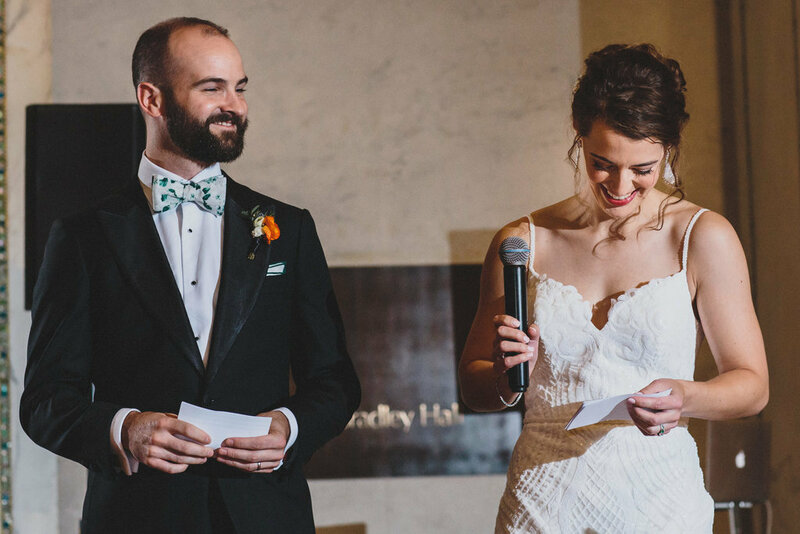 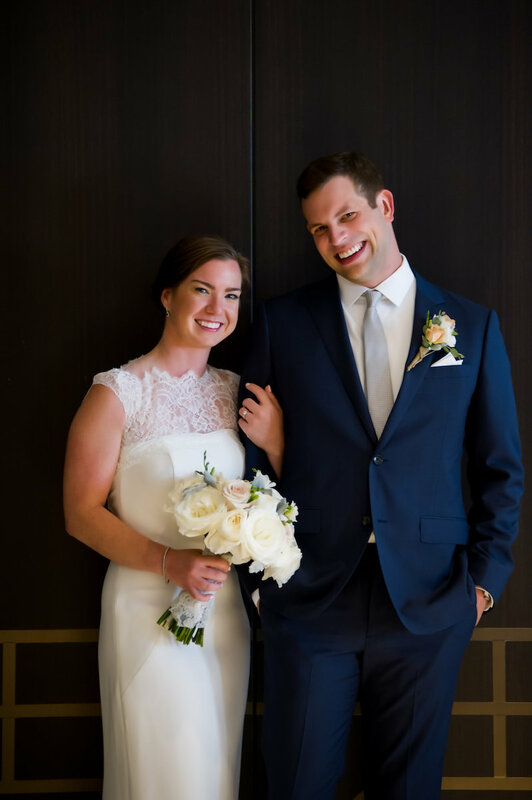 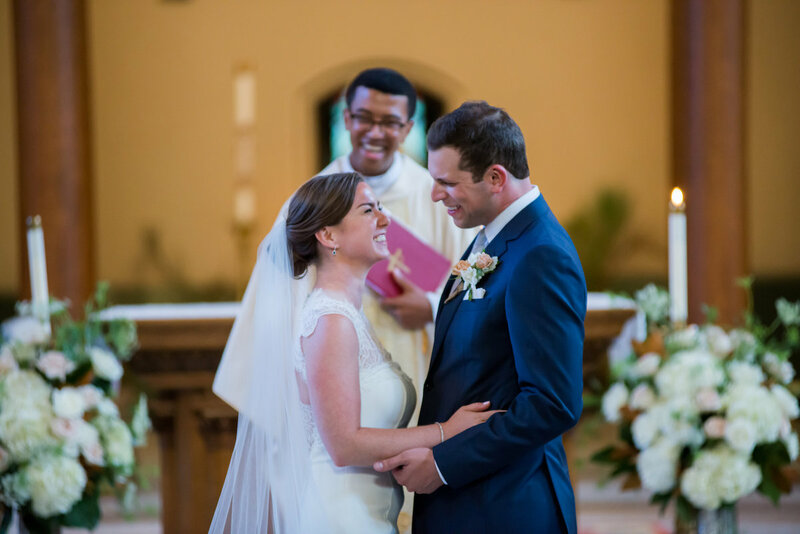 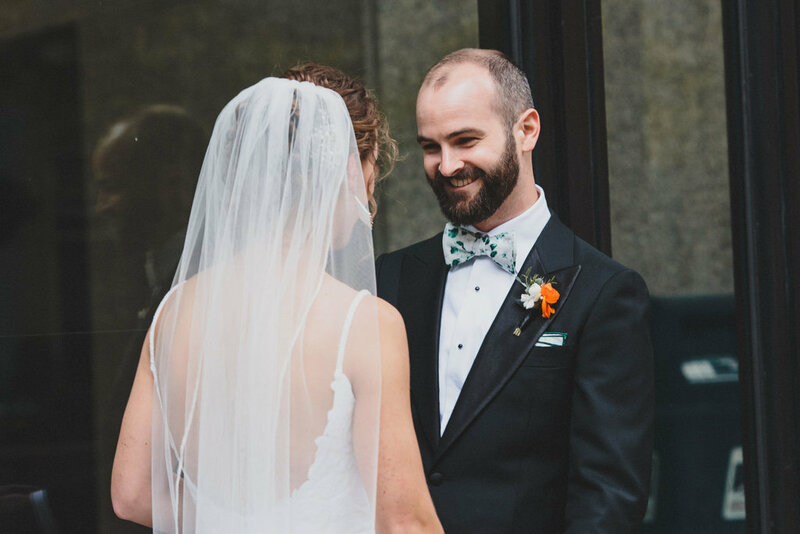 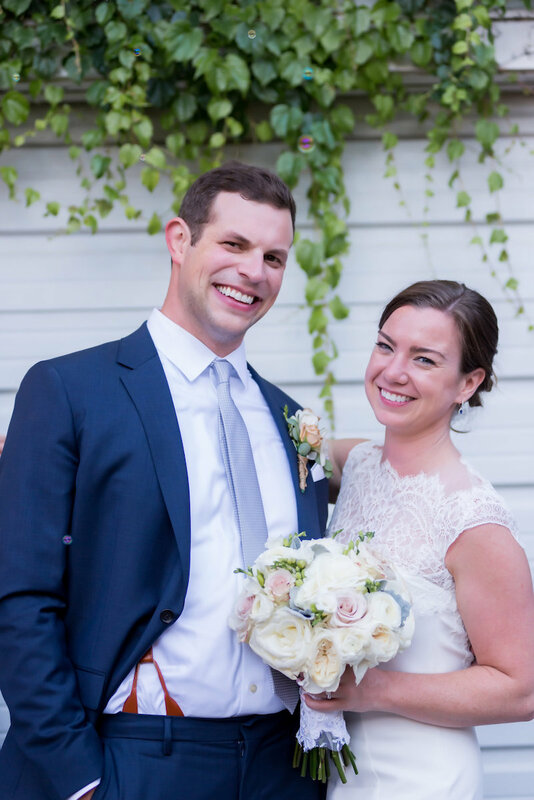 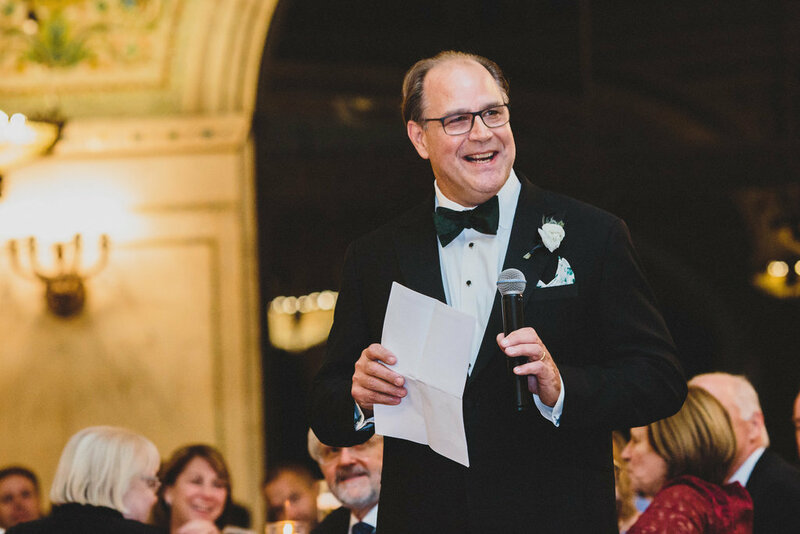 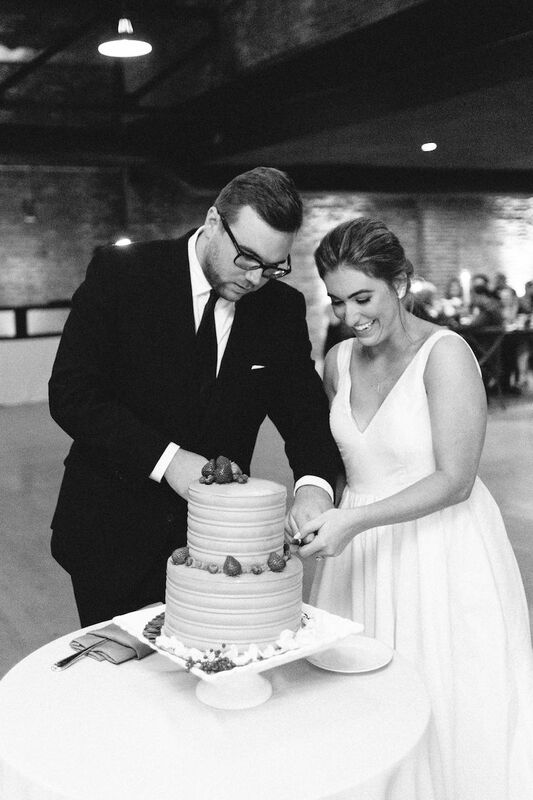 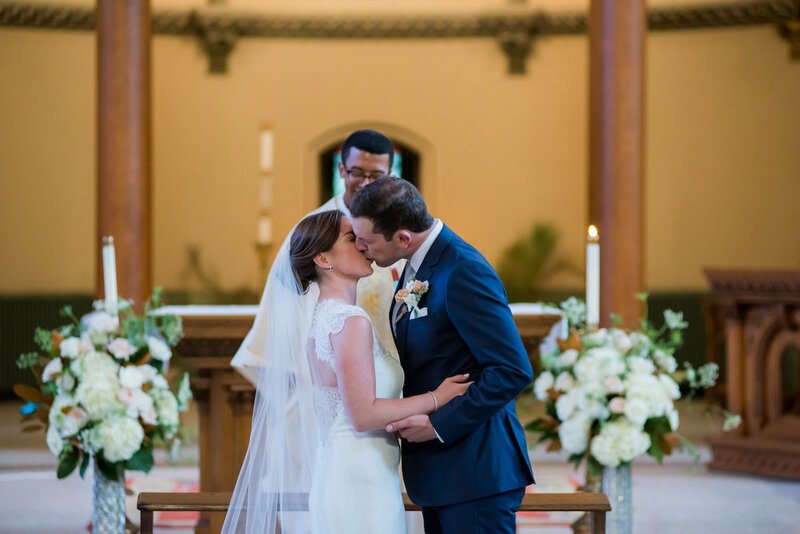 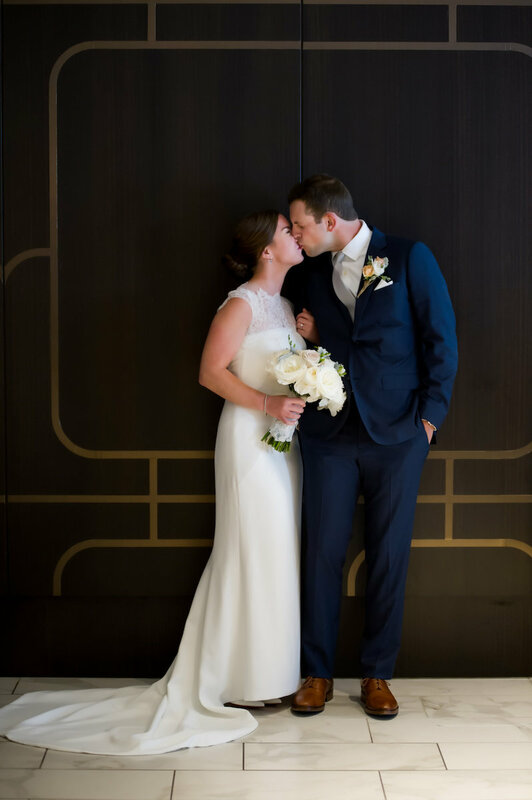 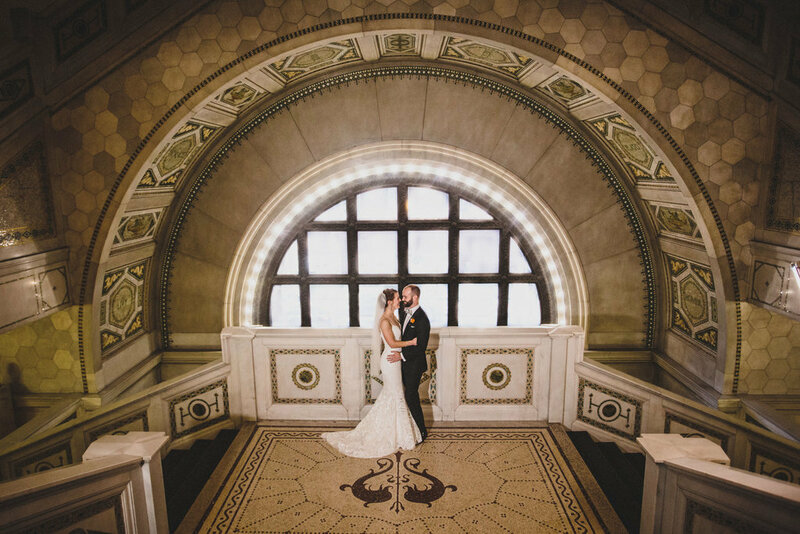 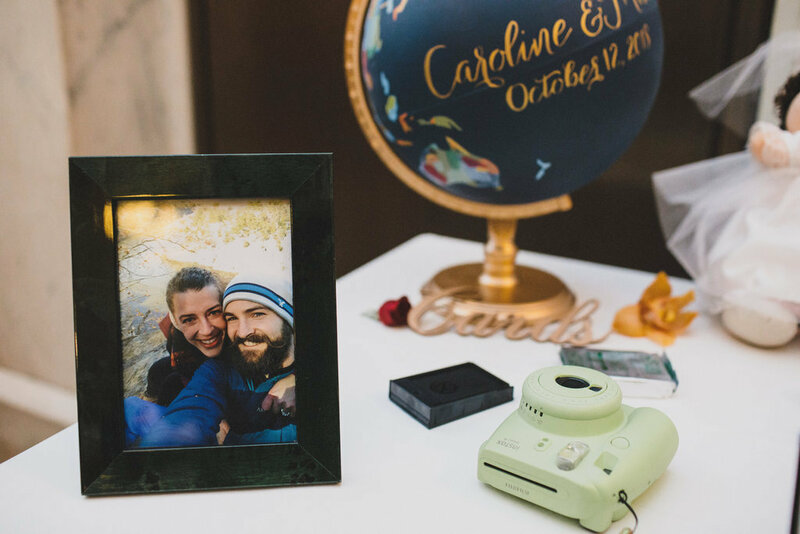 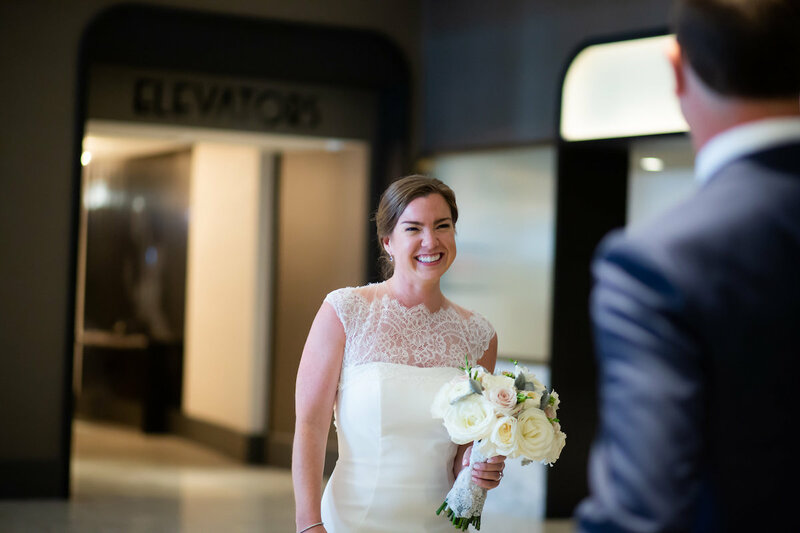 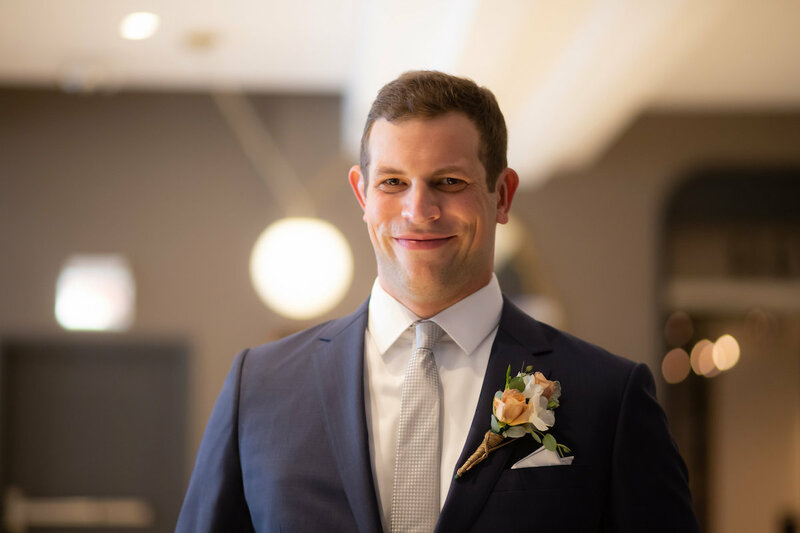 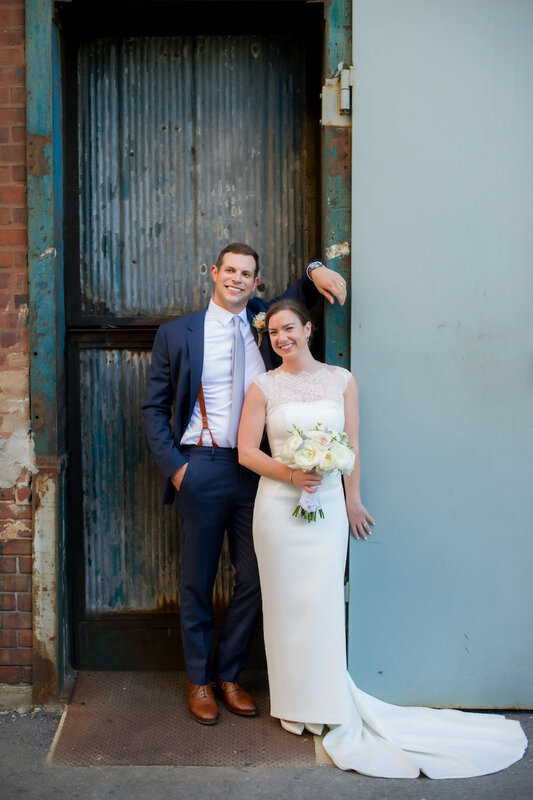 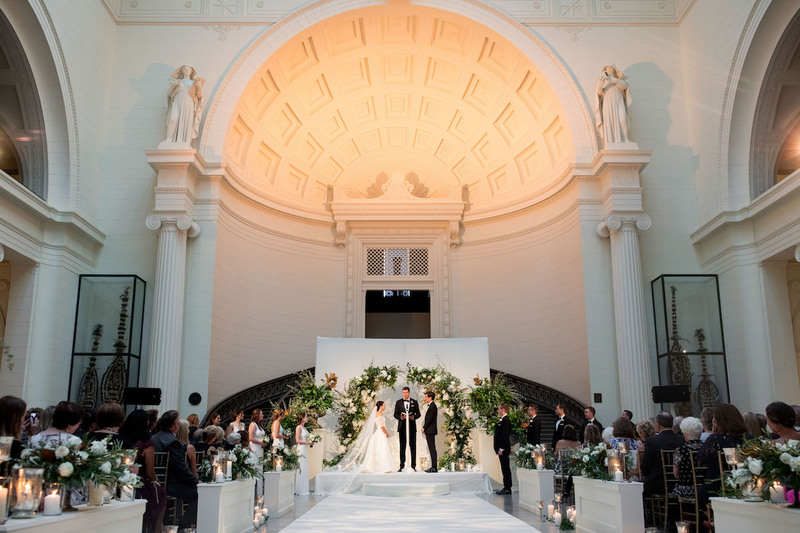 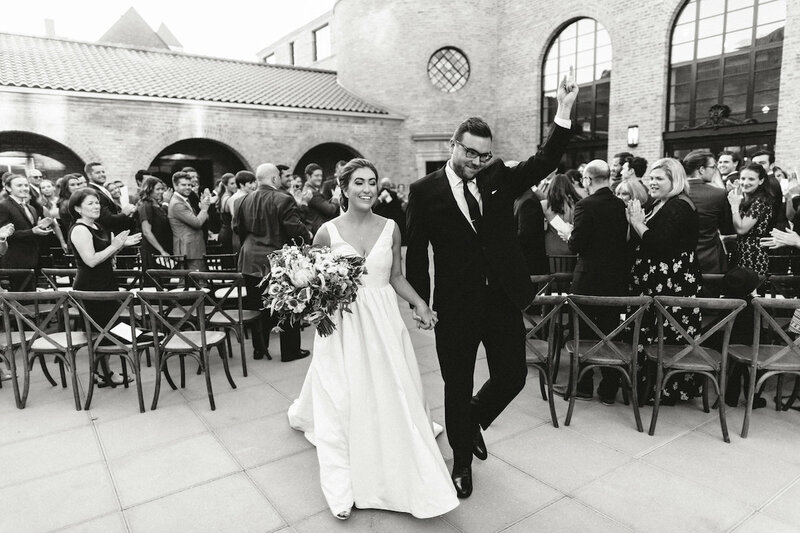 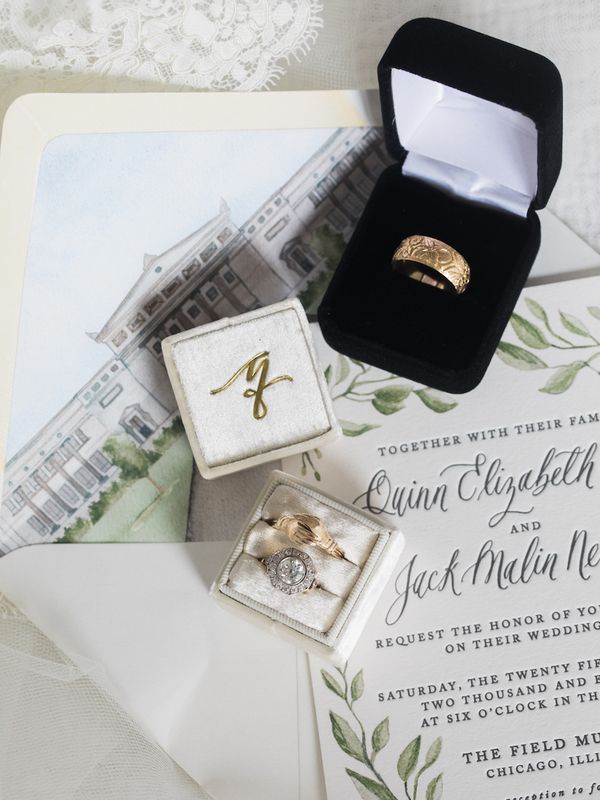 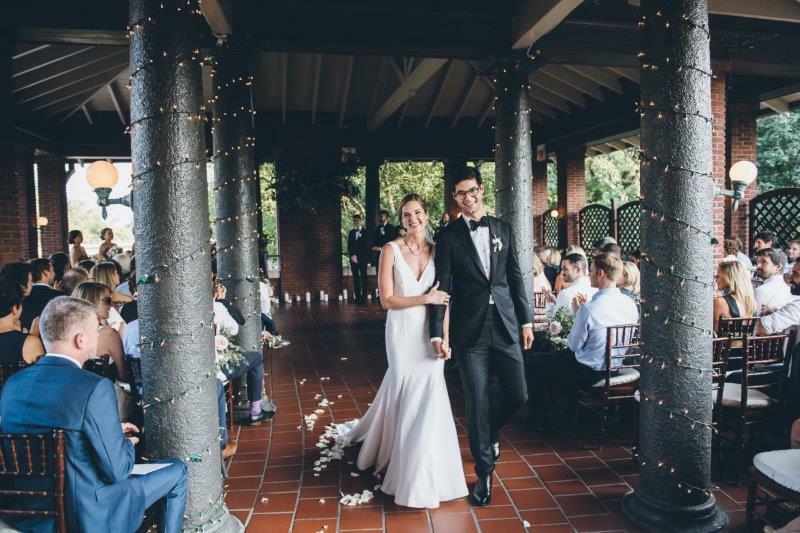 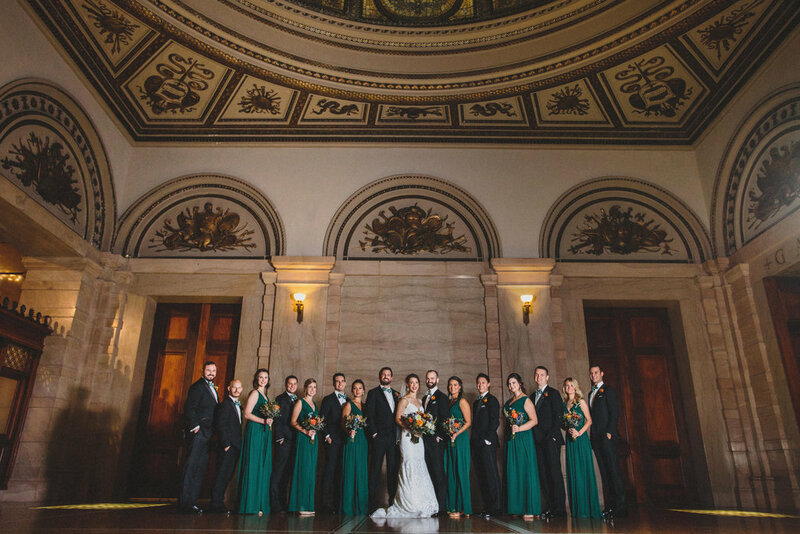 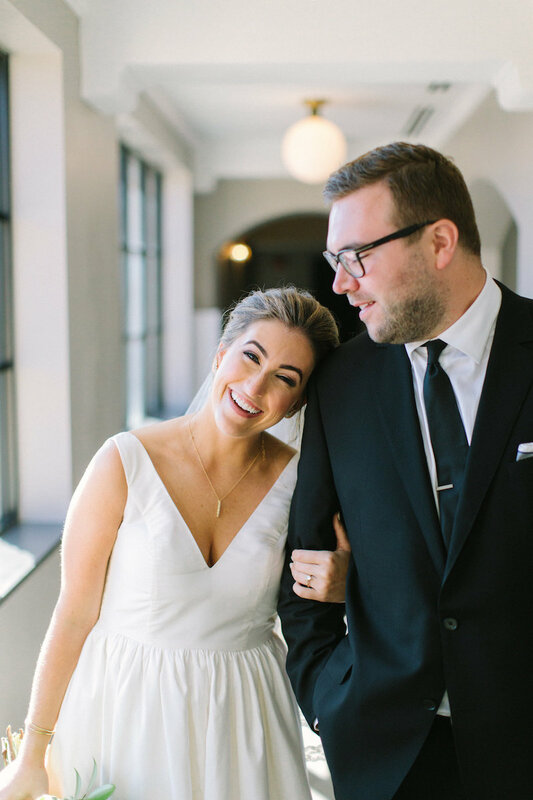 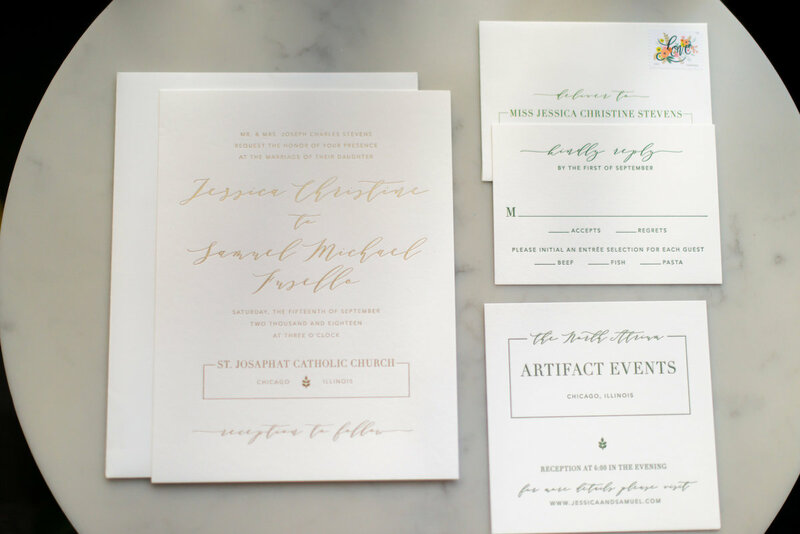 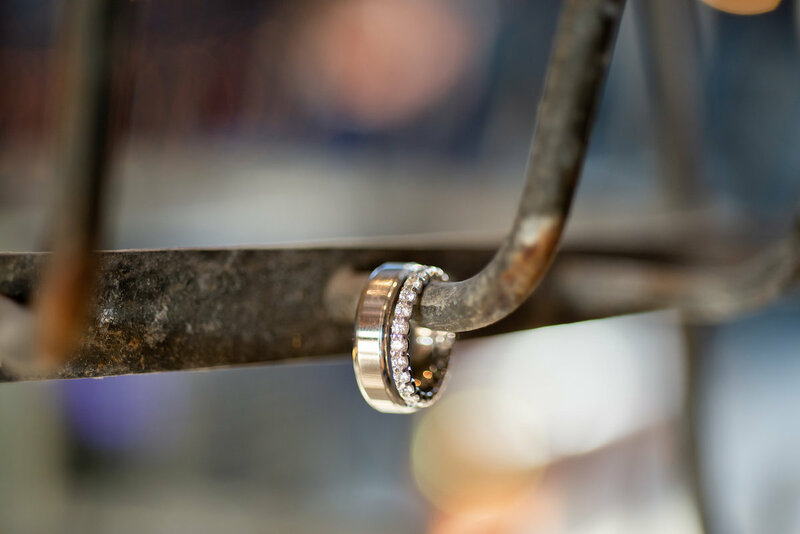 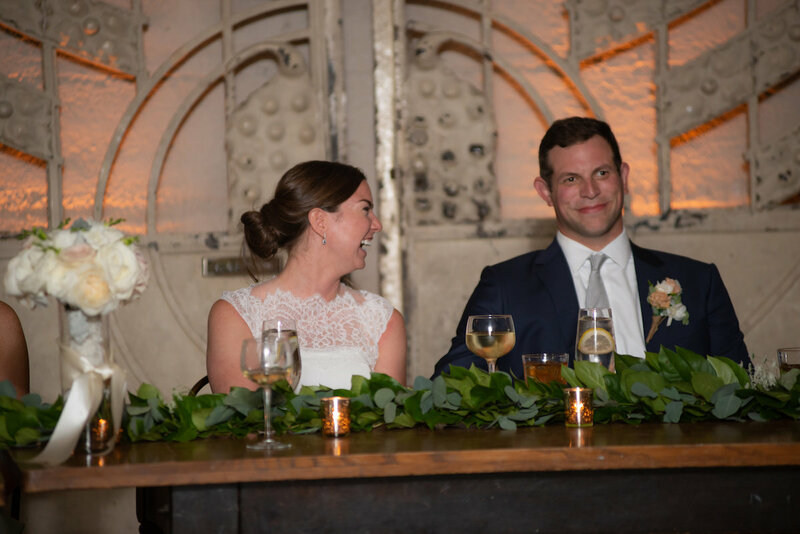 It was a true collaborative effort; Joan started the planning process helping these two find the perfect venue and firm up their wedding day vision. 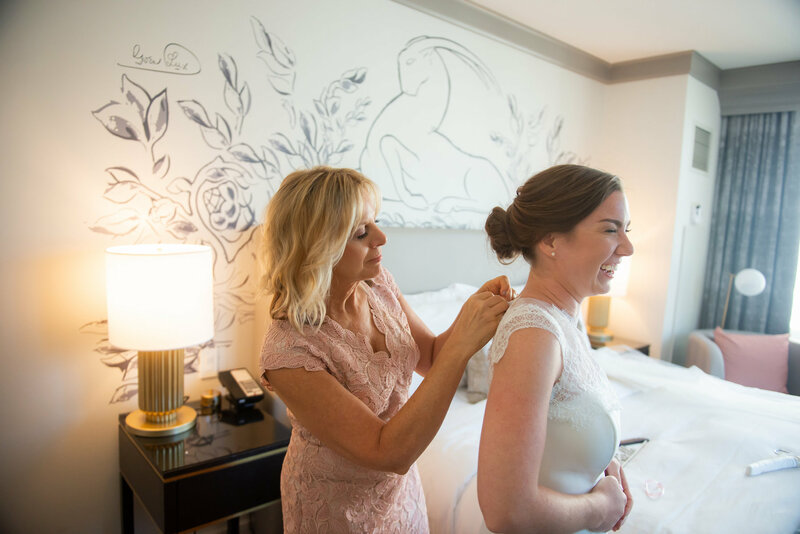 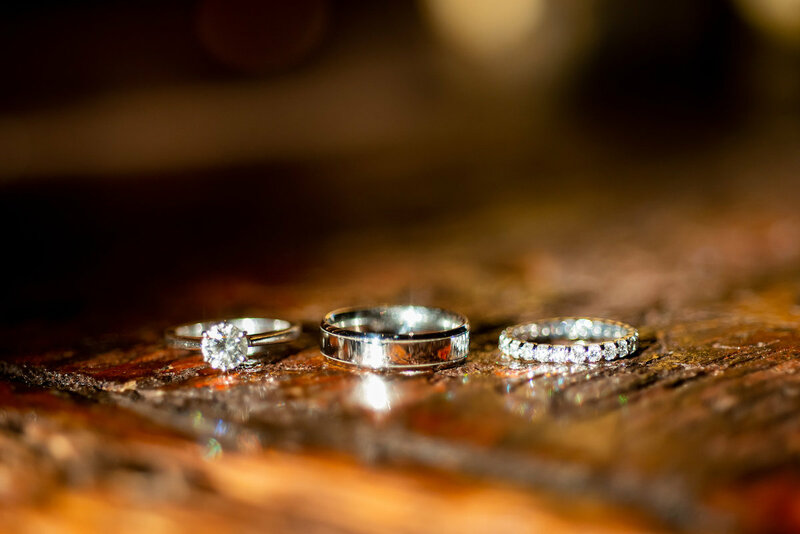 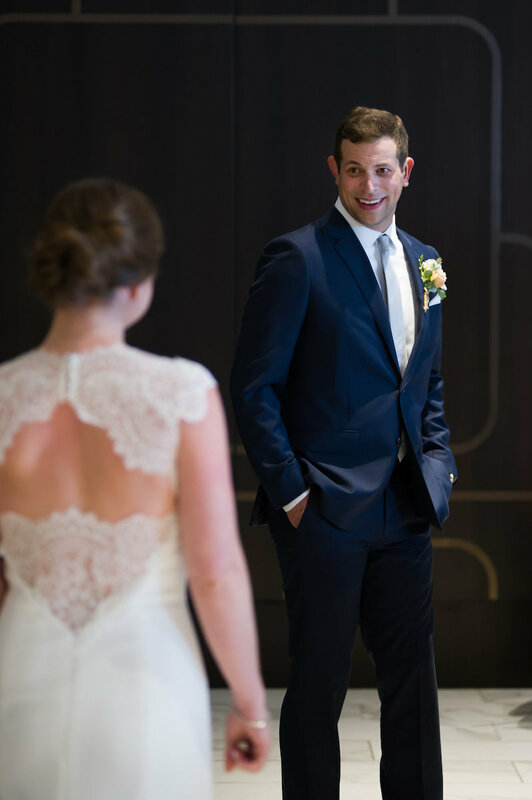 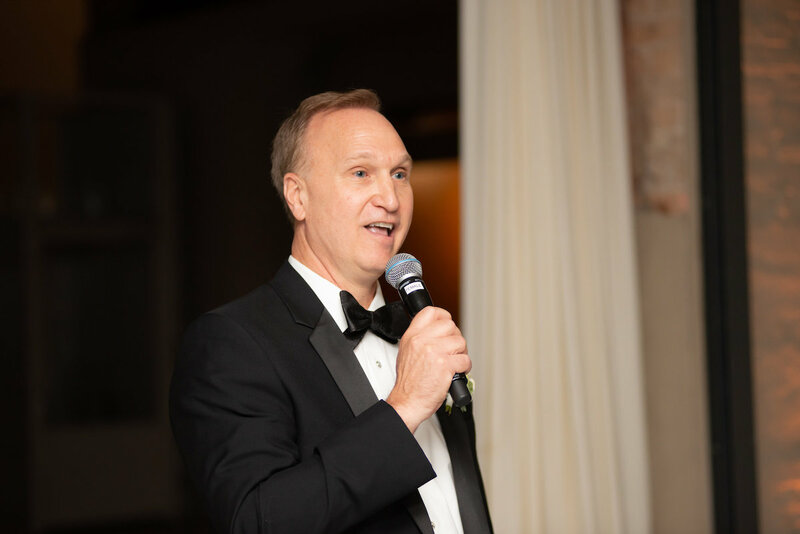 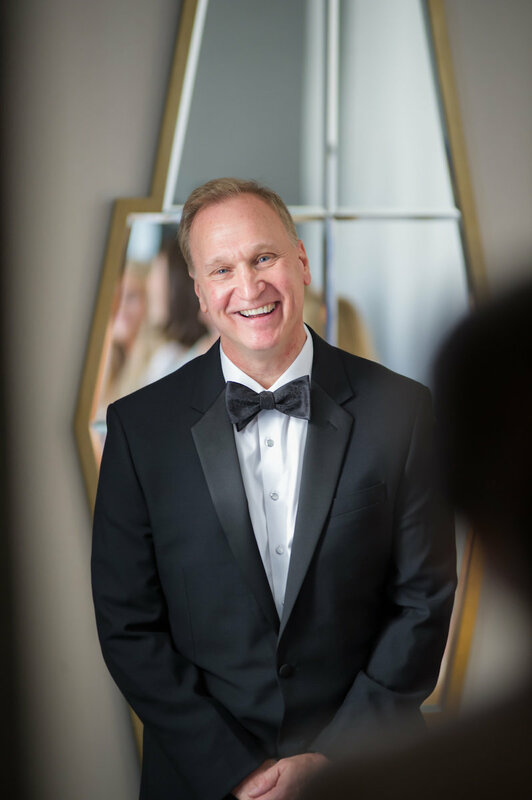 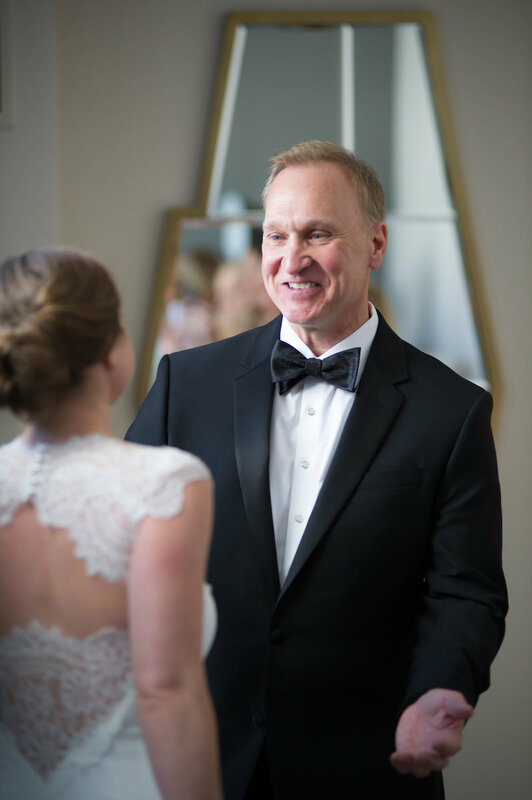 After hearing Joan gush about how wonderful this couple was, I was excited to be able to step in as a part of the team to carry their wedding through the coordination process to wedding day. 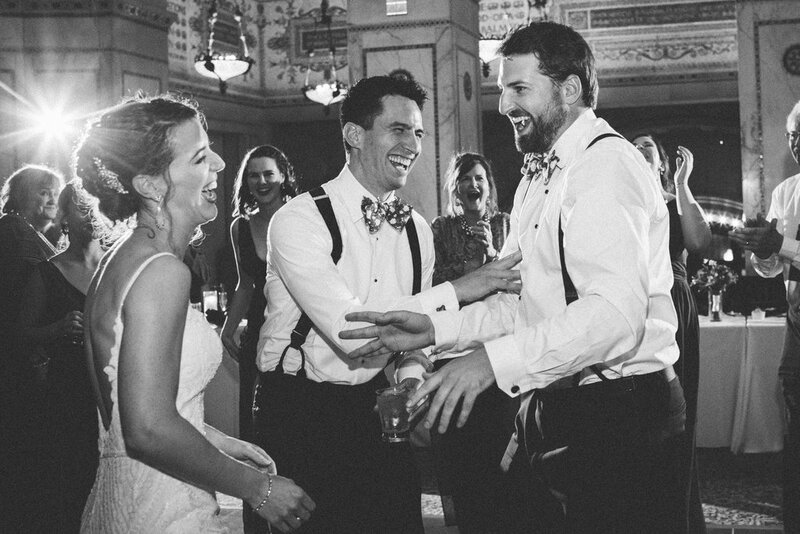 From the first time I met Allison and Stephen to get to know each other a little better, I felt like I was having a drink with old friends. 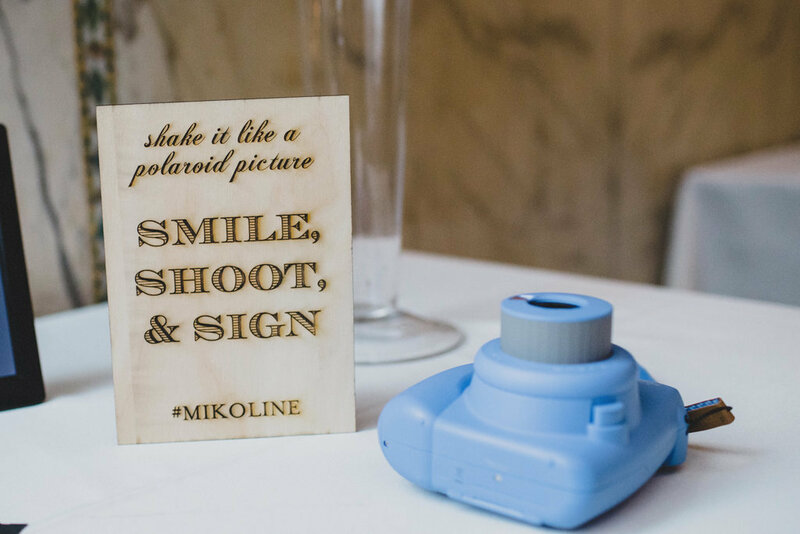 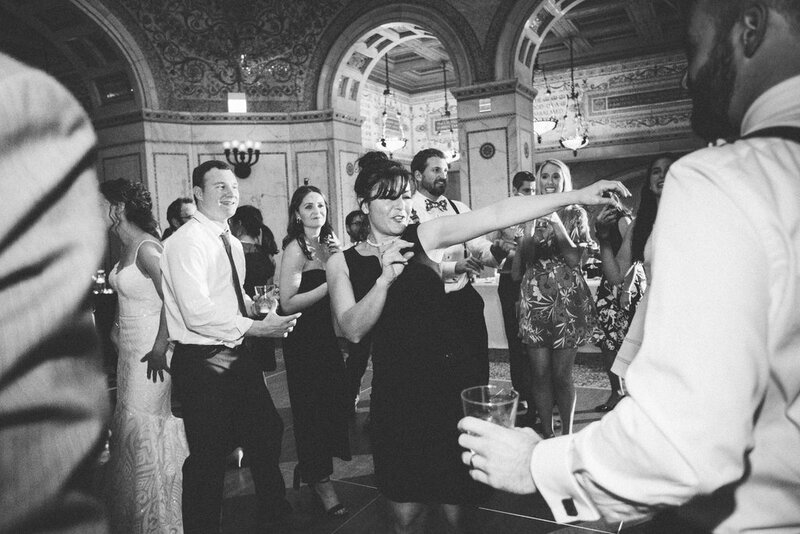 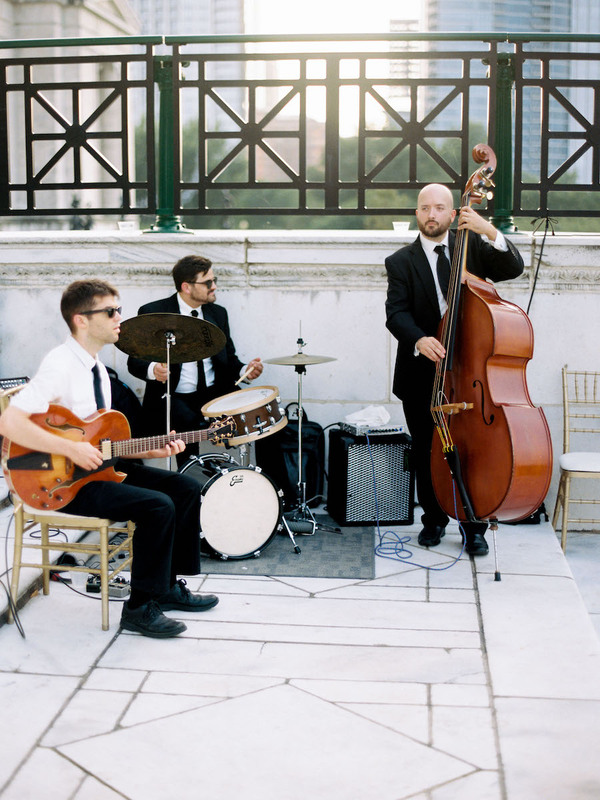 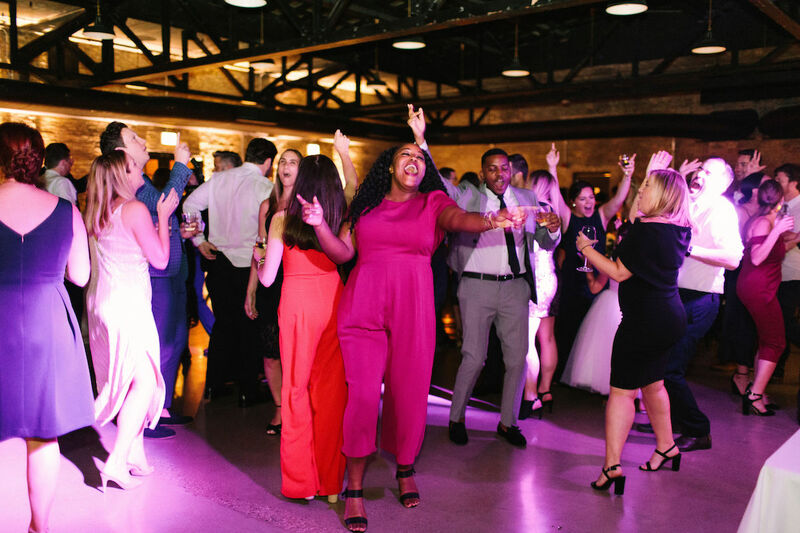 Plus, their wedding style and party vibe were laid back and fun — so I knew this wedding was going to be a blast! 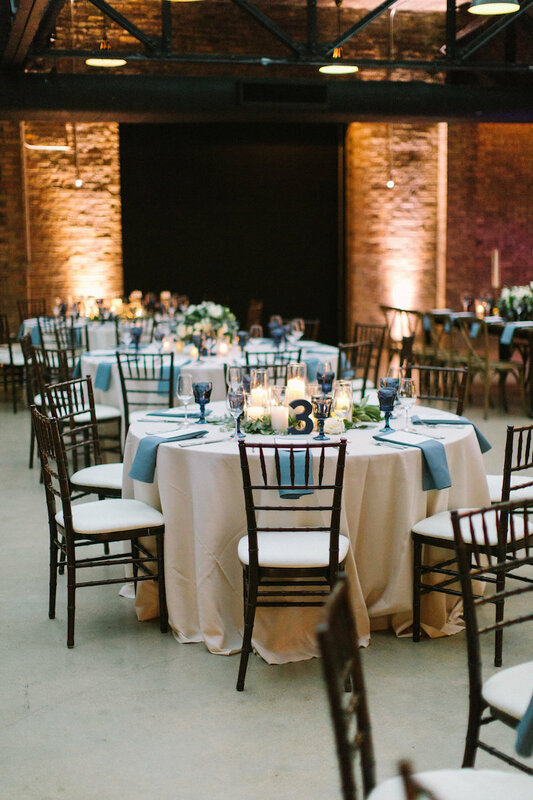 Revel Motor Row was a dream venue. 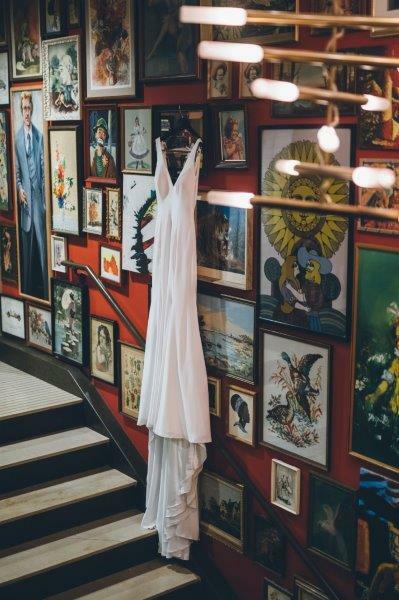 Not only are clients thrilled to be in a space with such stunning architectural detail (and let’s not forget to talk about the bathrooms–hello, gorgeous! 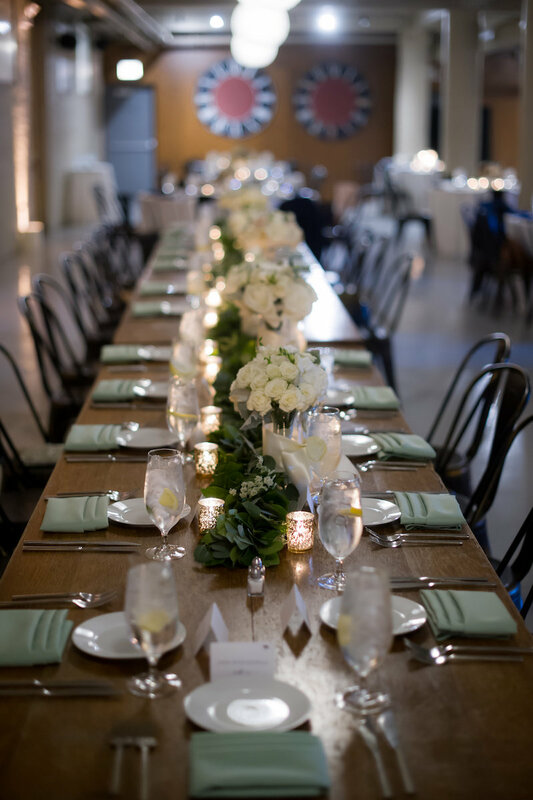 ), getting to work with some of the best in the business through Limelight Catering and Revel Decor are absolutely added perks. 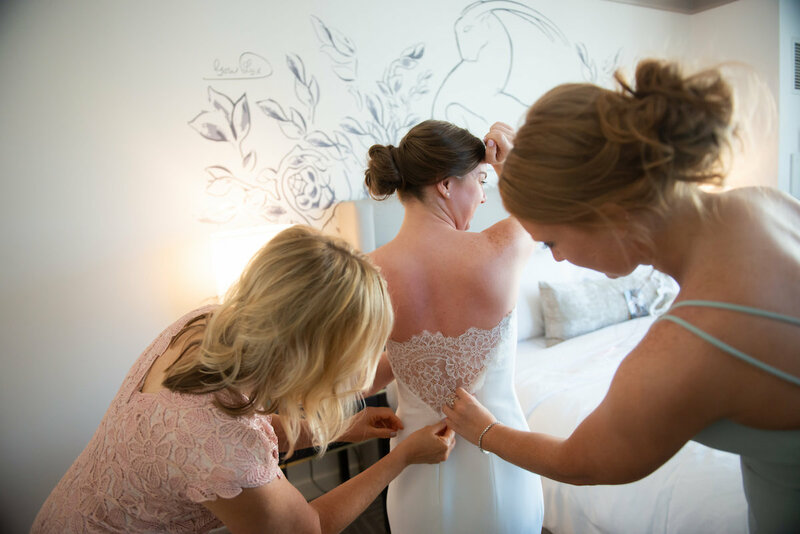 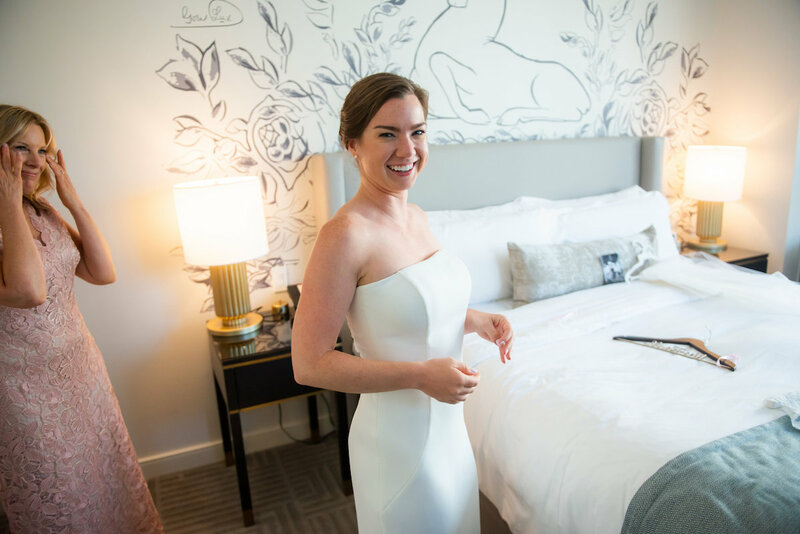 One of my favorite amenities is the two-floor bridal suite available to clients if they choose to get ready on site. 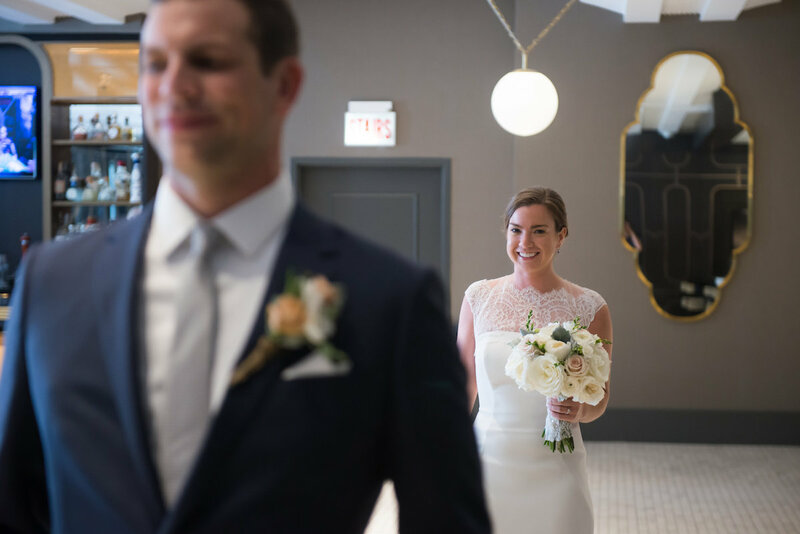 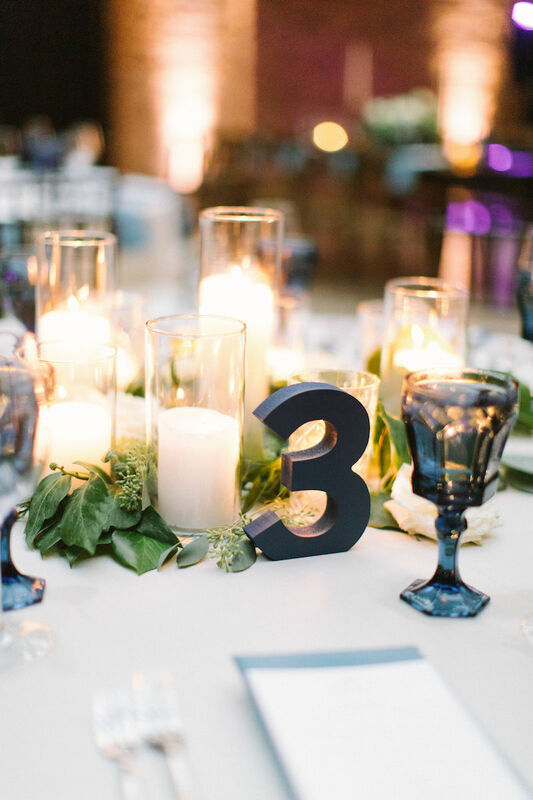 With everything from a fridge fully-stocked with beverages of all varieties to luxe robes, tall mirrors, and lounge seating galore, it’s a dream space for a relaxing wedding morning. 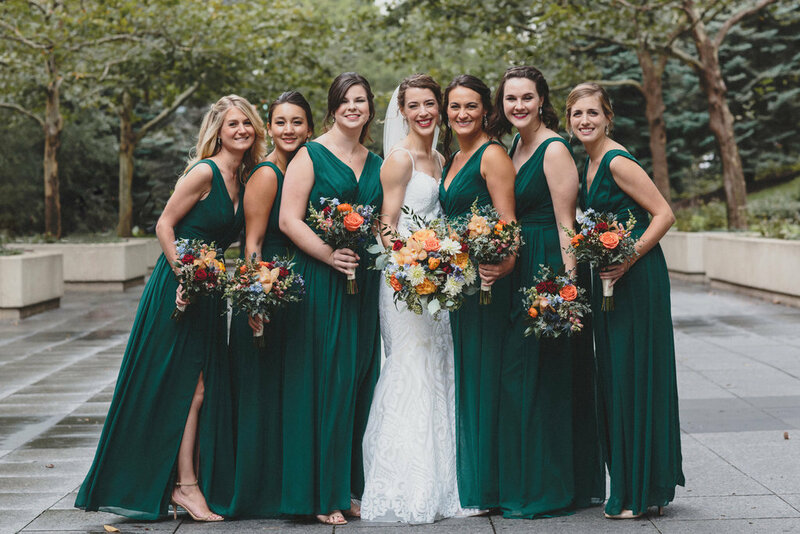 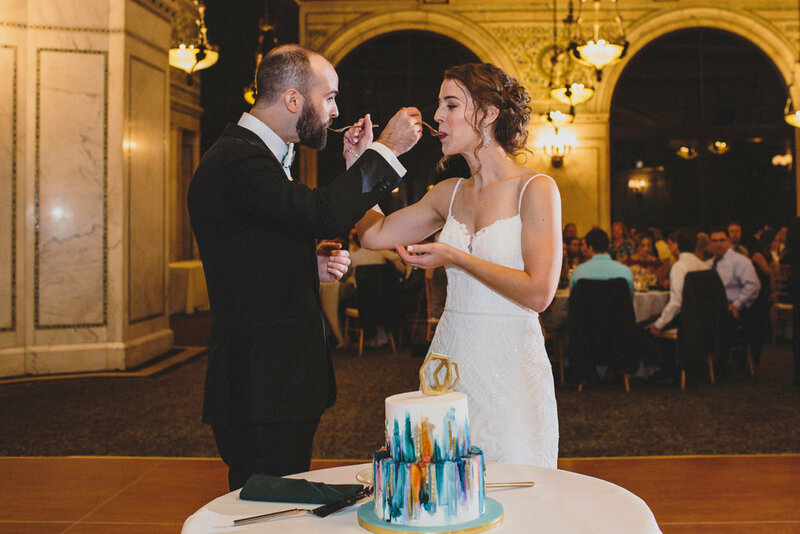 Allison and her wedding party enjoyed a spread from Goddess & Grocer while Kate Johnson Artistry took care of beautifying the ladies’ hair and makeup. 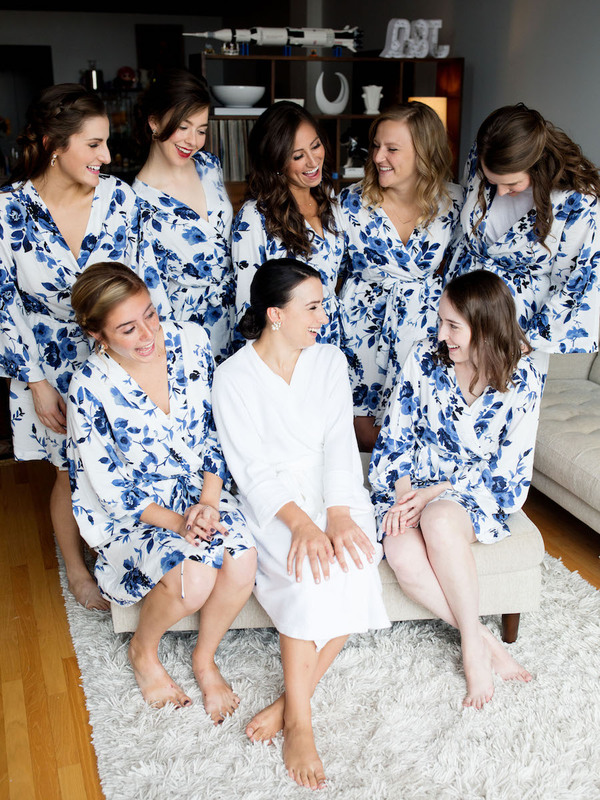 How cute are the monogrammed pajama sets that Allison gifted her best gals? 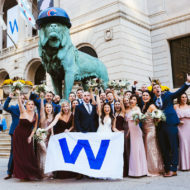 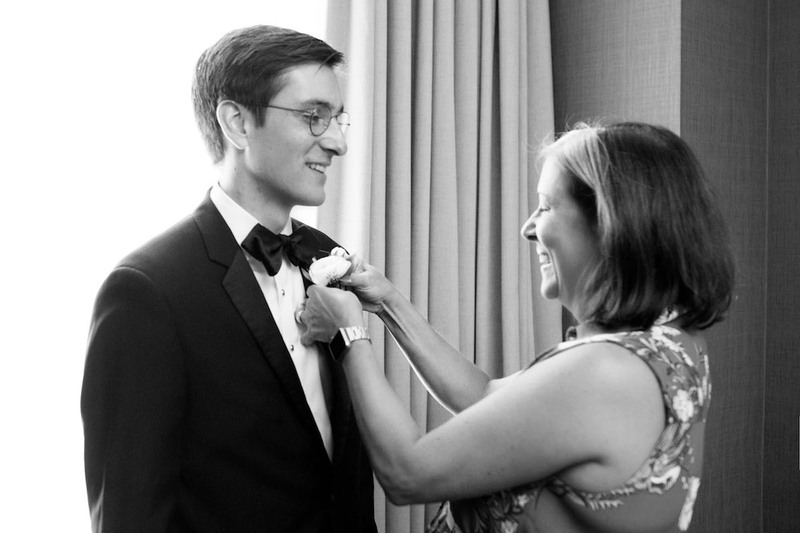 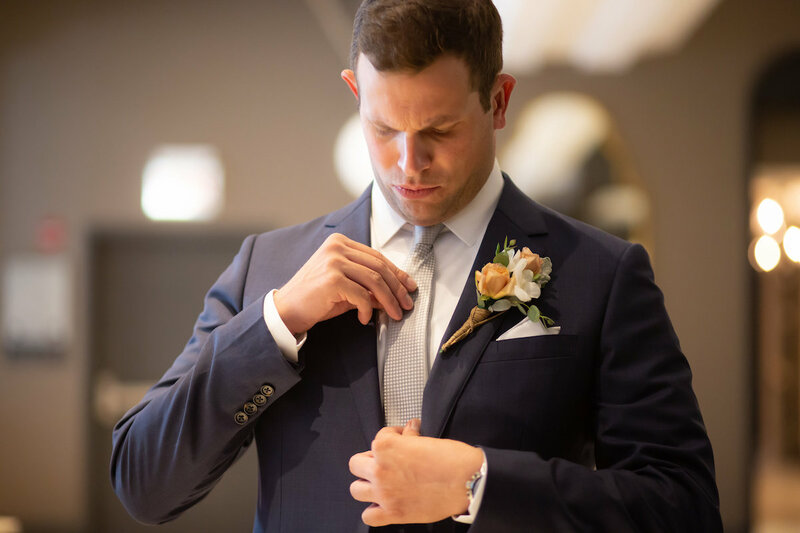 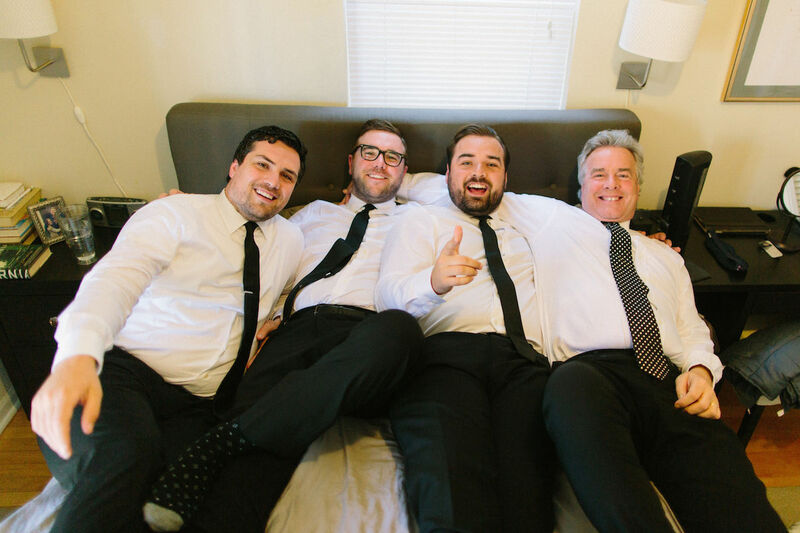 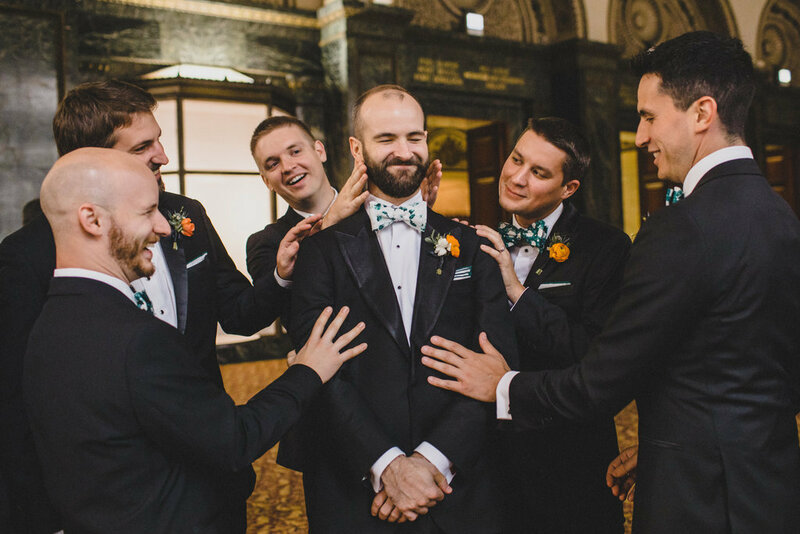 Meanwhile, across town at the couple’s apartment in Logan Square, Stephen and his family were also getting ready for the big day. 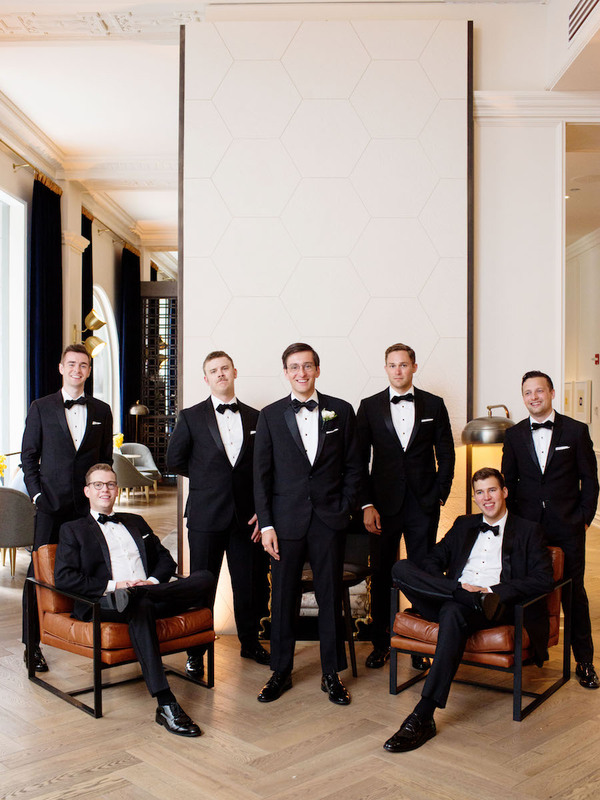 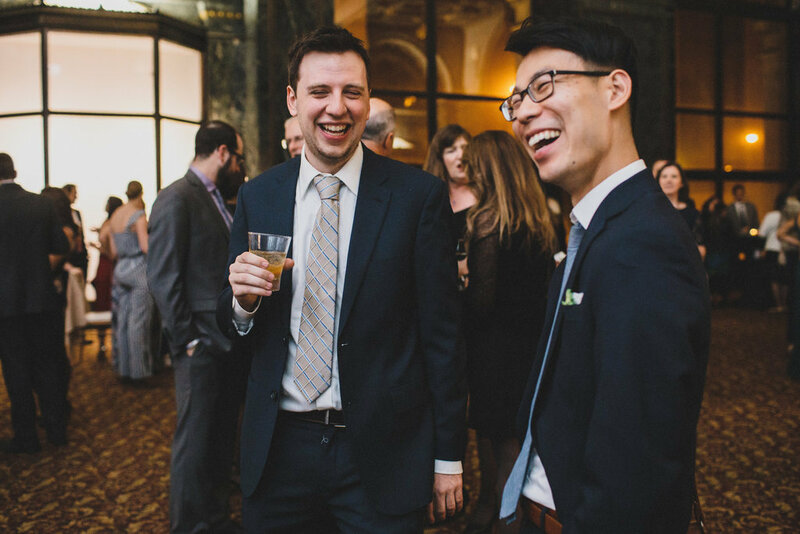 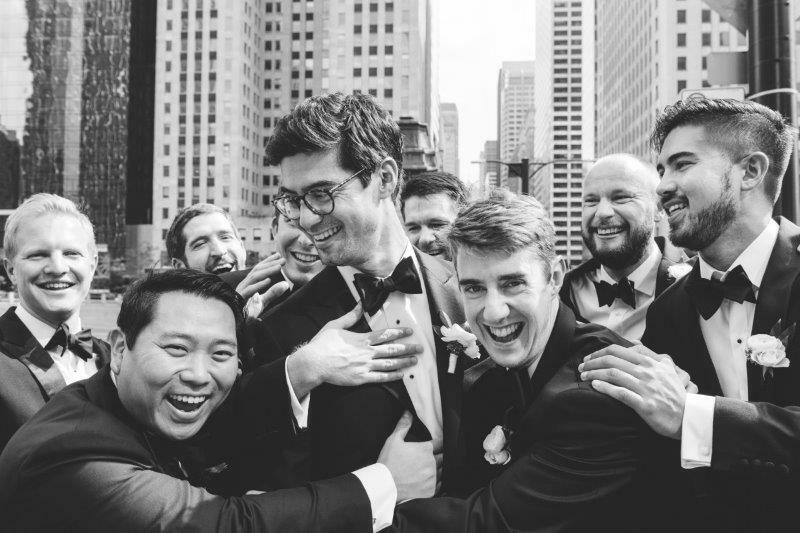 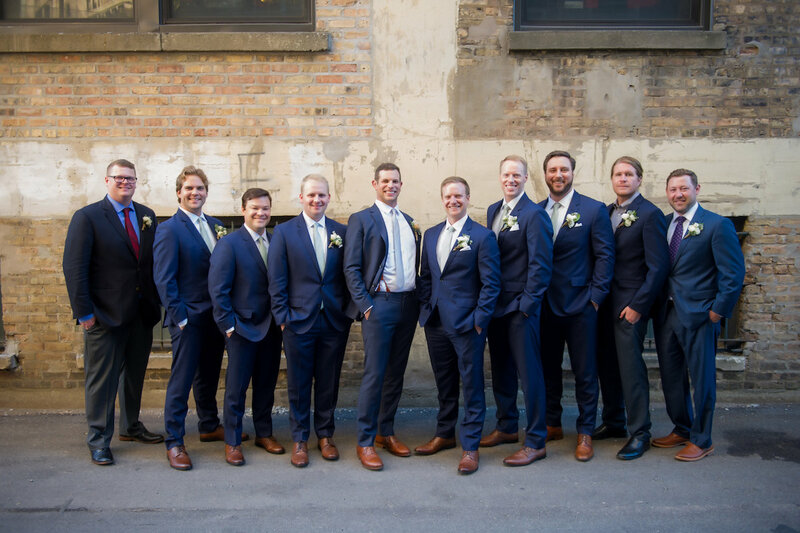 We can only imagine the raucous laughter that was spilling from room to room with this boisterous bunch, and are so glad their photographer, Tim, made an early stop at their apartment to capture it! 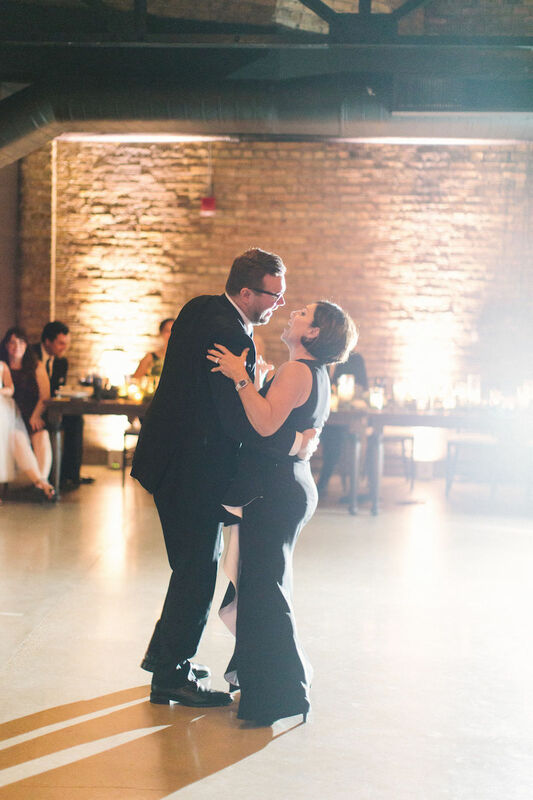 Bethany and Tim from TimTab Studios were both on hand to document the festivities, and were such a pleasure to work with. 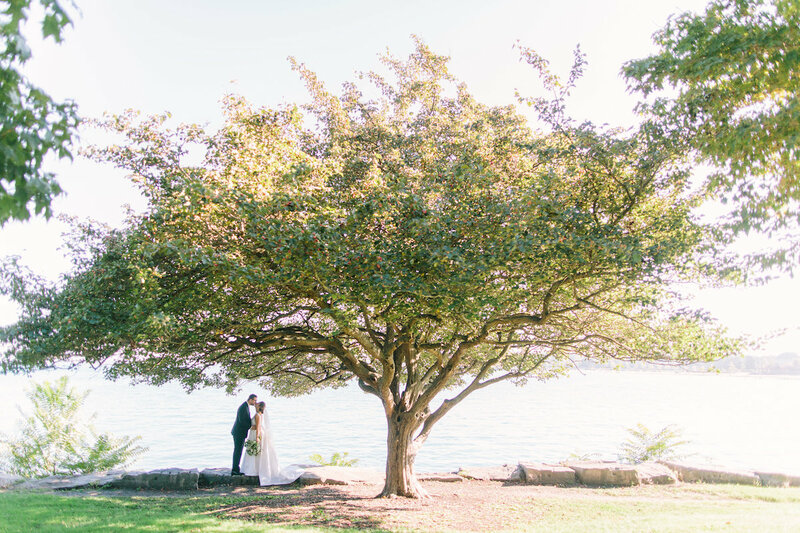 We love the spot they chose to capture Allison and Stephen’s first look, and this gorgeous tree that was the perfect complement to all the industrial shots taken around the venue. 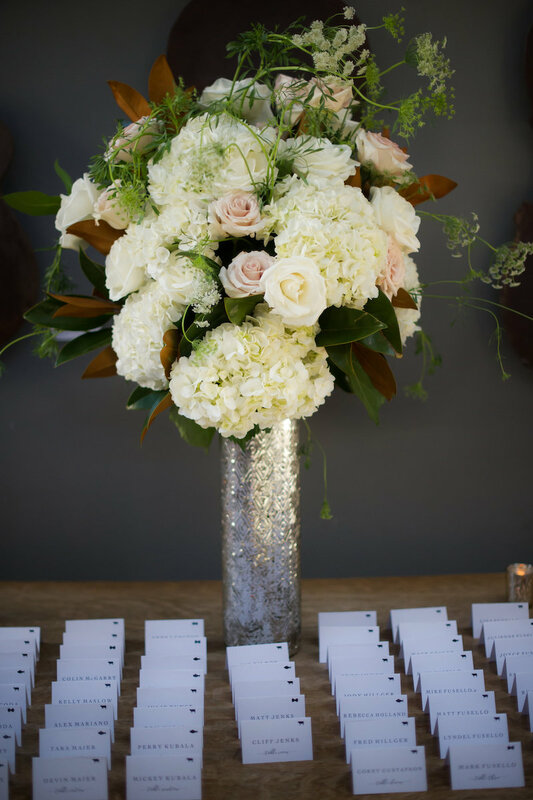 Revel designed Allison’s bouquet to be a true stunner. 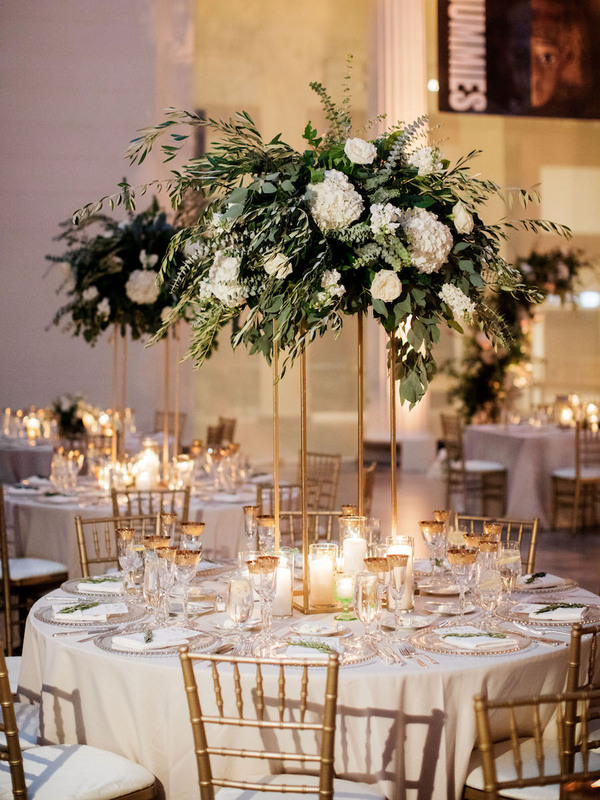 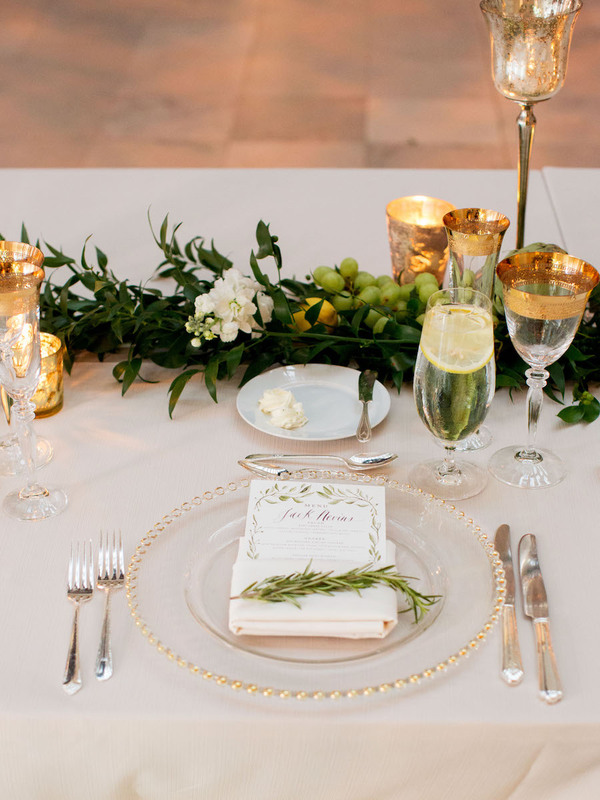 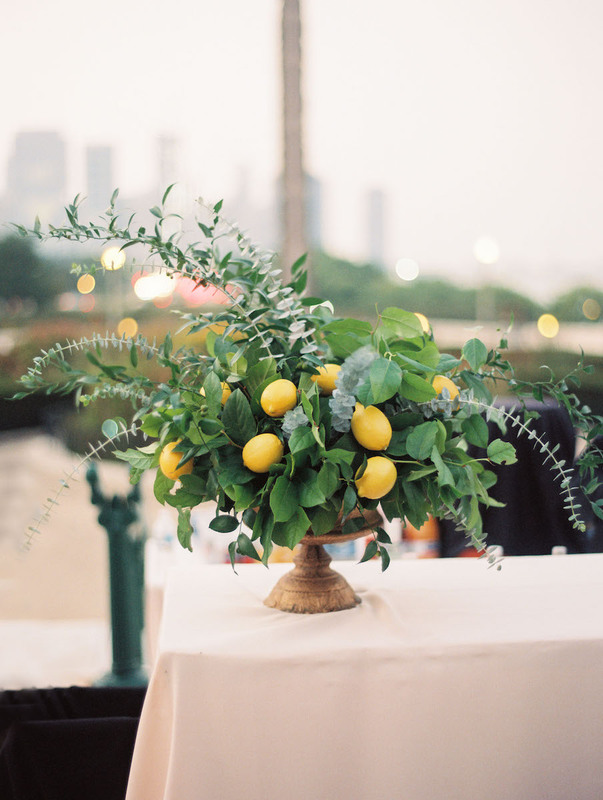 It featured a large ivory-sprayed protea amidst thistle, privet berries, anemones, and lush greenery, and brought such a splash of drama! 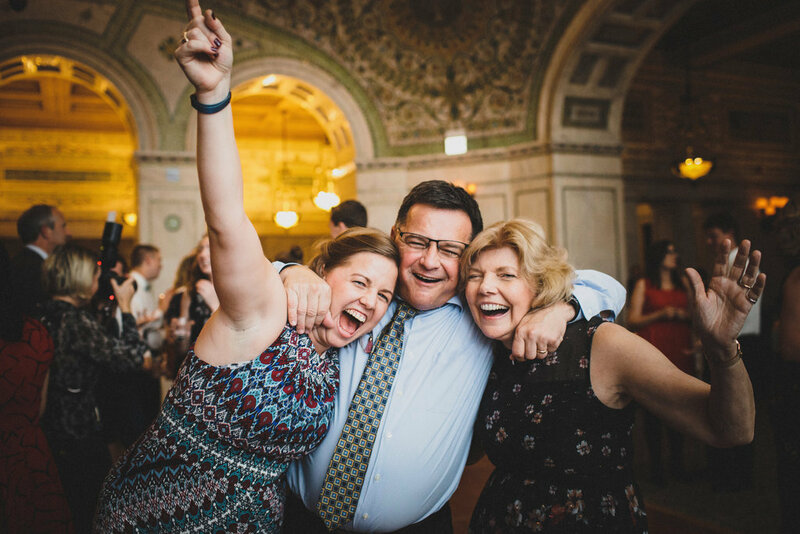 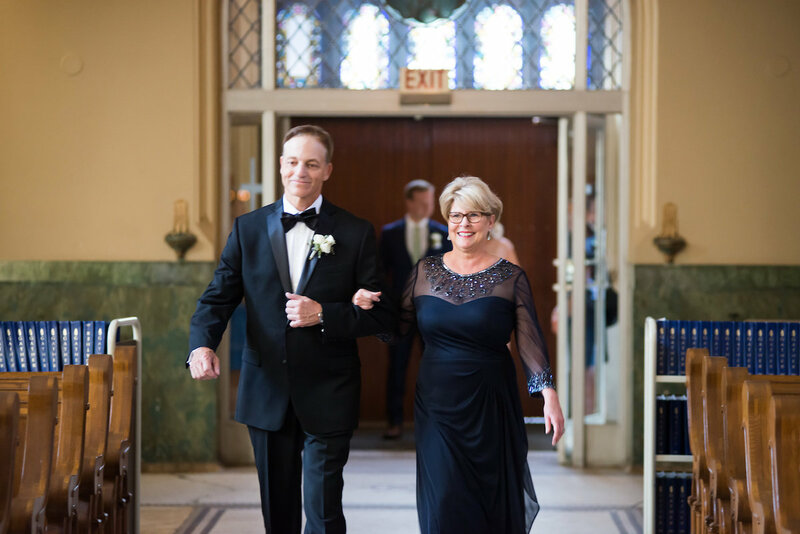 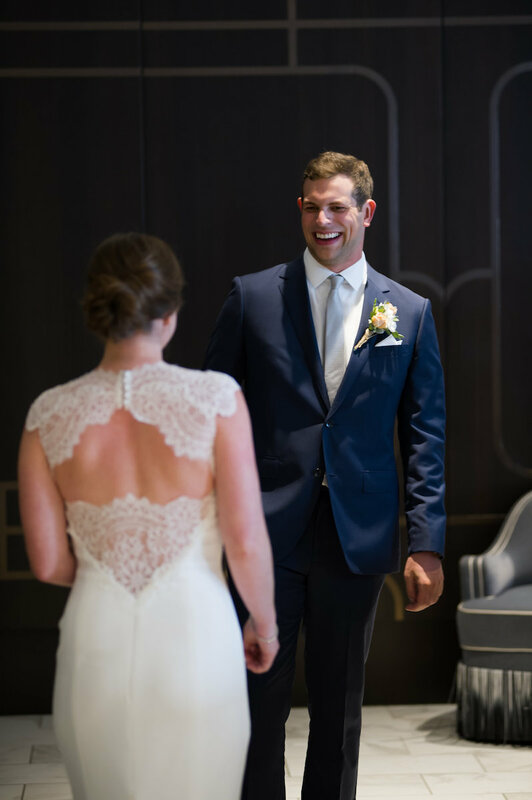 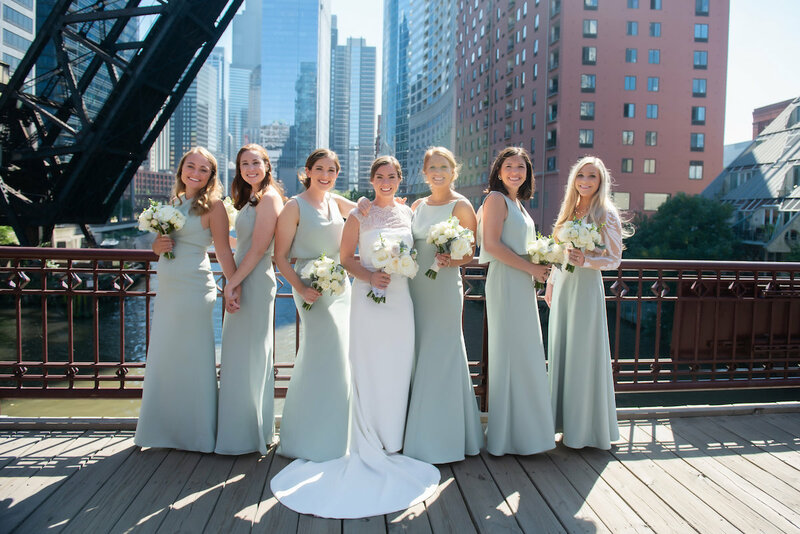 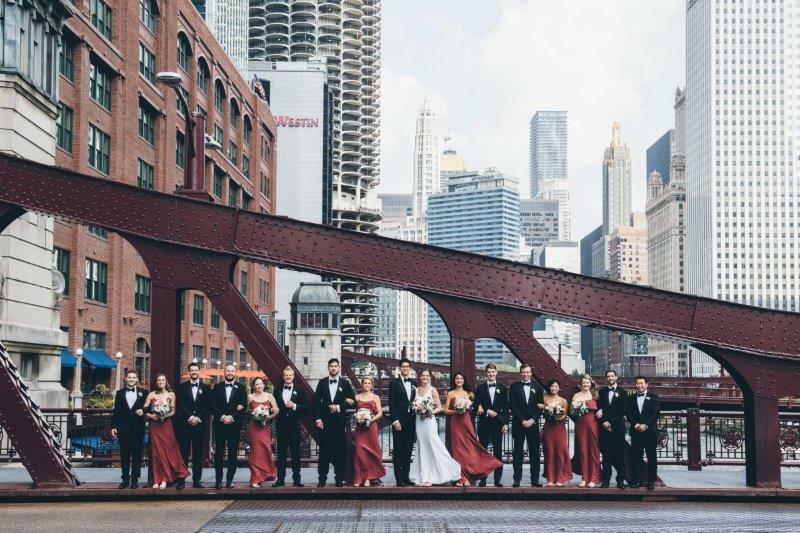 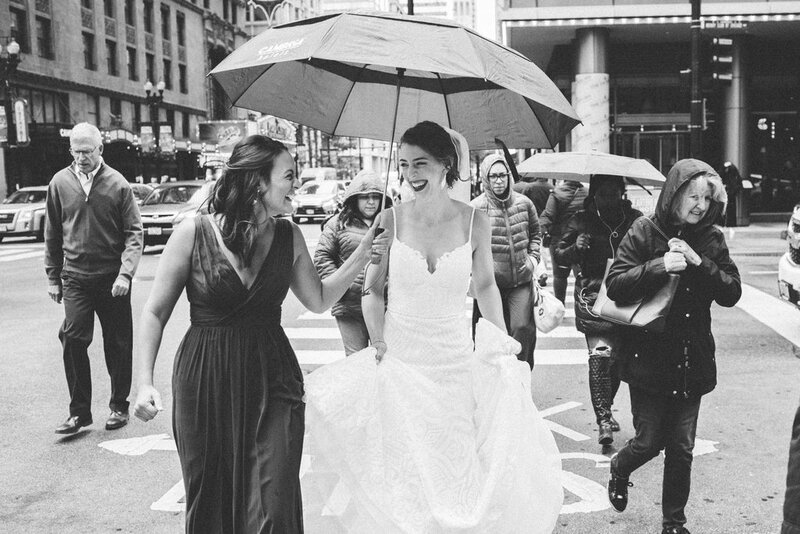 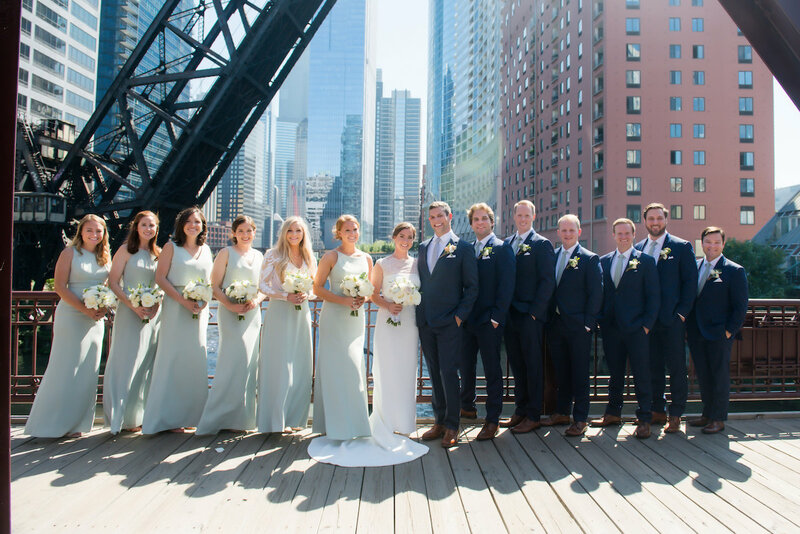 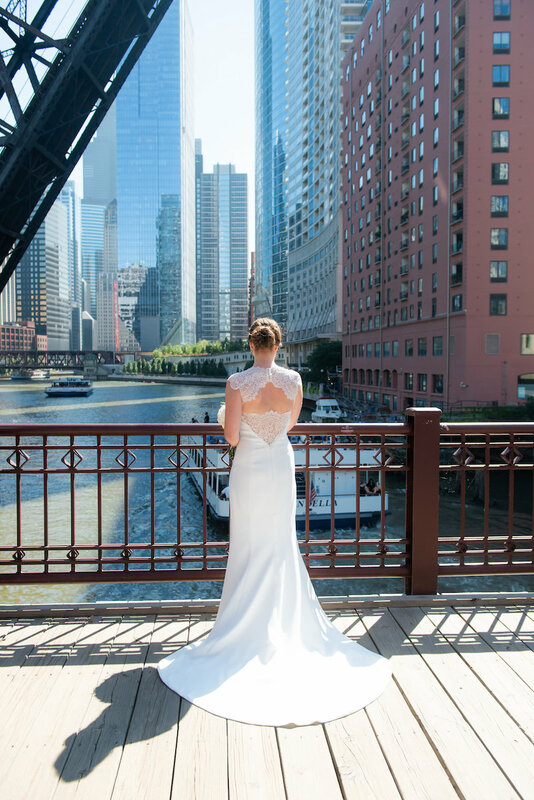 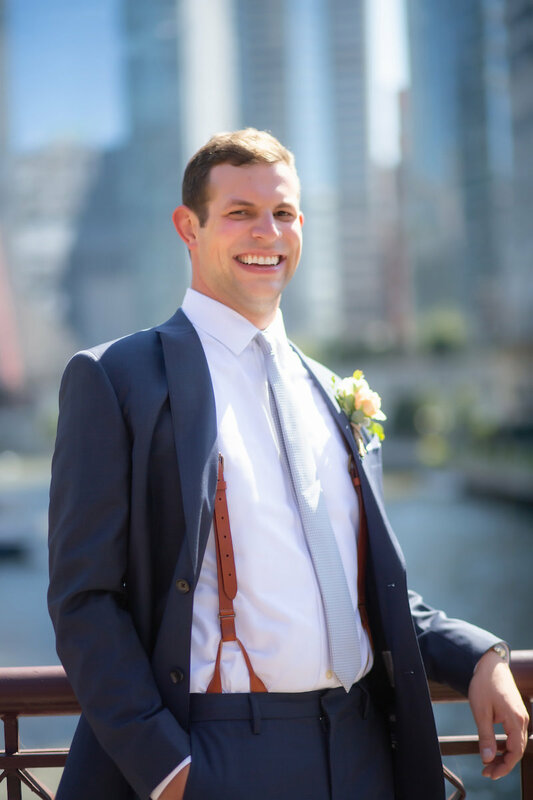 While Allison and Stephen and their families took photos around the venue, guests began to board buses courtesy of Windy City Limo to make their way to Revel Motor Row. 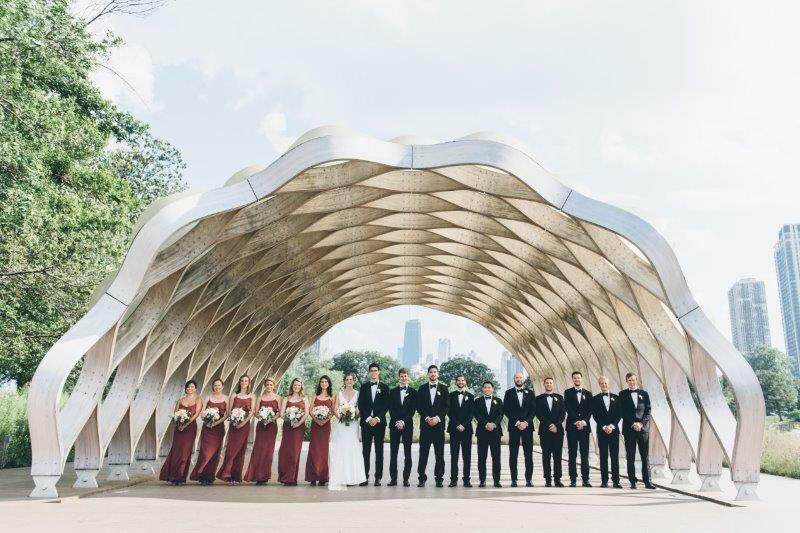 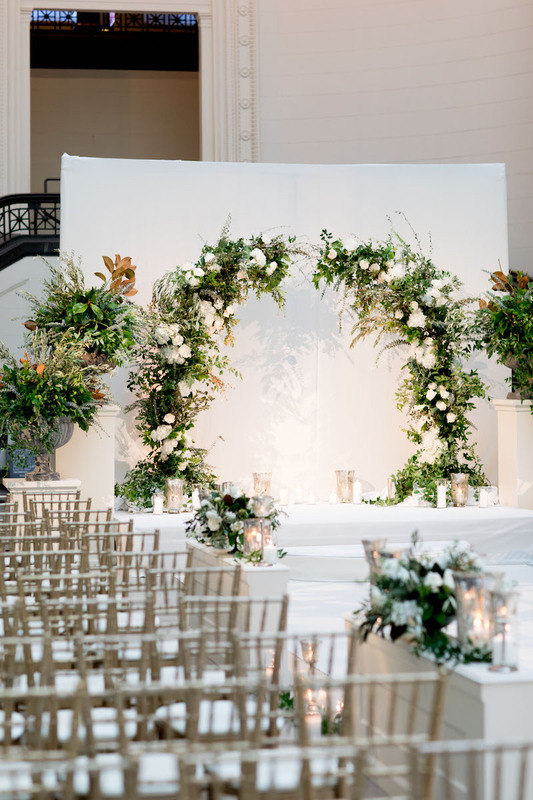 Revel created a free-standing ceremony arch that could easily transition from an outdoor ceremony to an indoor one if weather complicated things. 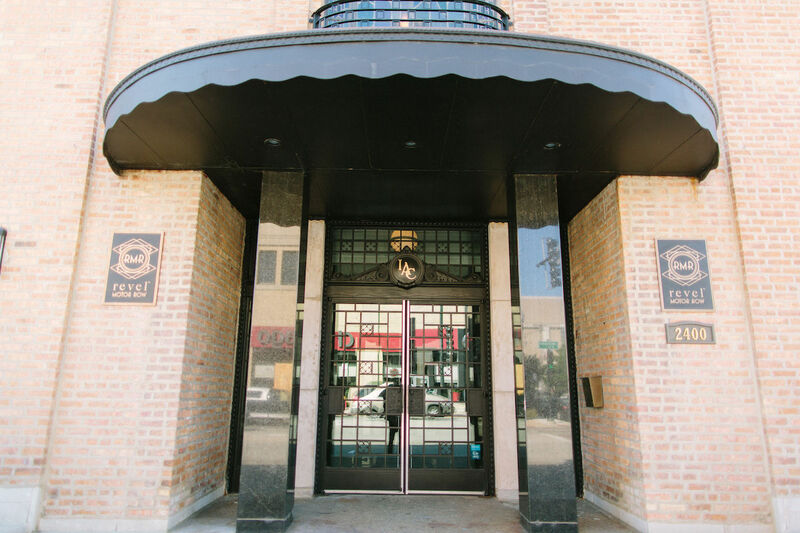 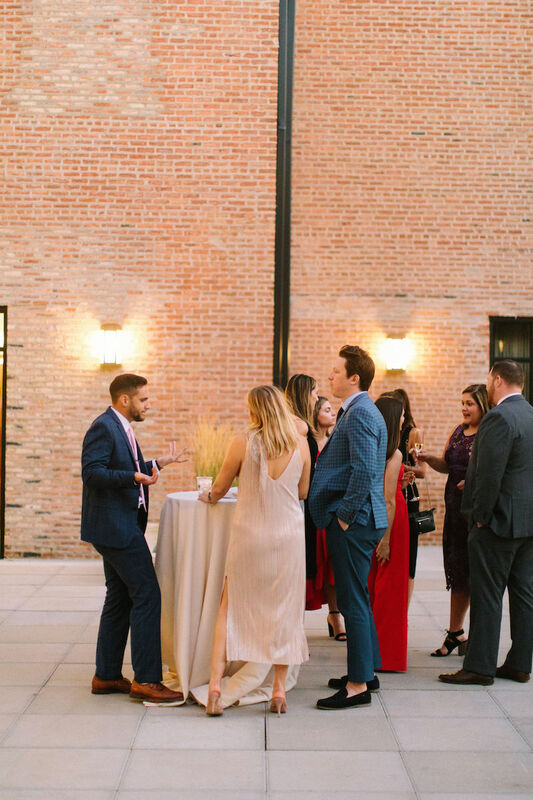 Luckily, we were blessed with a gorgeous Chicago day, and the arch brought the perfect amount of style to RMR’s courtyard space. 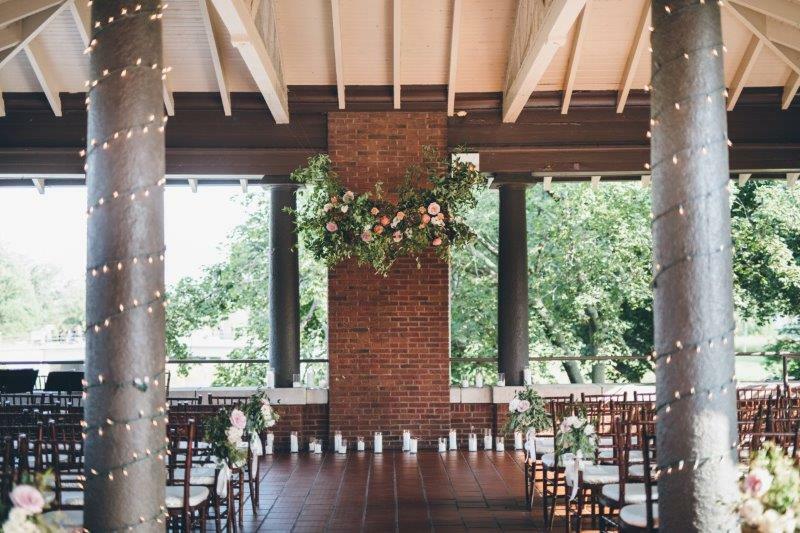 We used a mix of fruitwood chiavari and french country chairs to go with the linen-topped rounds and farm-style tables for the reception, and thought the level of interest they brought to the ceremony set-up was truly unique. 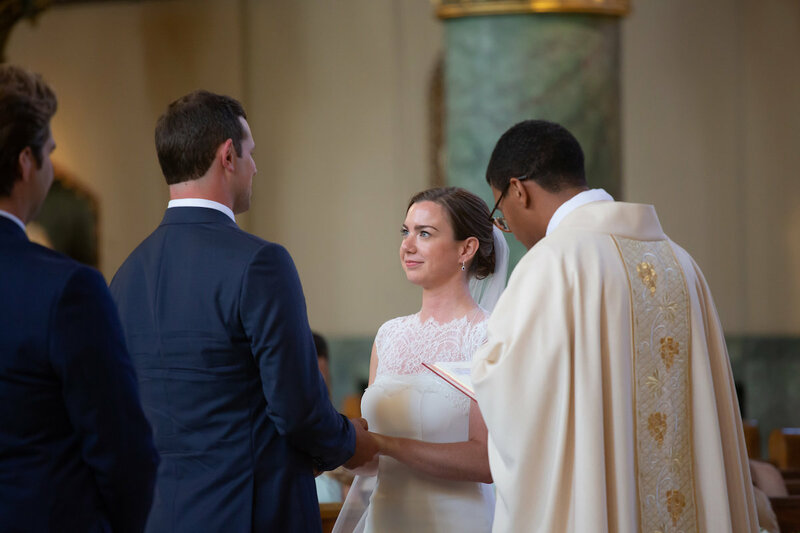 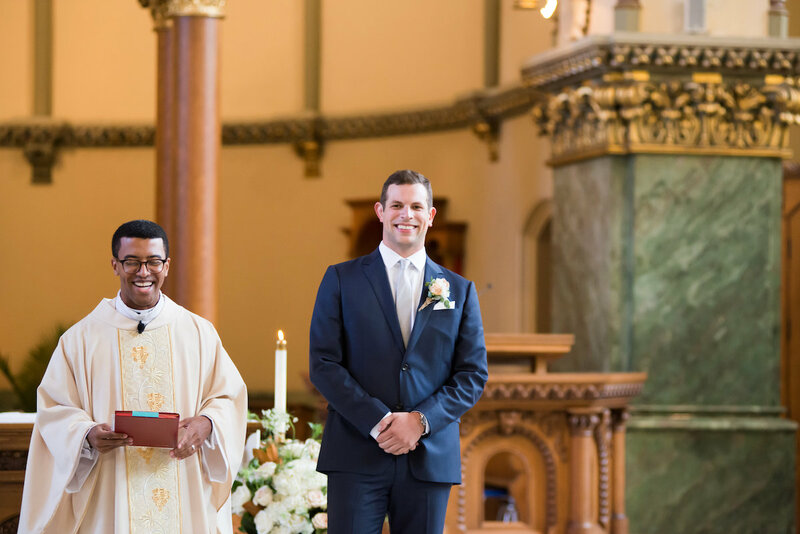 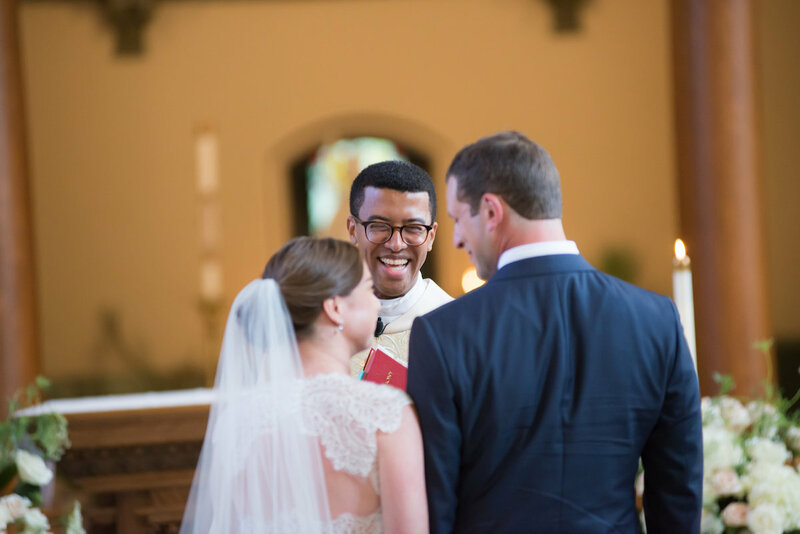 Allison and Stephen entrusted a good friend to officiate their ceremony, who did the job with a gracious mix of brevity and sincerity. 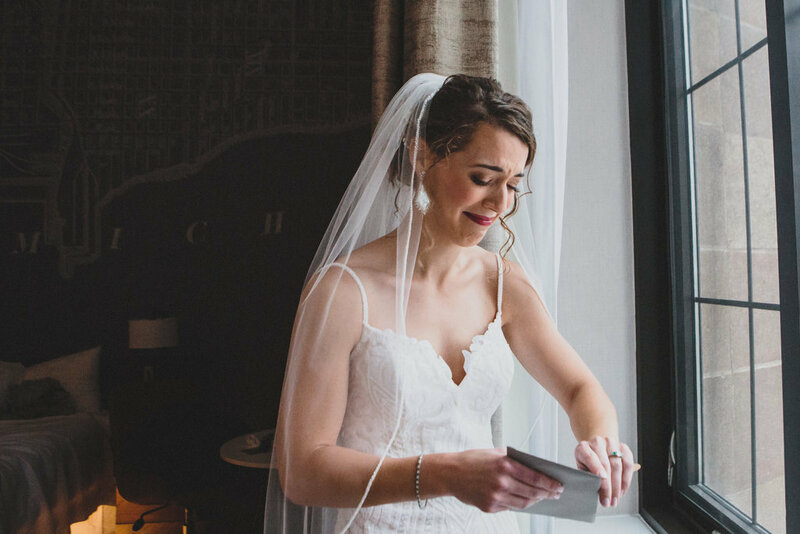 They hired Leah Trib Productions to capture the ceremony on video as they knew this would be a moment they’d want to relive many times over. 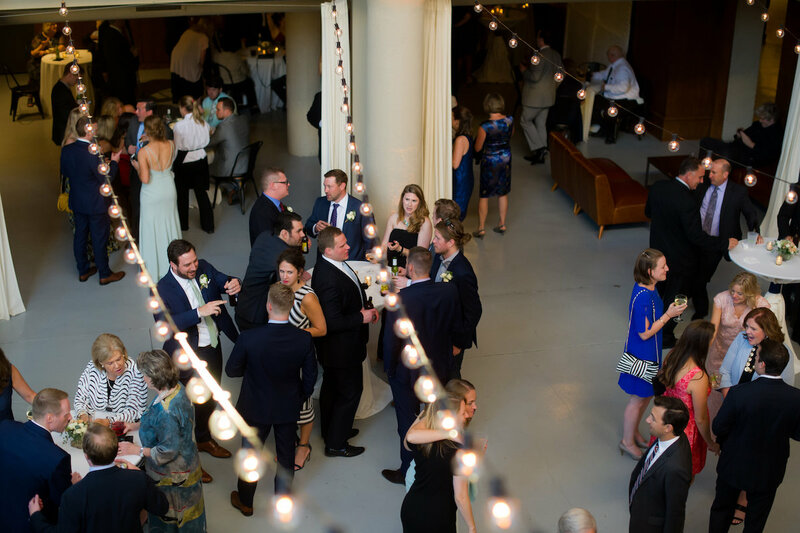 DJ Kyle from Greenline Talent set the tone for the transition from ceremony to cocktail hour, and guests were invited to head back inside to grab a drink, enjoy some of Limelight Catering’s delicious hors d’oeuvres, and explore the space. 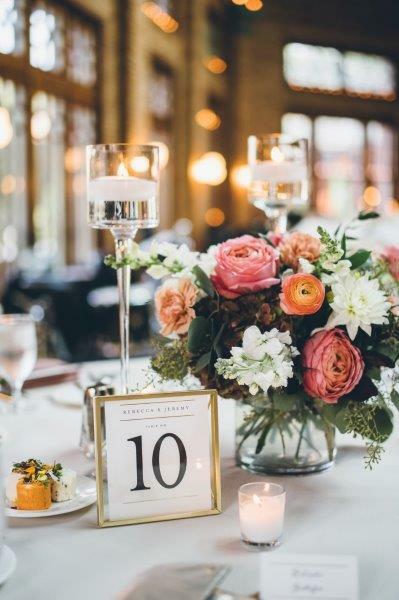 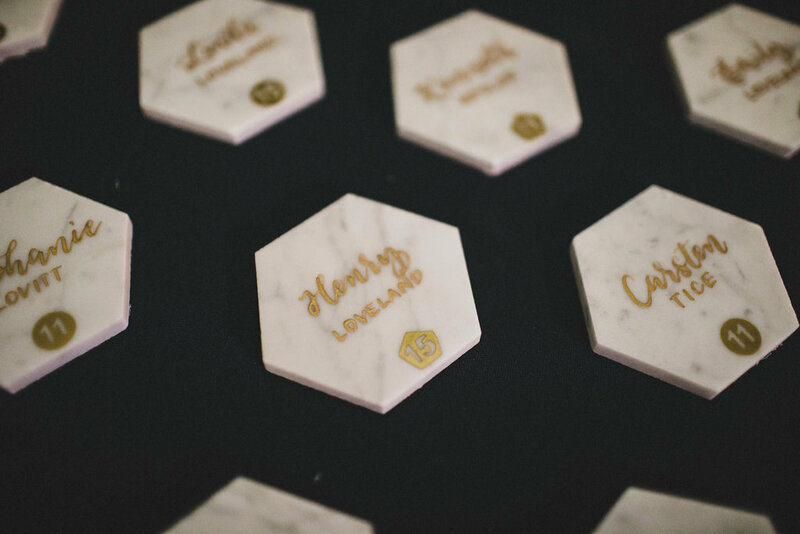 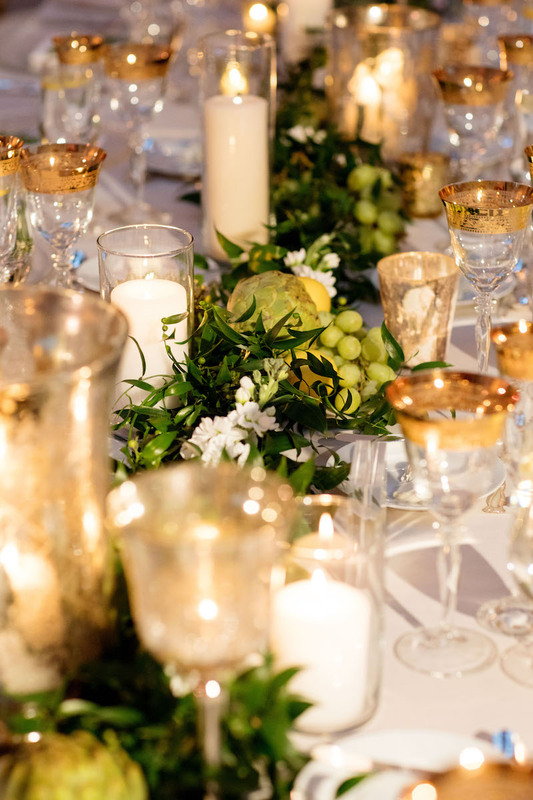 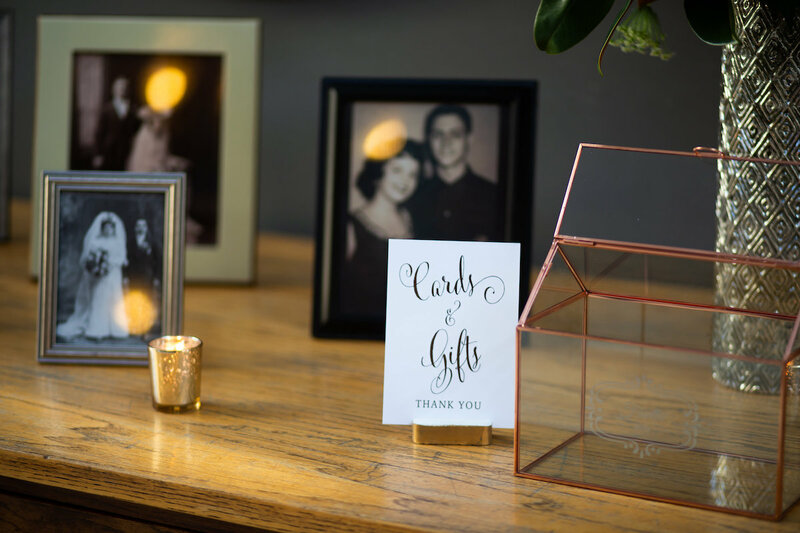 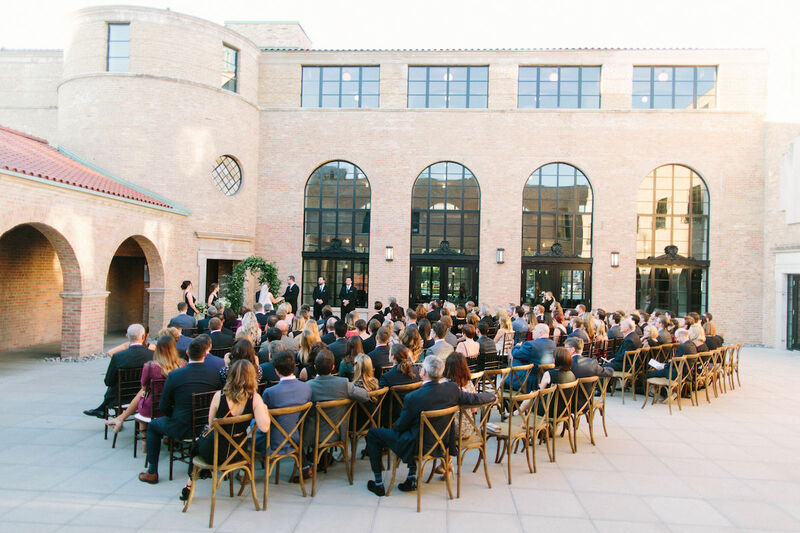 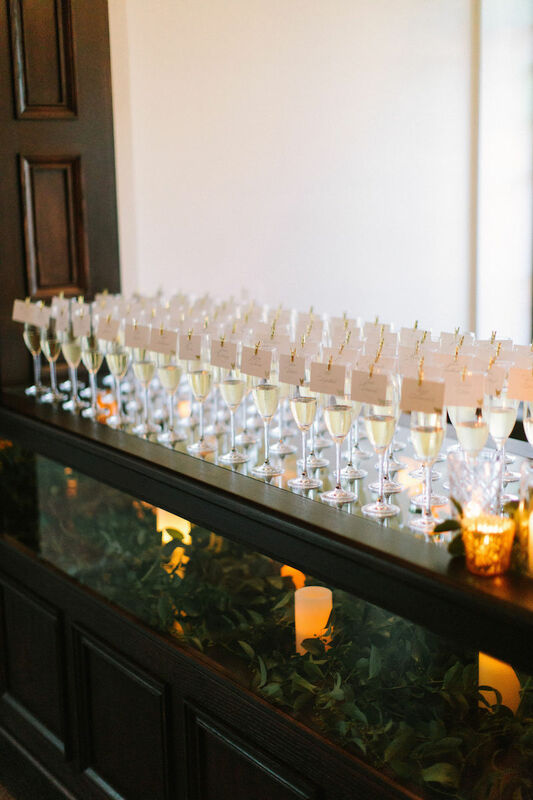 When it came time to move into the main reception space for dinner, we invited guests to find their place cards and a glass of champagne to take to their seats. 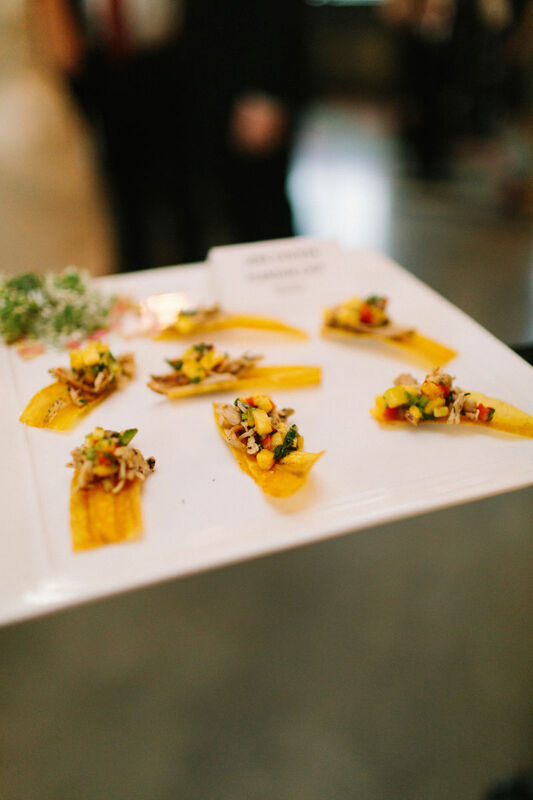 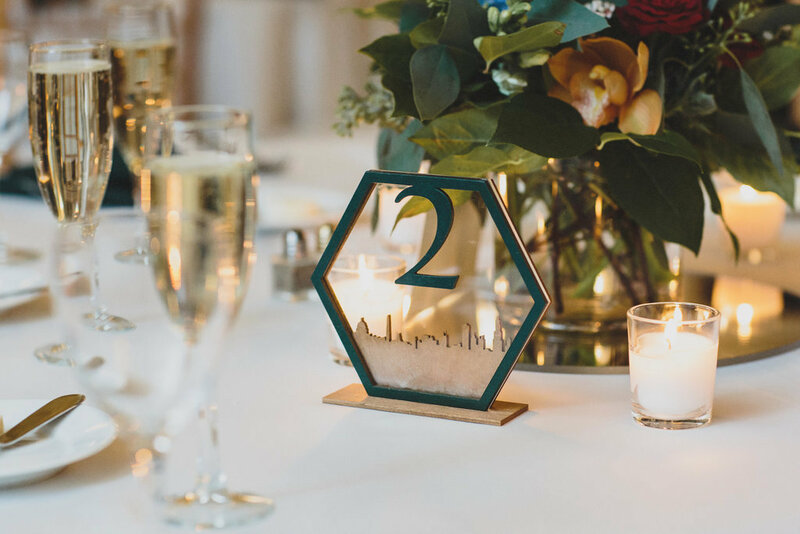 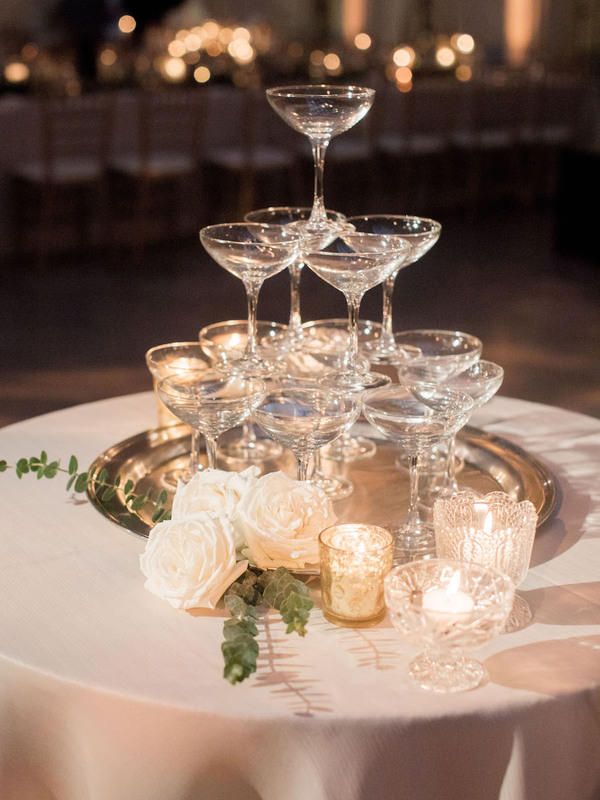 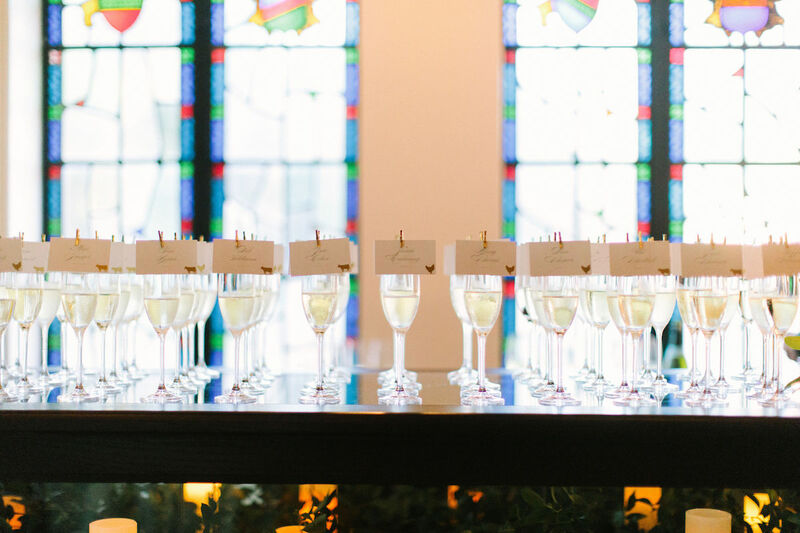 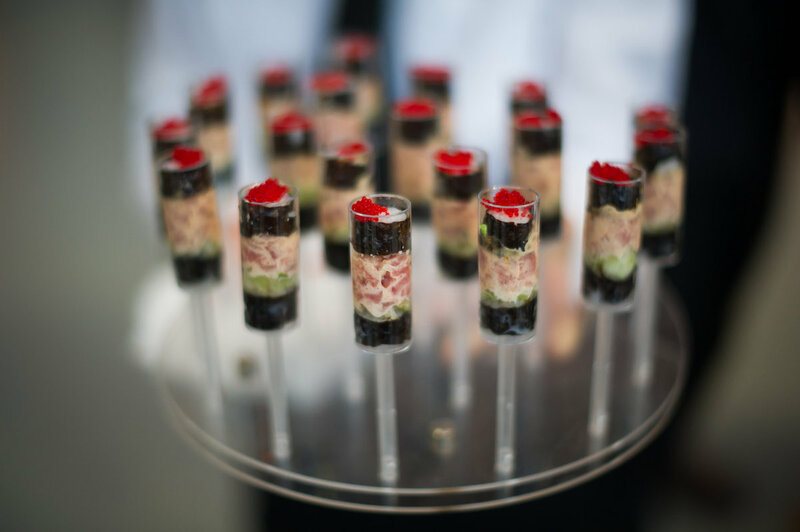 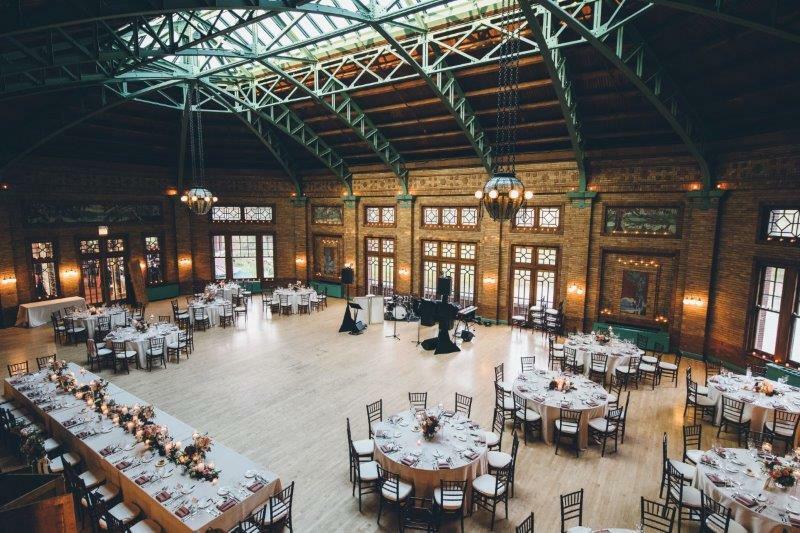 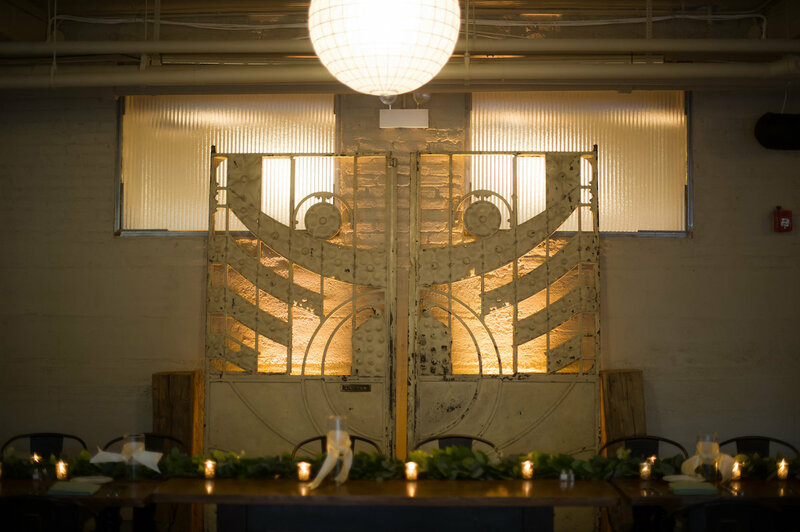 The champagne glasses were set on one of the many architecturally interesting elements at RMR: the glass display cases that can serve multiple purposes throughout your event! 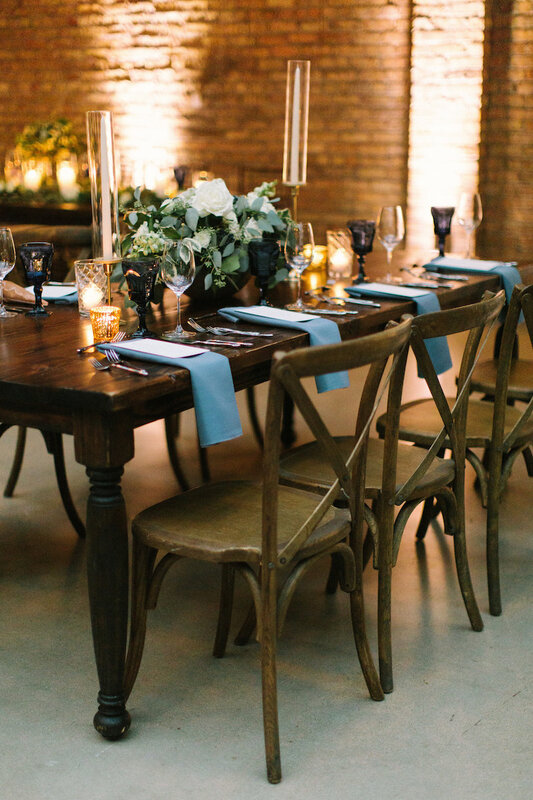 Dinner was a delight, from the table decor to the overall atmosphere in the room. 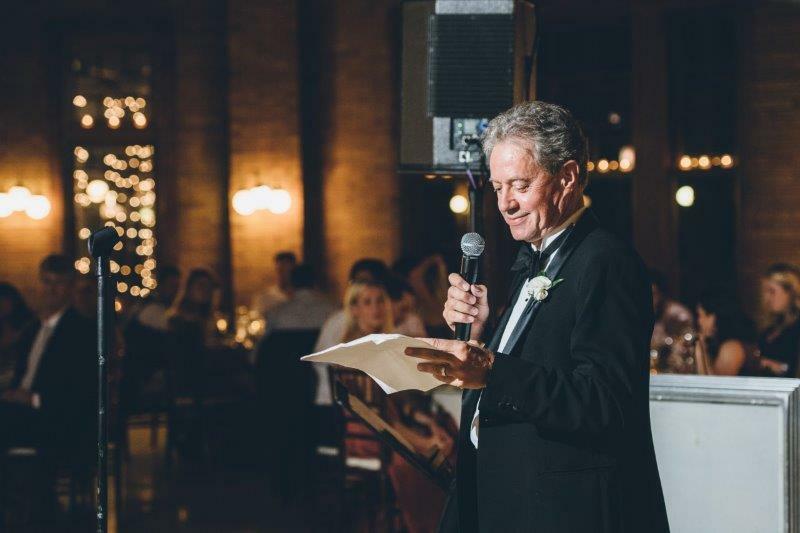 Things started off strong with a toast and a blessing from Allison’s father and Stephen’s father, respectively. 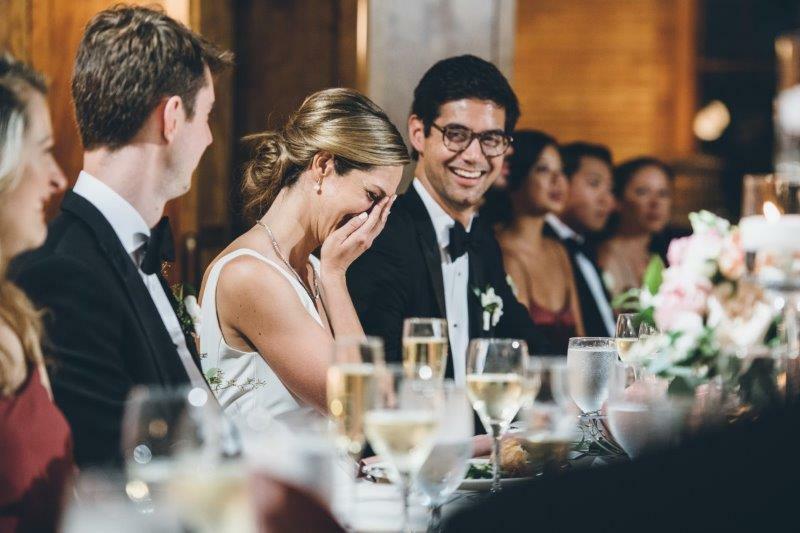 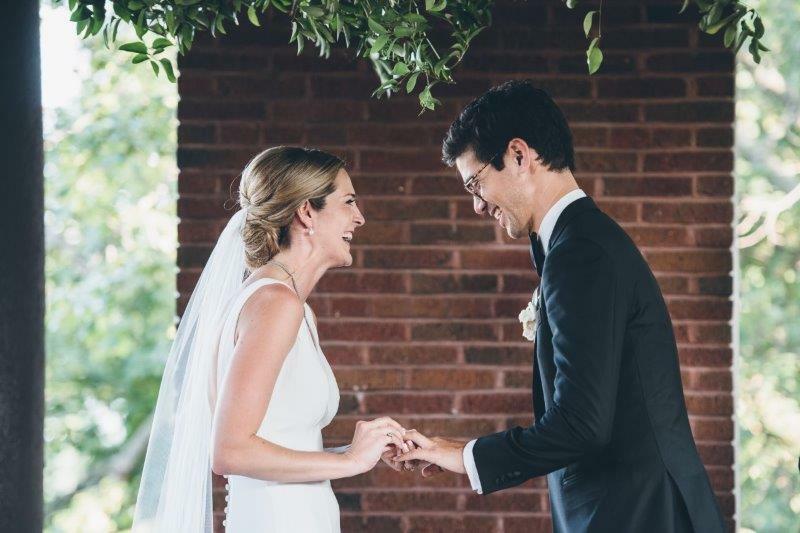 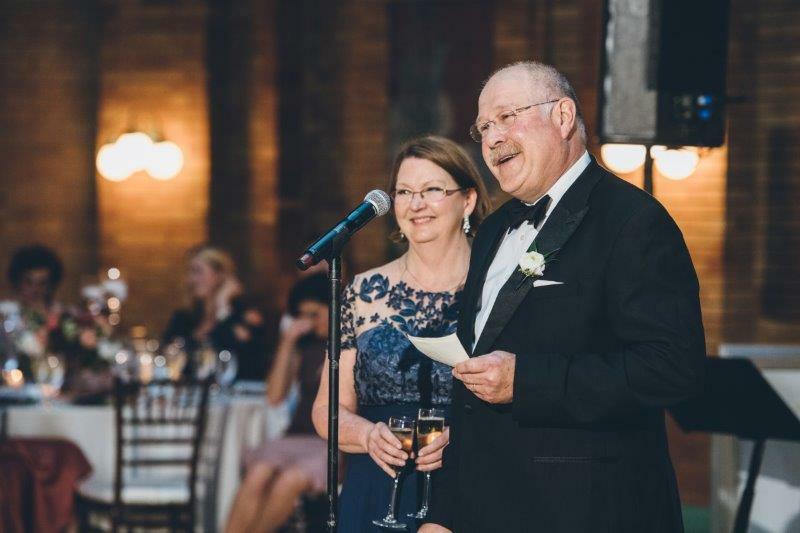 Allison’s sister and Stephen’s brother brought lots of laughs with their toasts, and it was clear that this was truly a blending of two families who loved this couple immensely. 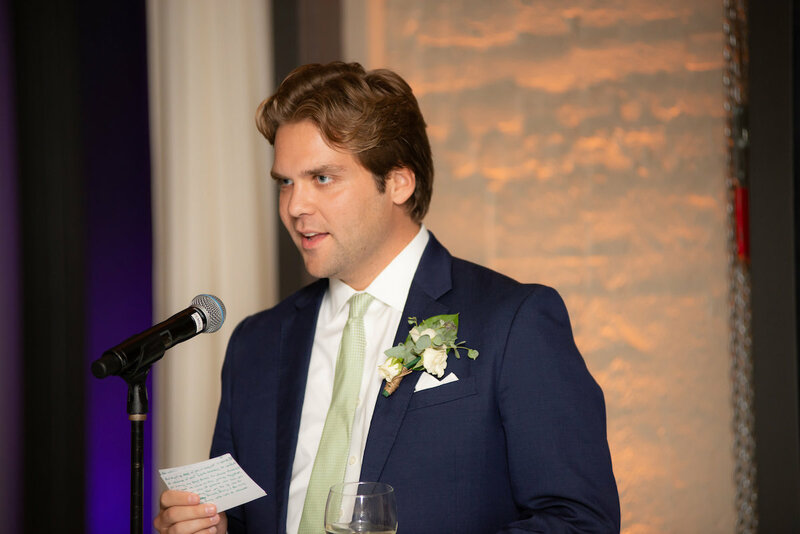 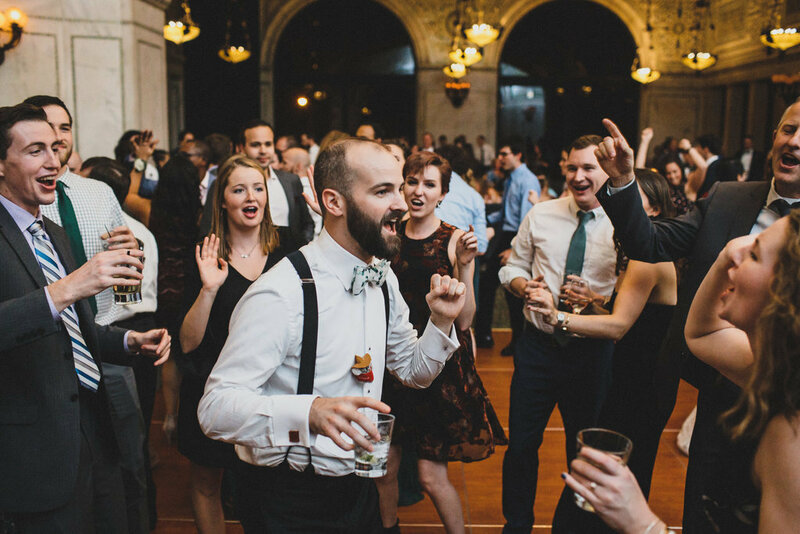 Stephen rounded things out with a great toast of his own, and soon it was time to party! 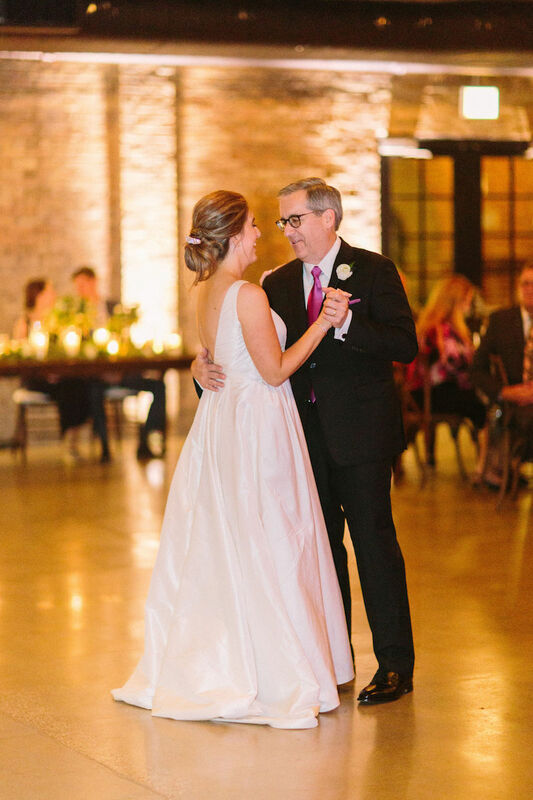 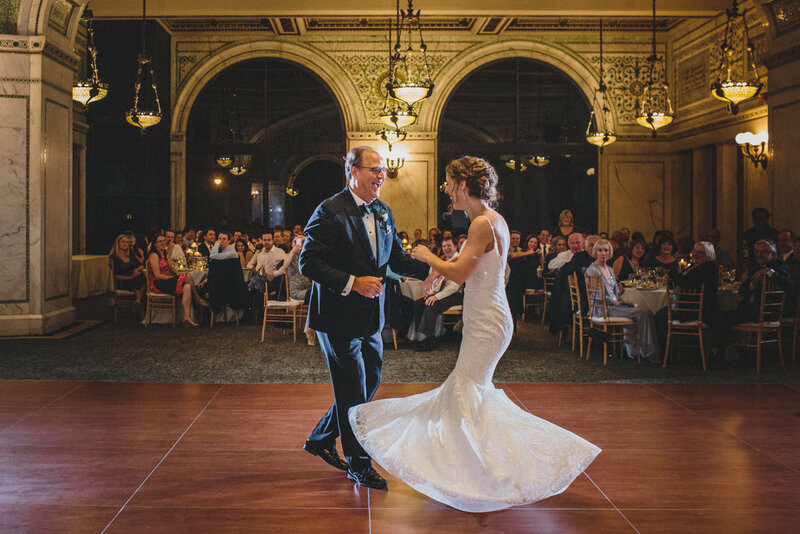 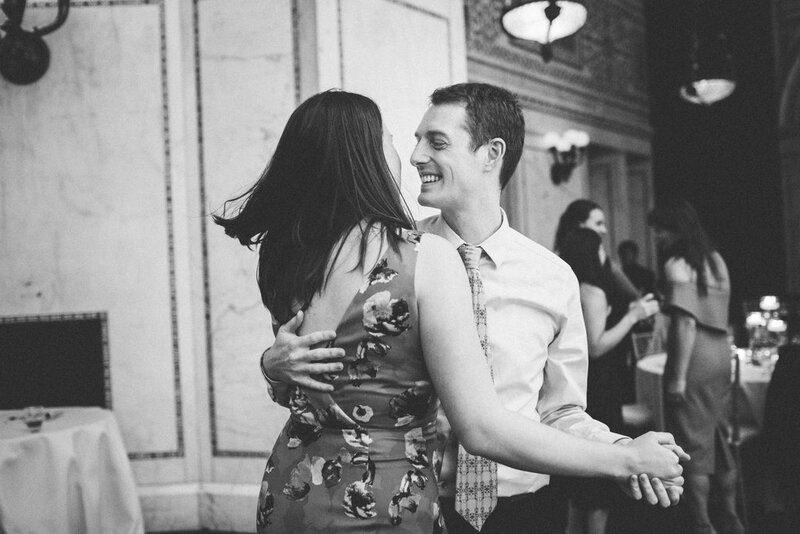 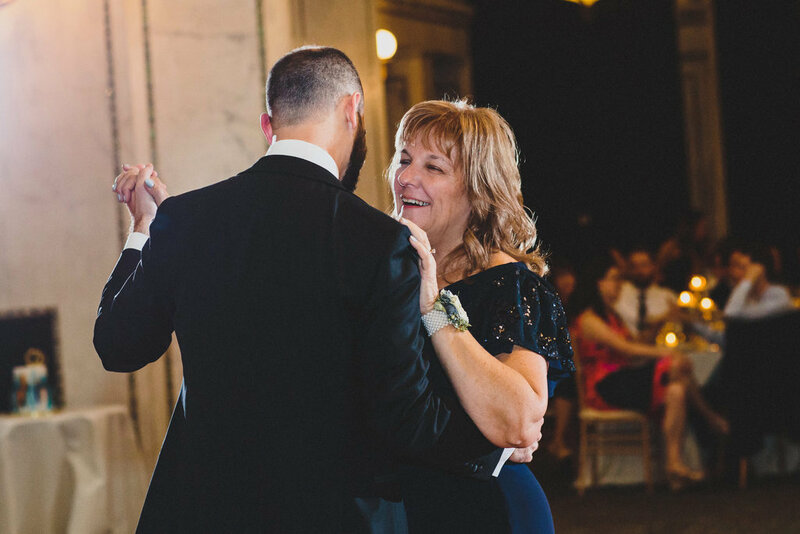 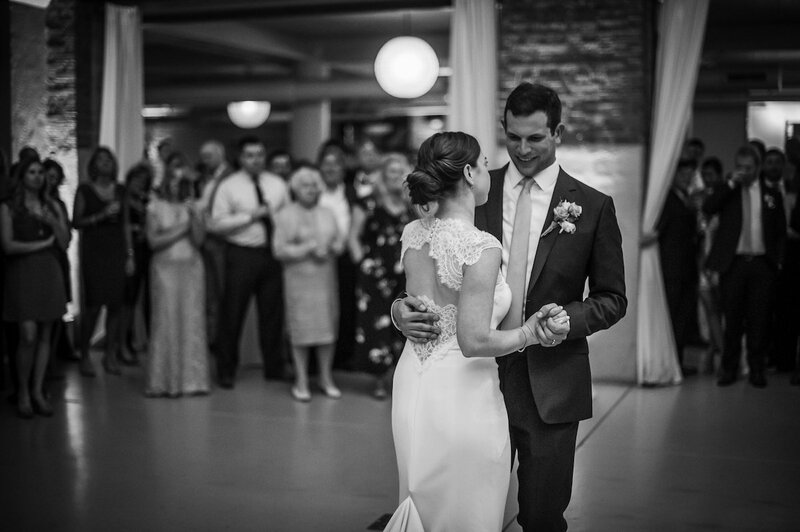 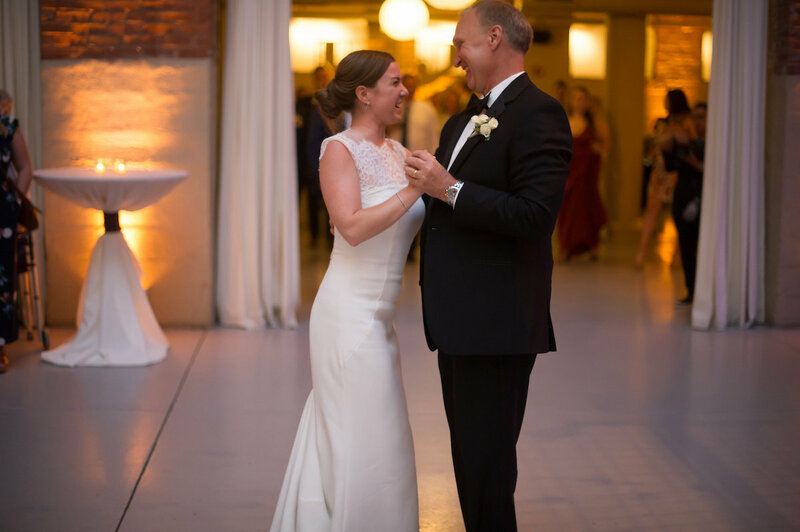 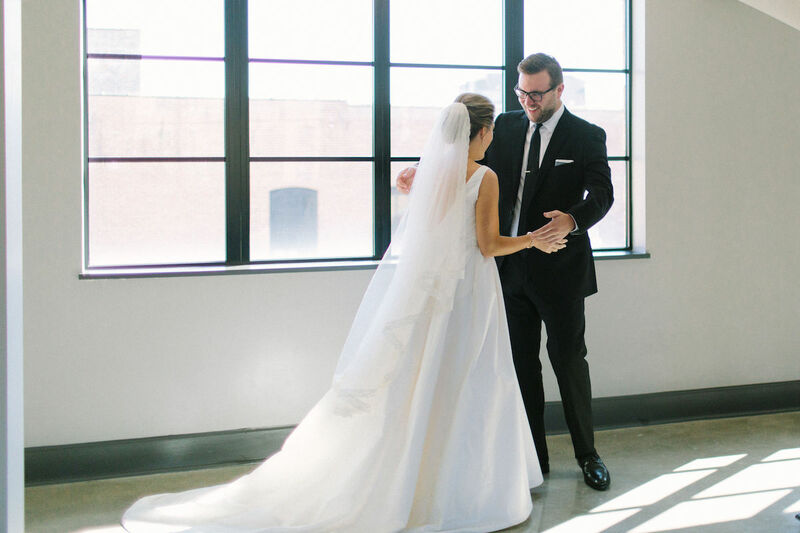 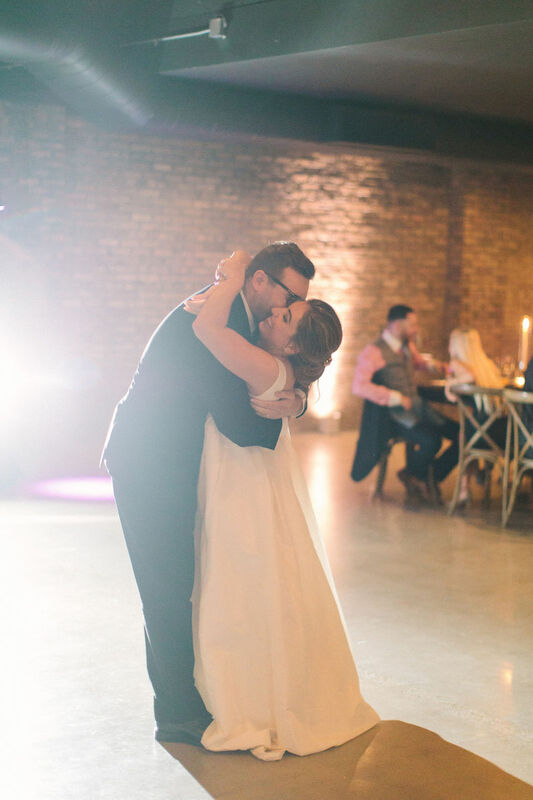 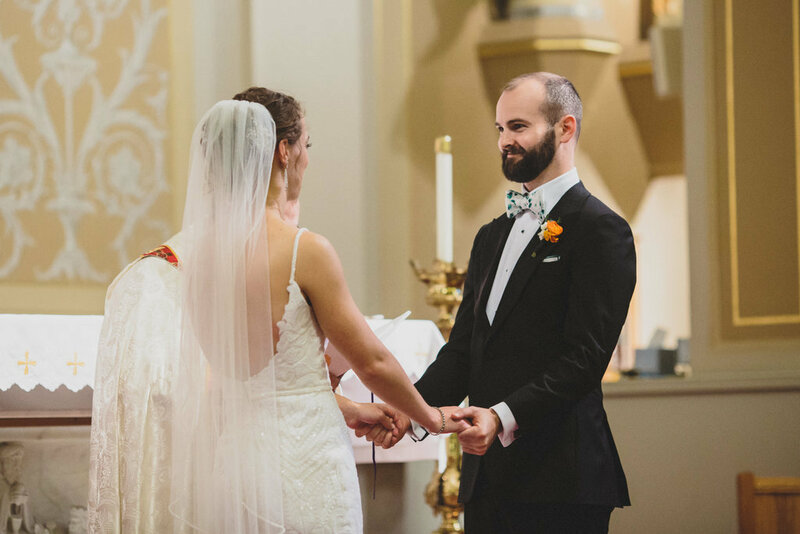 Before everyone could join the happy couple on the dance floor, Stephen and Allison each shared a dance with some of the most special people in their lives. 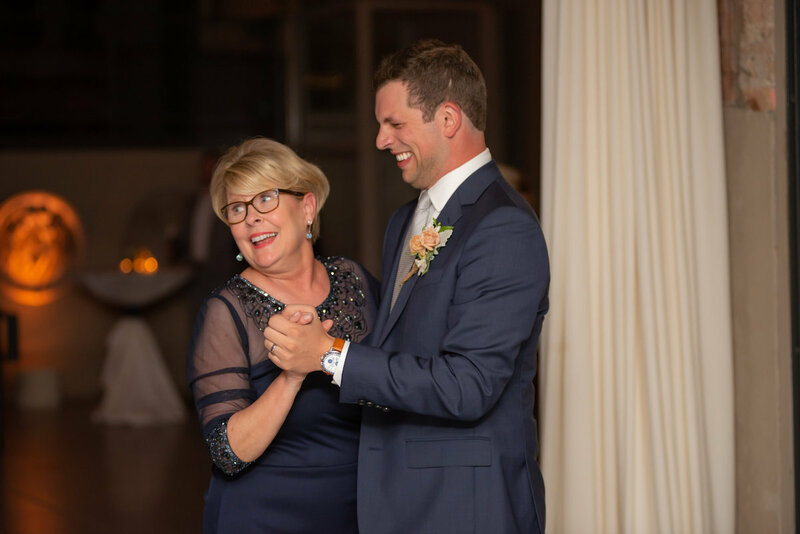 Stephen and his mother and Allison and her father took turns relishing in their special moments, then opened things up to the rest of the guests. 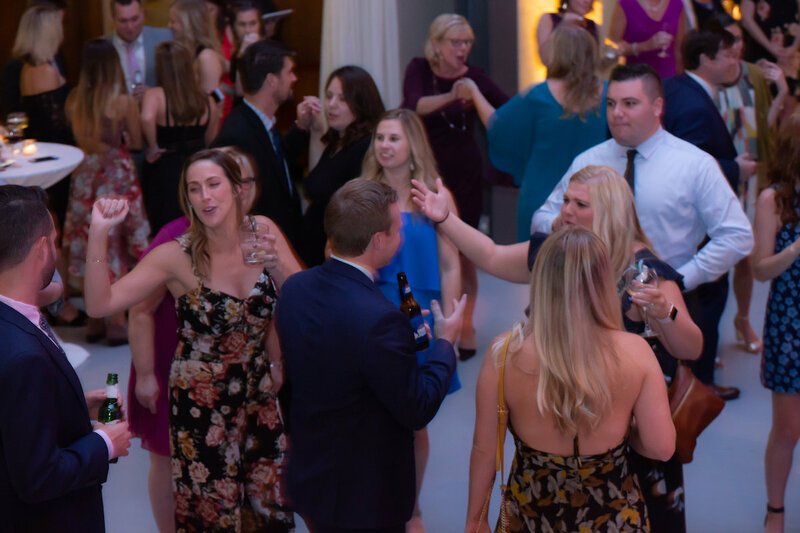 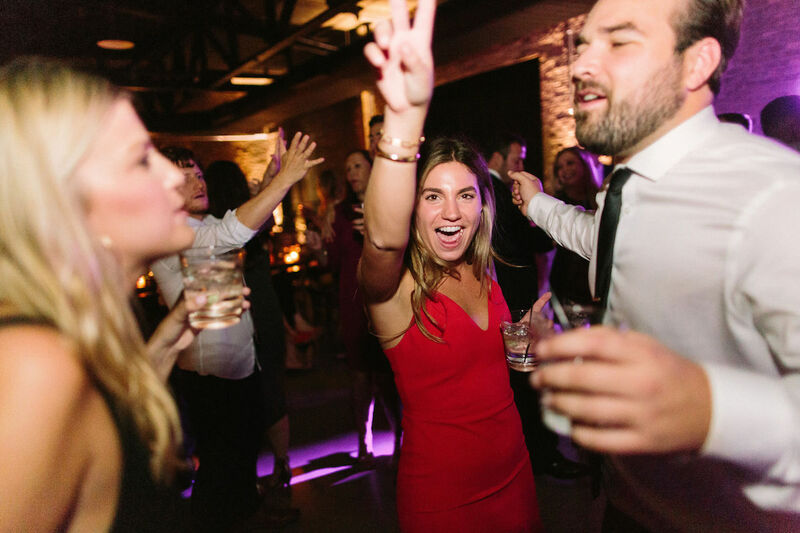 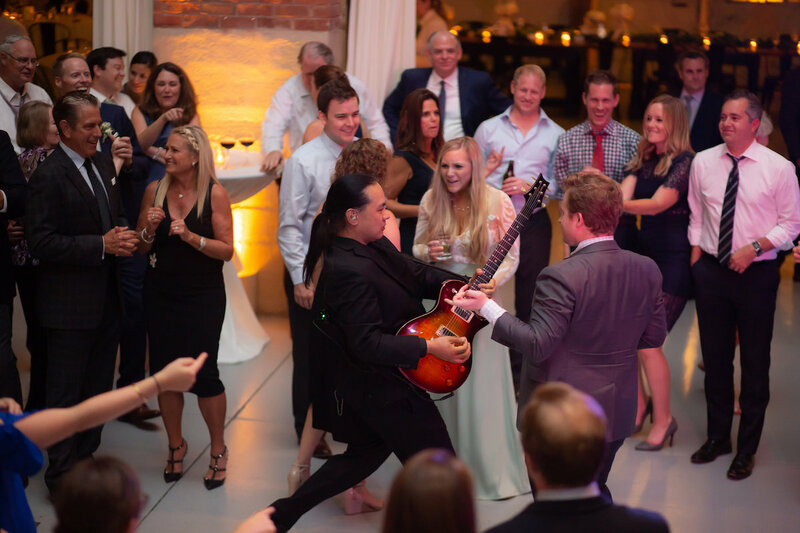 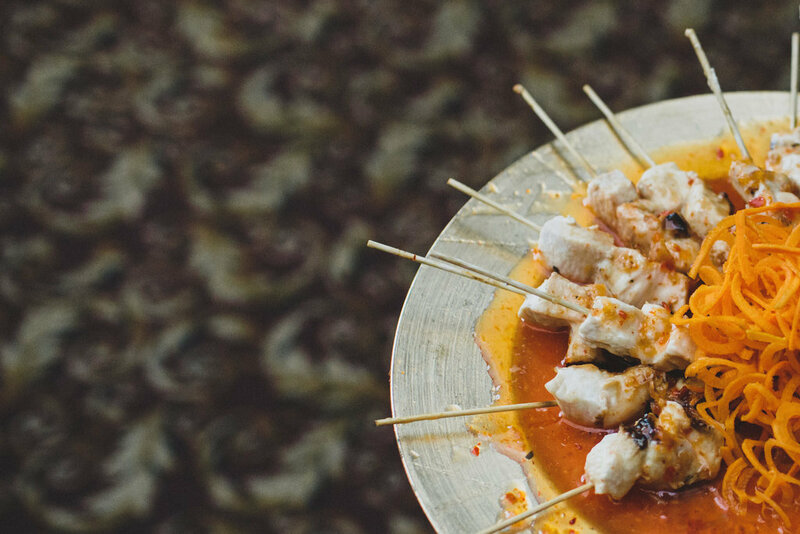 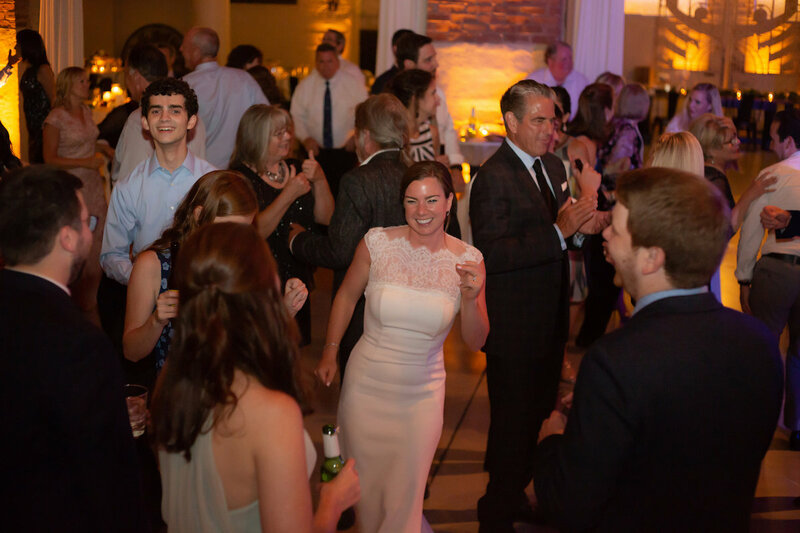 The dance floor was lively all night long, and guests had a hard time pulling themselves away even to grab a bite of dessert or Sriracha honey fried chicken slider. 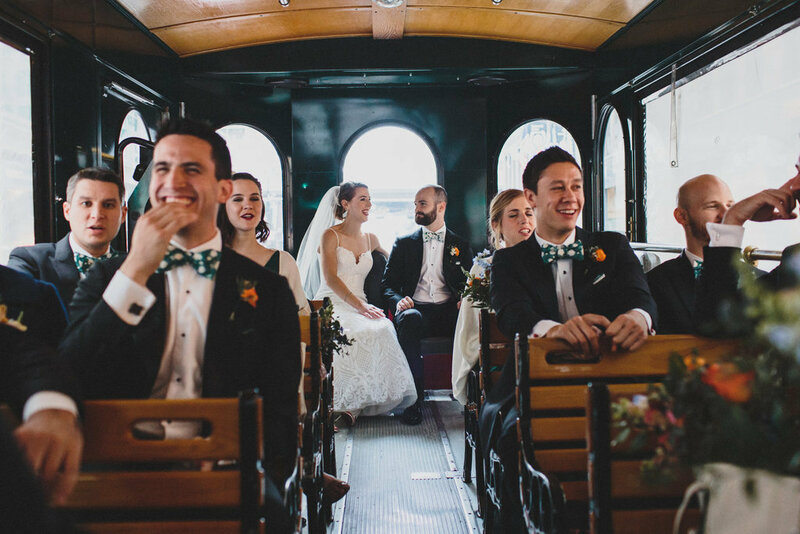 When the evening started to draw to a close, guests made their way onto the buses back to the hotels. 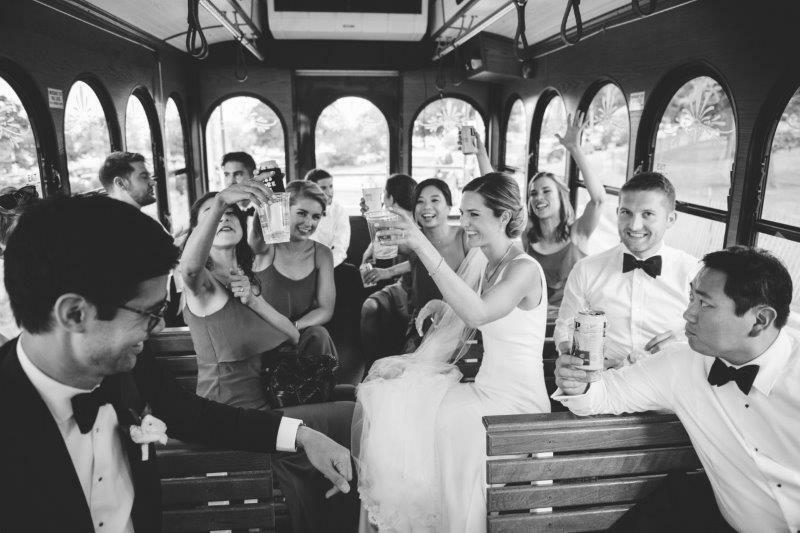 They were invited to grab a deck of Uno cards on the way out, courtesy of Allison and Stephen!